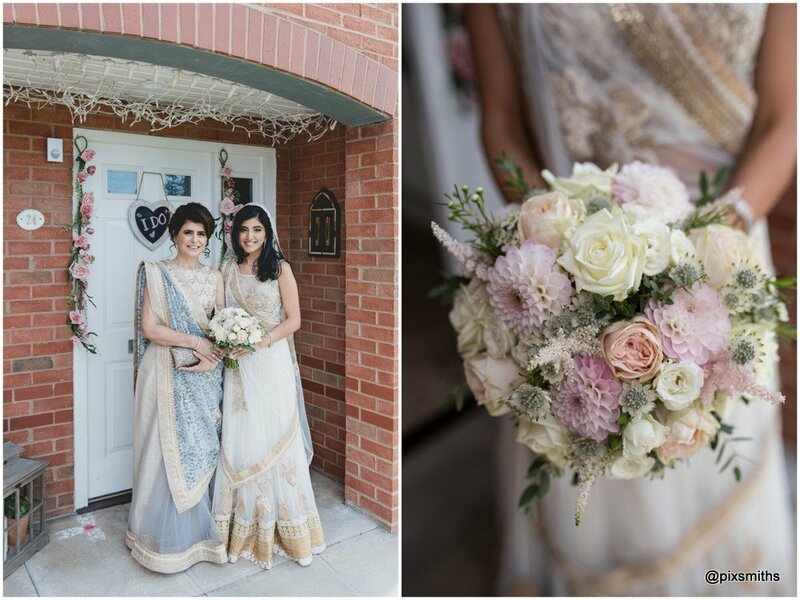 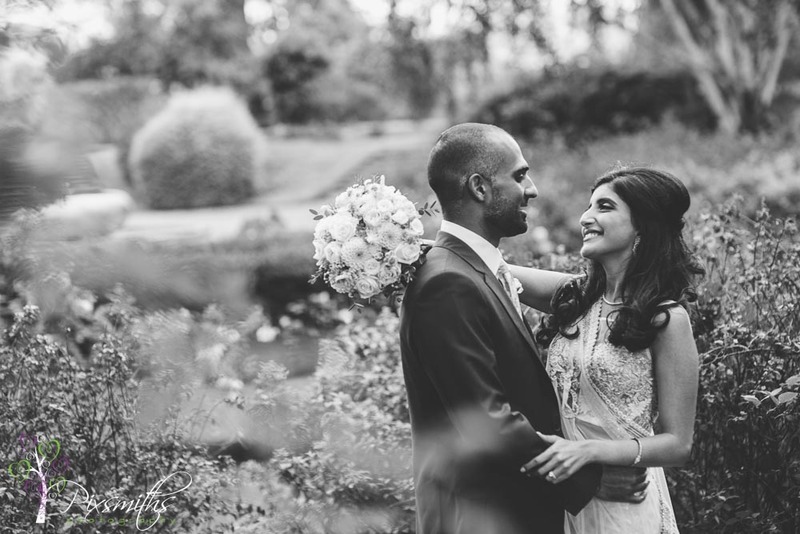 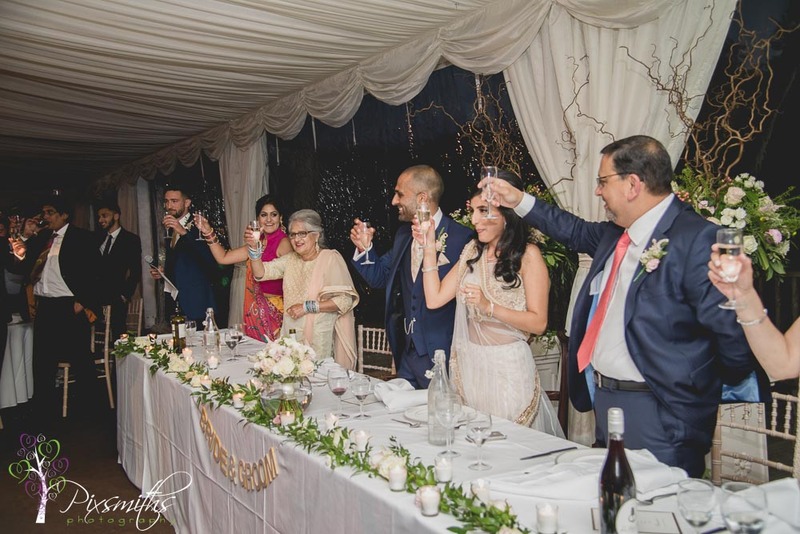 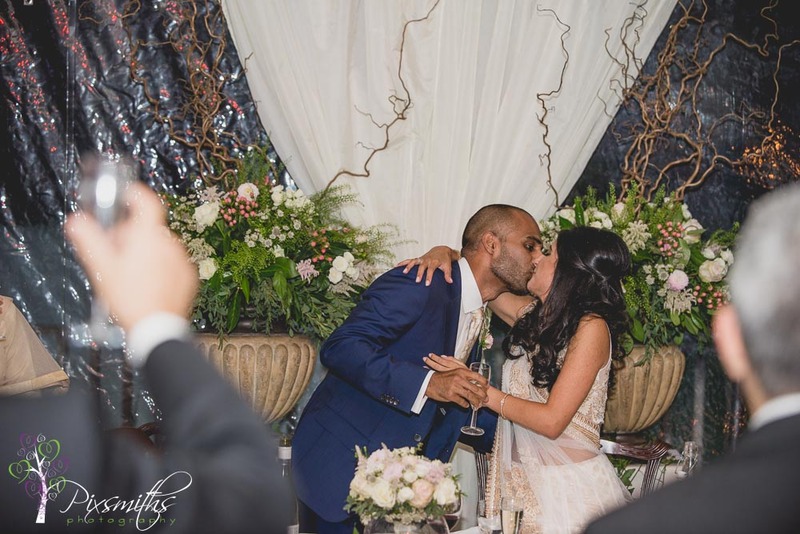 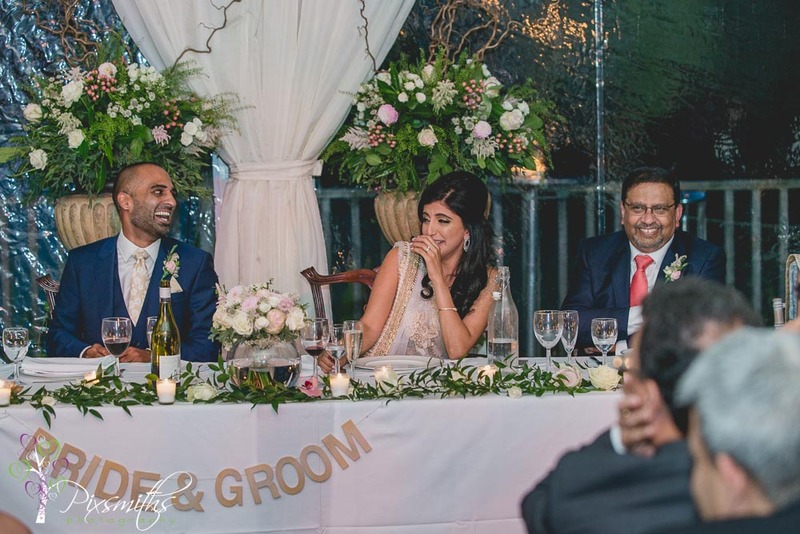 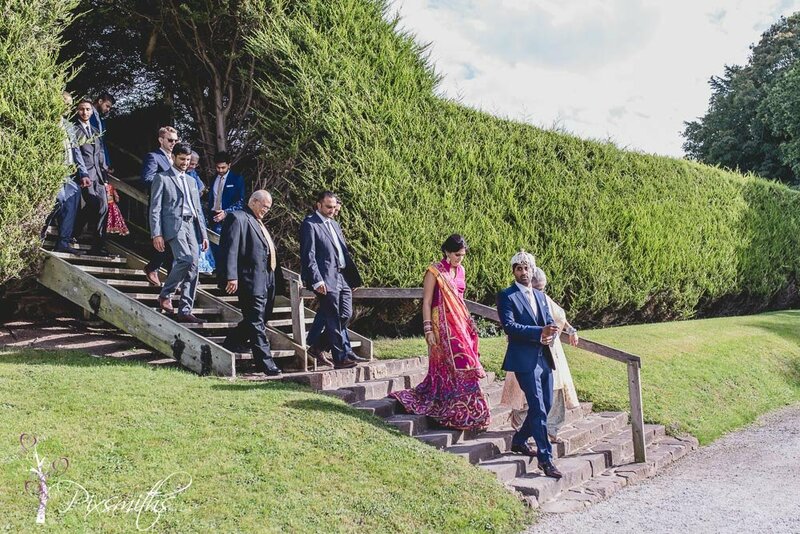 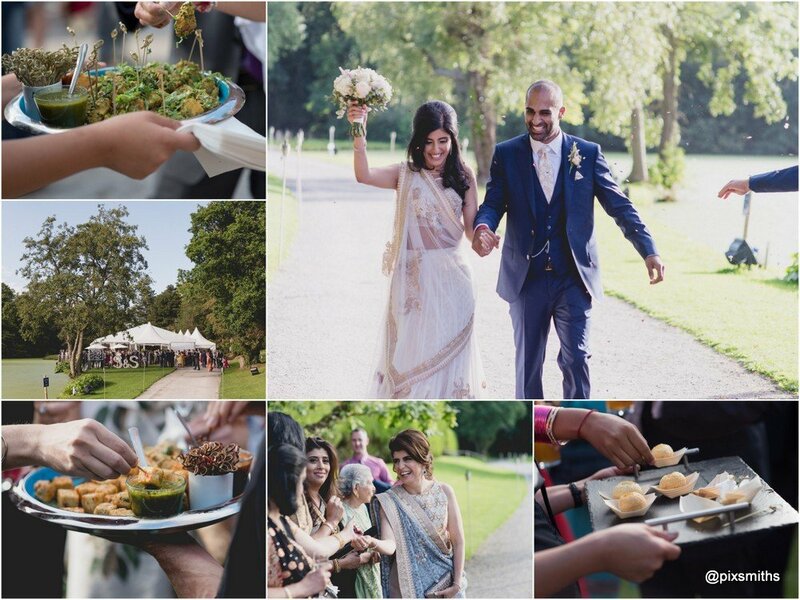 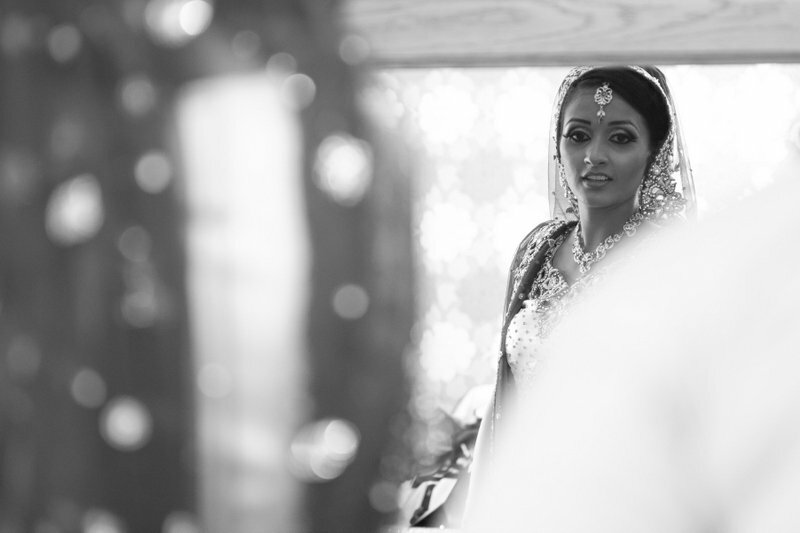 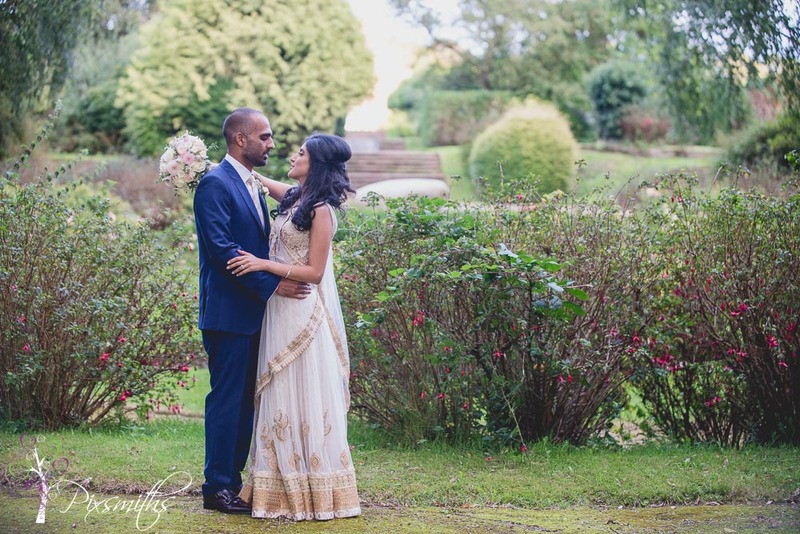 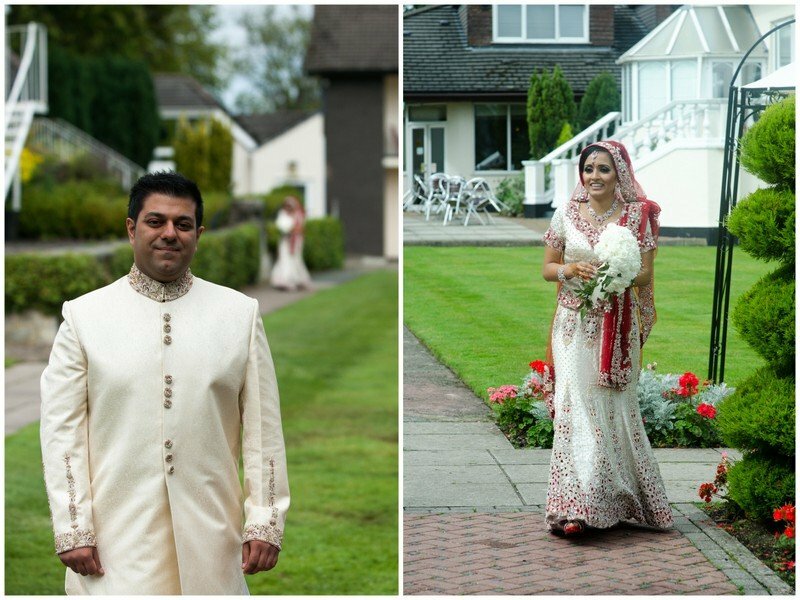 We love a challenge so we were delighted to have the privilege of documenting Sanaya and Satal’s fusion Asian wedding at Thornton Manor. 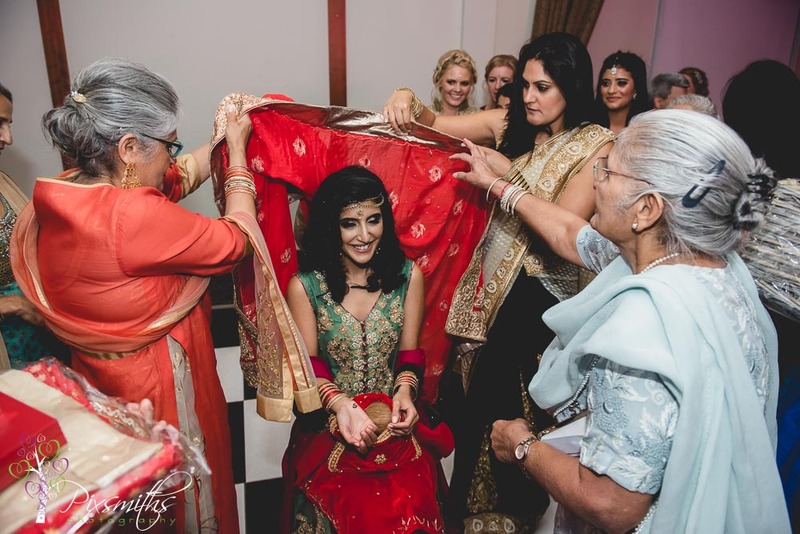 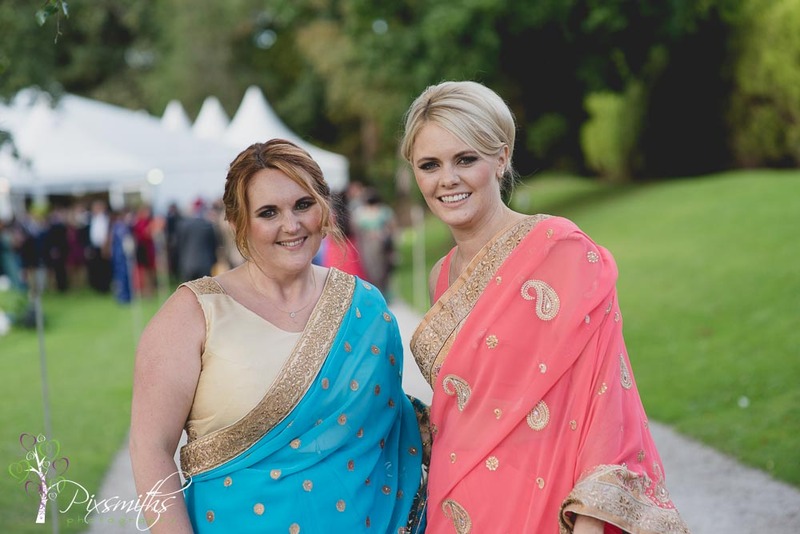 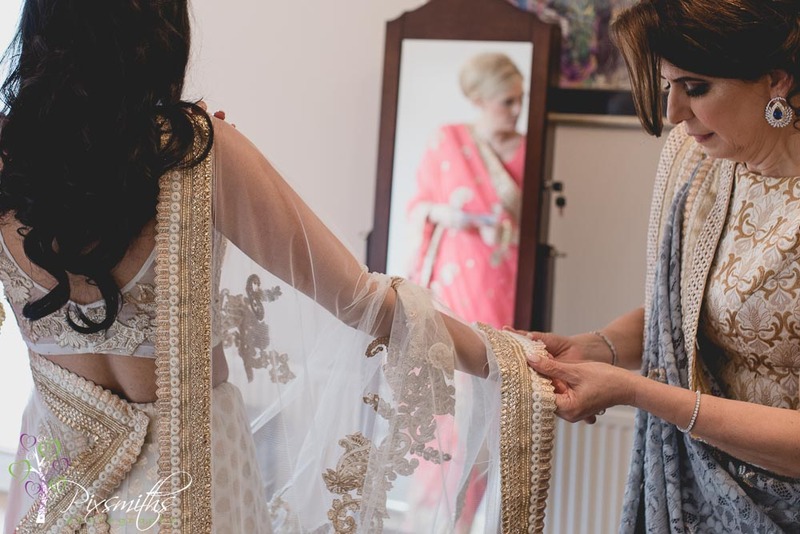 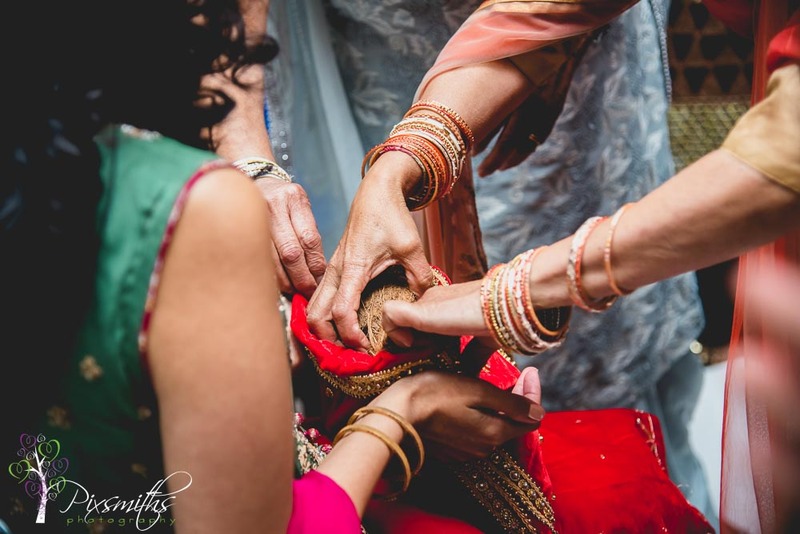 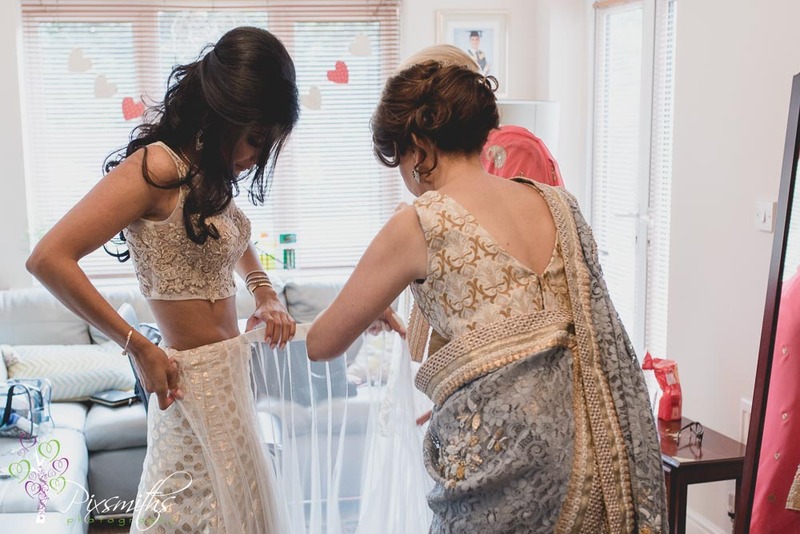 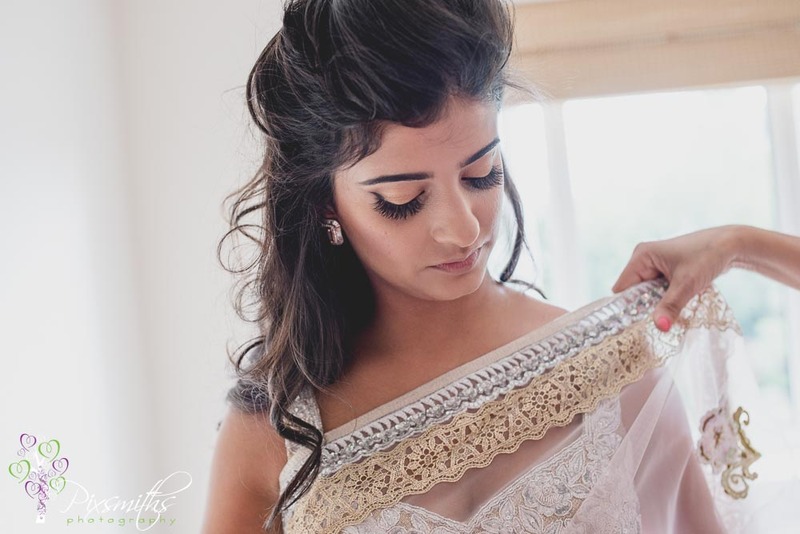 Bridal preps at home first – again how to take a shot of a Sari, bit different from a dress hanging up! 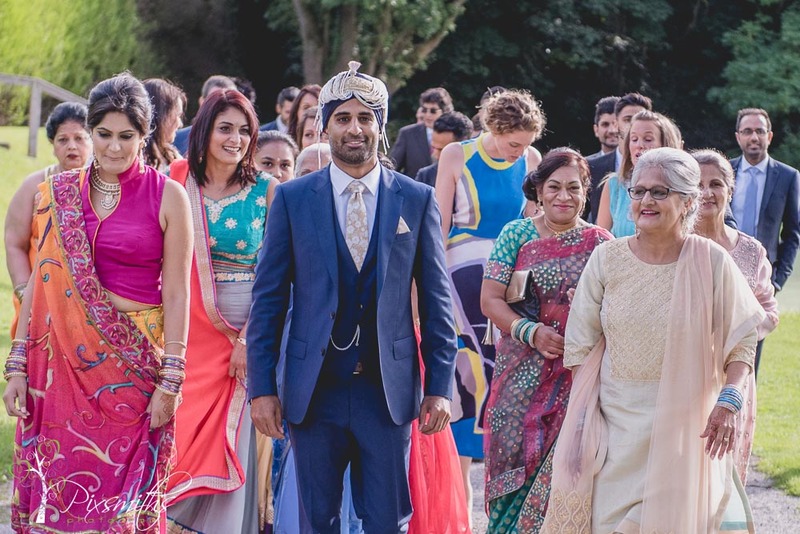 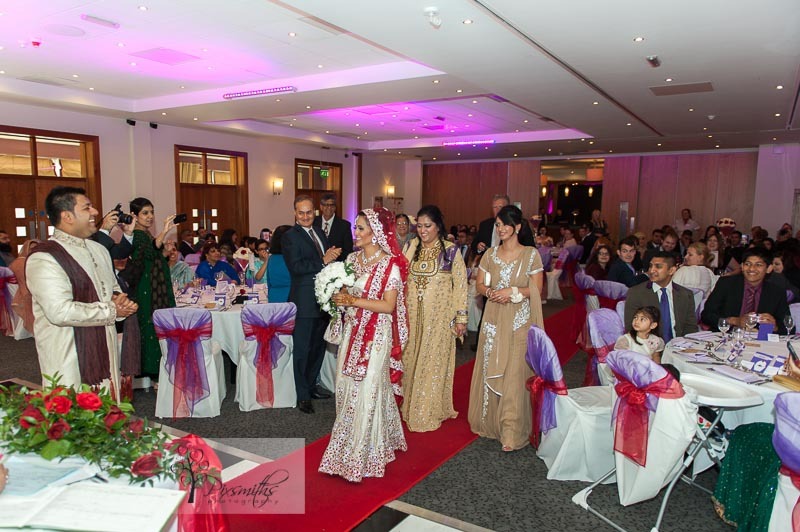 The Groom arriving with his family and then beign greeted by Sanya’s mum to welcome him. 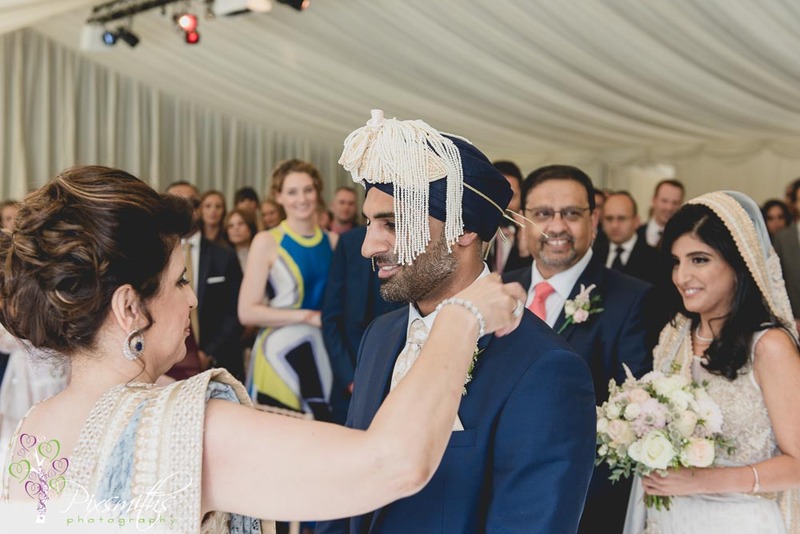 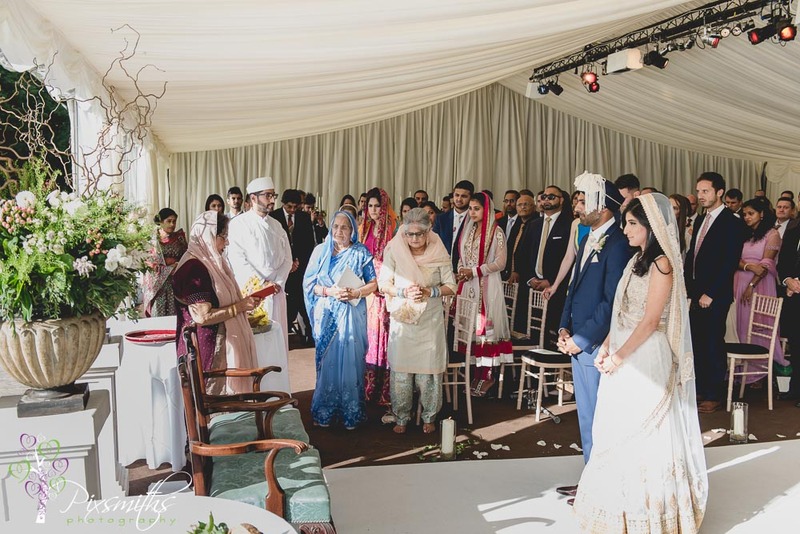 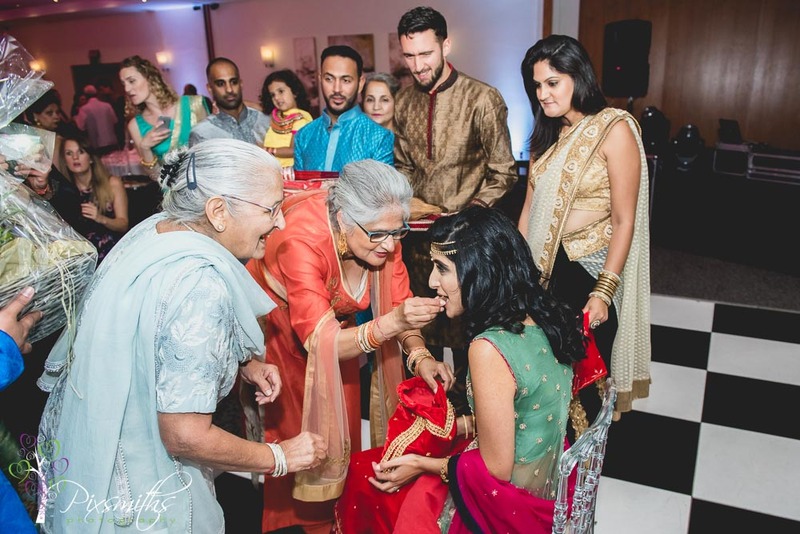 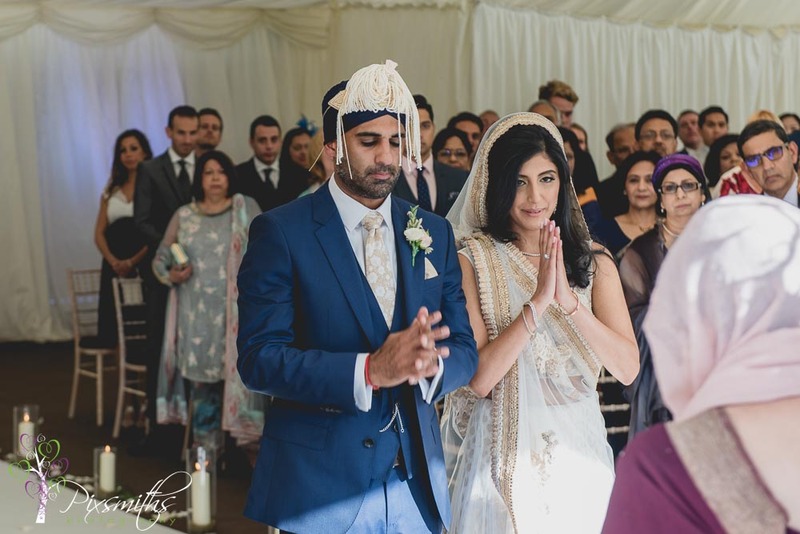 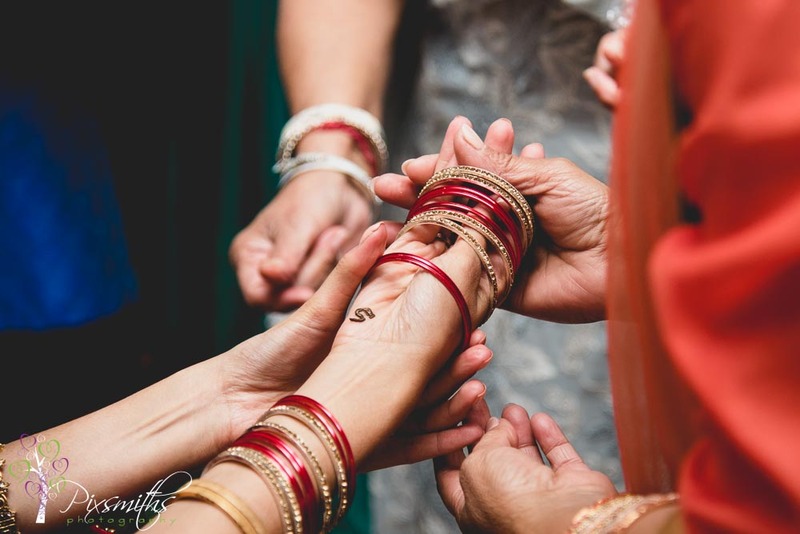 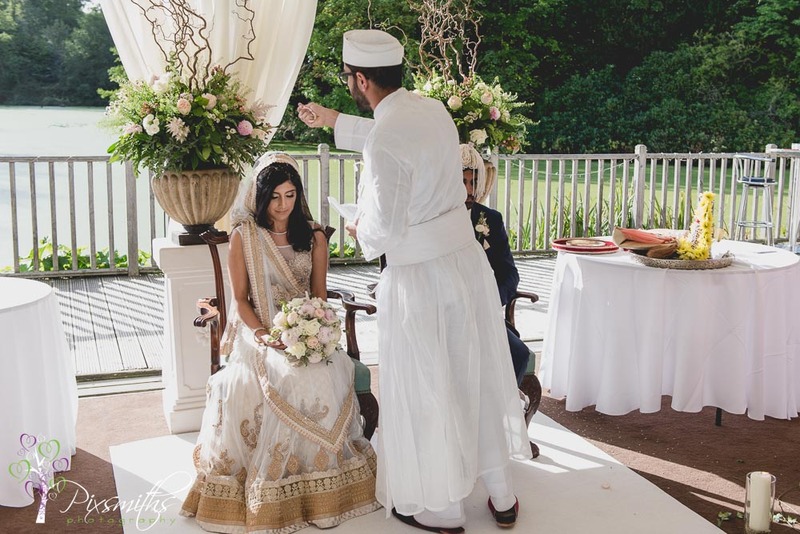 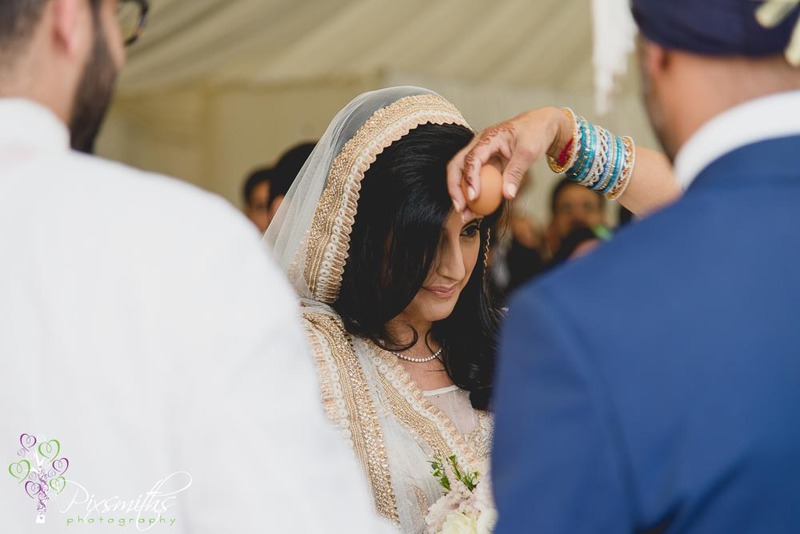 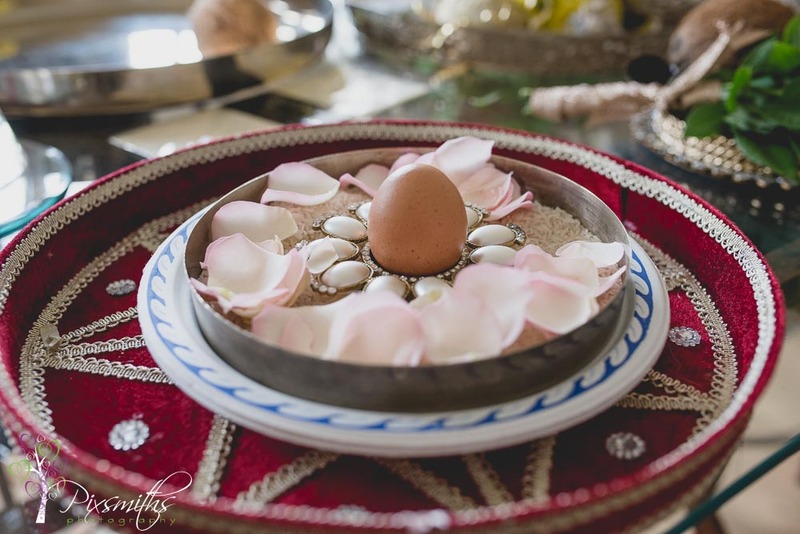 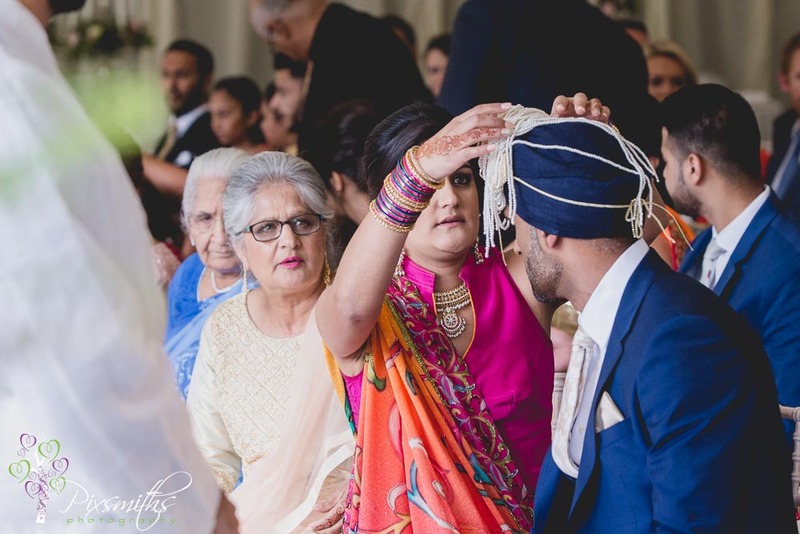 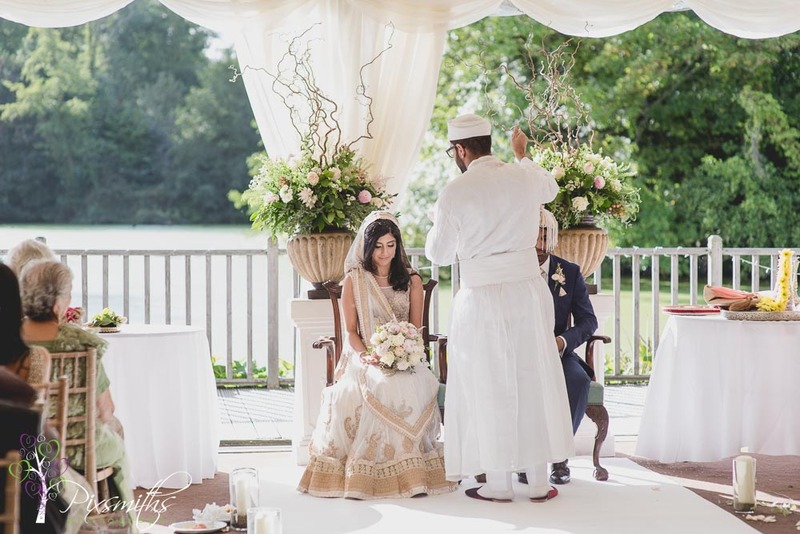 A fusion of Sikh and Zoroastrian involved special blessing ceremonies as bride and groom are greeted by their husband’s to be family members. 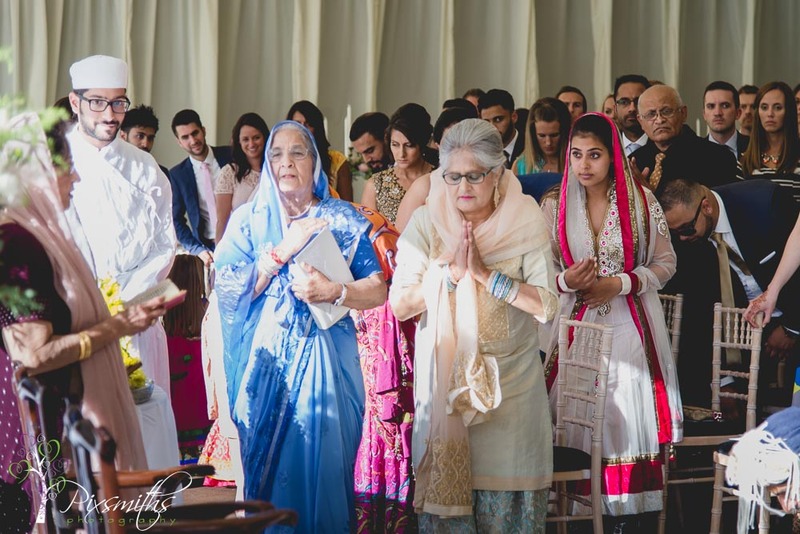 Rose petals, rice and coconuts were all part of the ceremony during the payers read by Satal’s aunt and the priest. 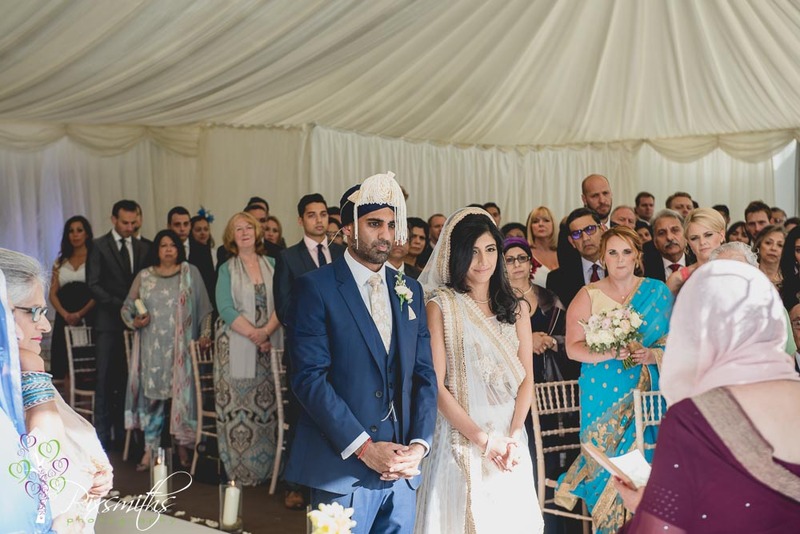 A new challenge for the ceremony as the priest faces the couple who are facing the congregation. 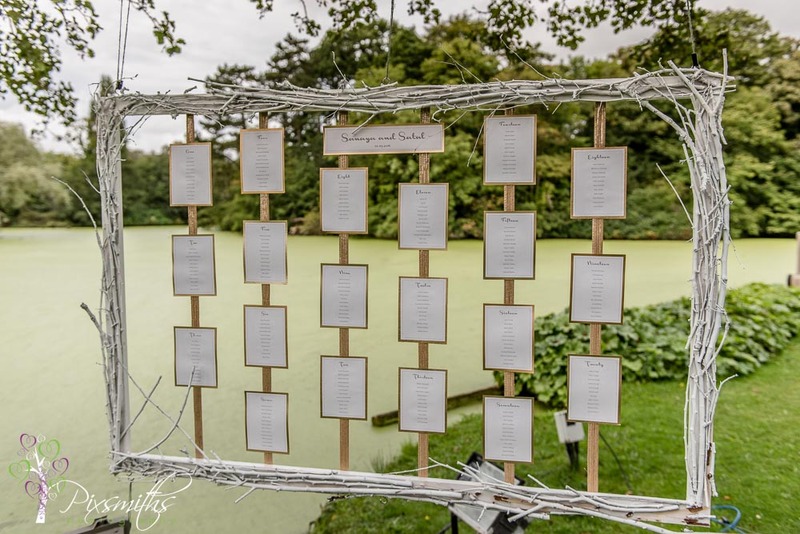 A unique seating plan – creatively made by Satal’s mother using wood from fruit trees from her garden. 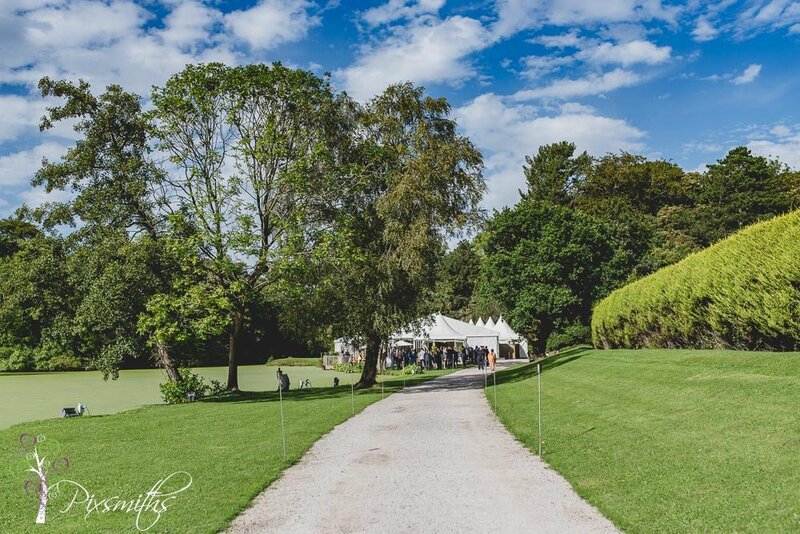 It made a beautiful statement hanging from the large tree on the lakeside near the marquee at Thornton Manor. 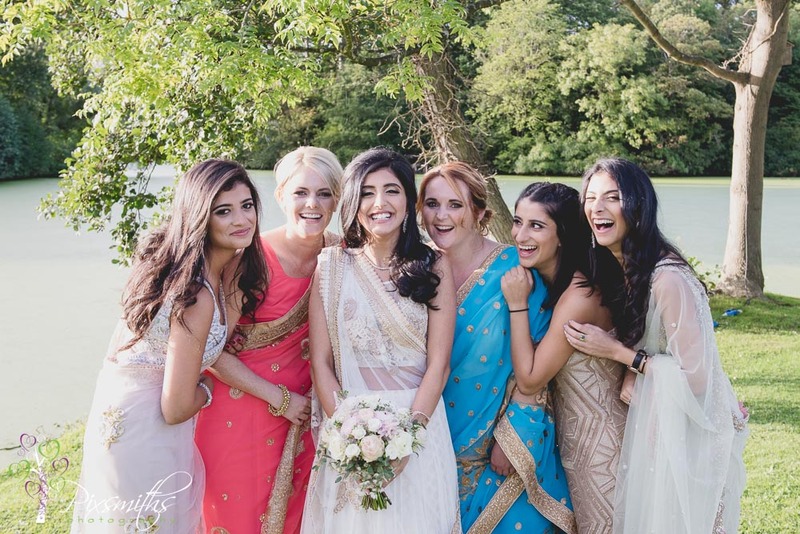 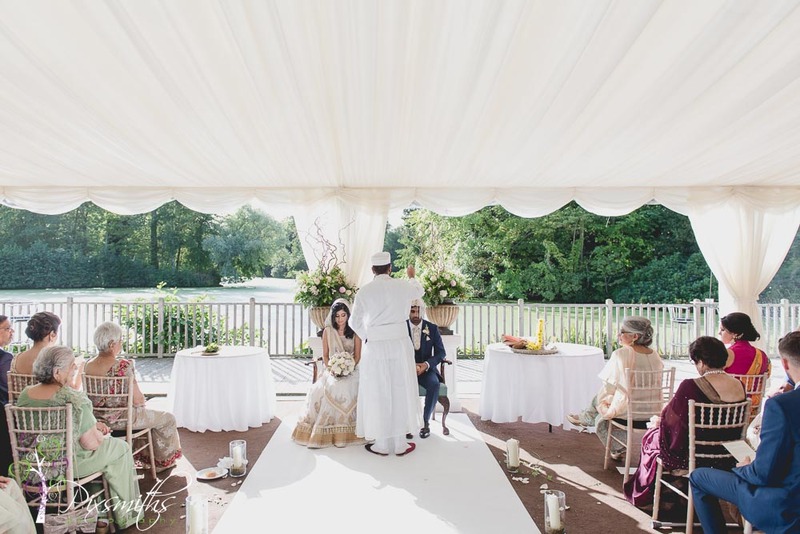 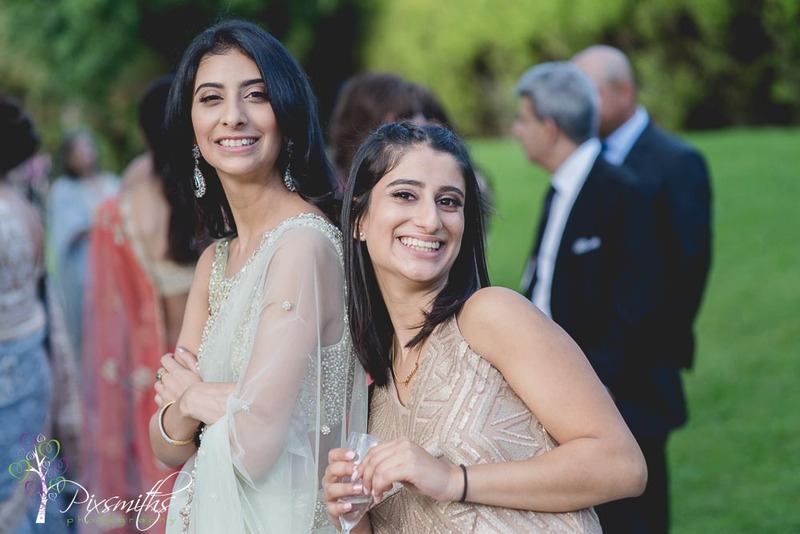 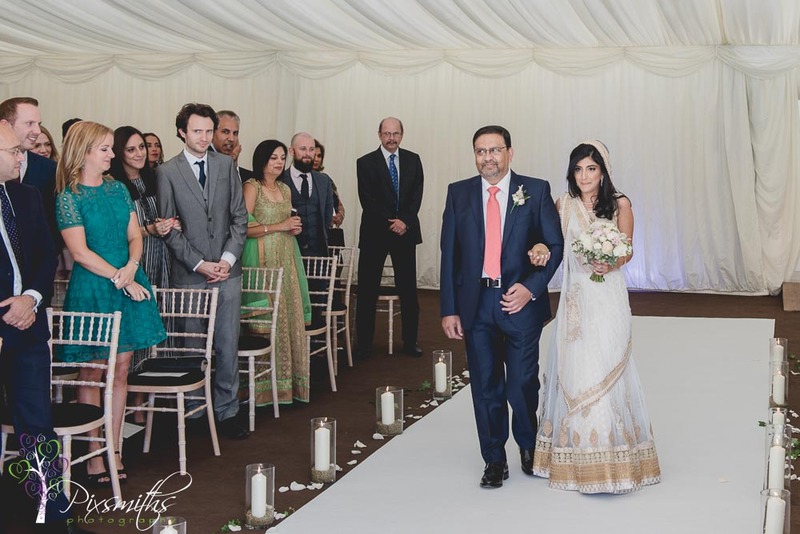 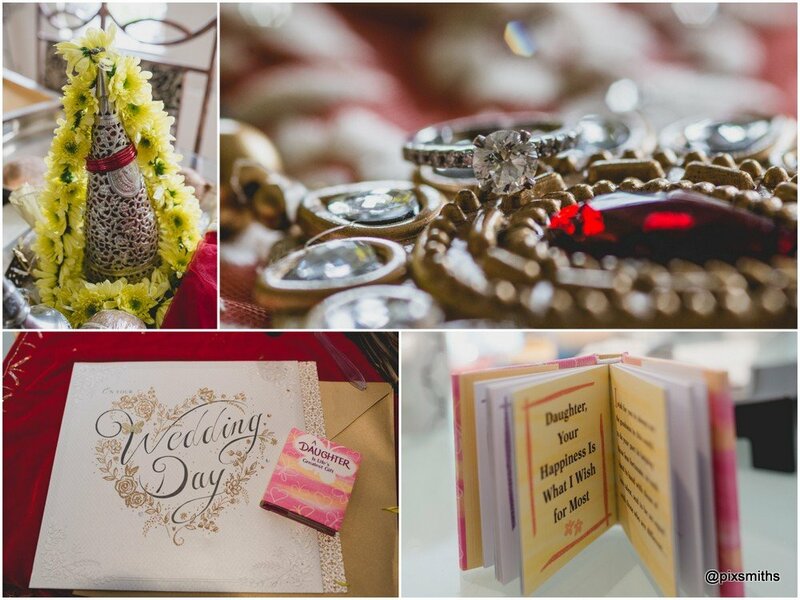 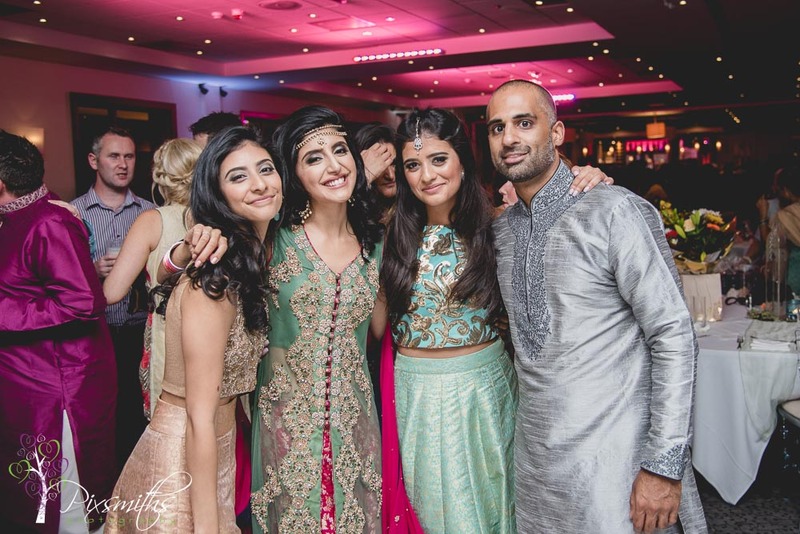 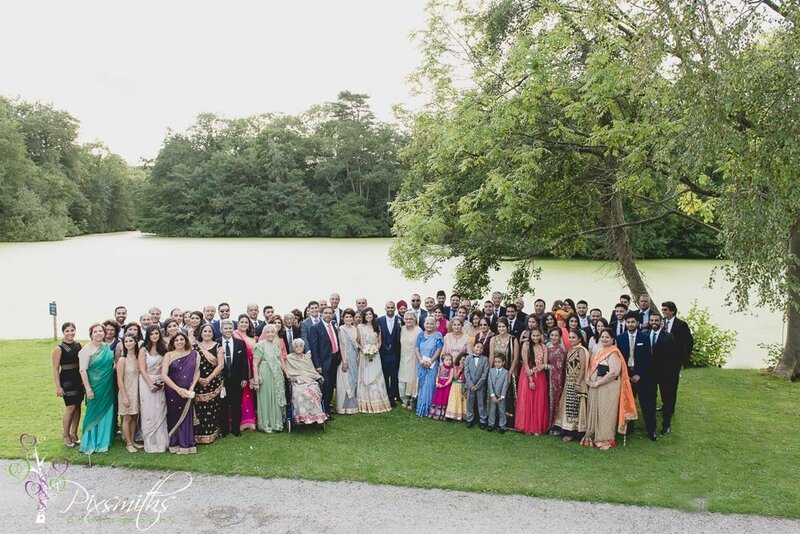 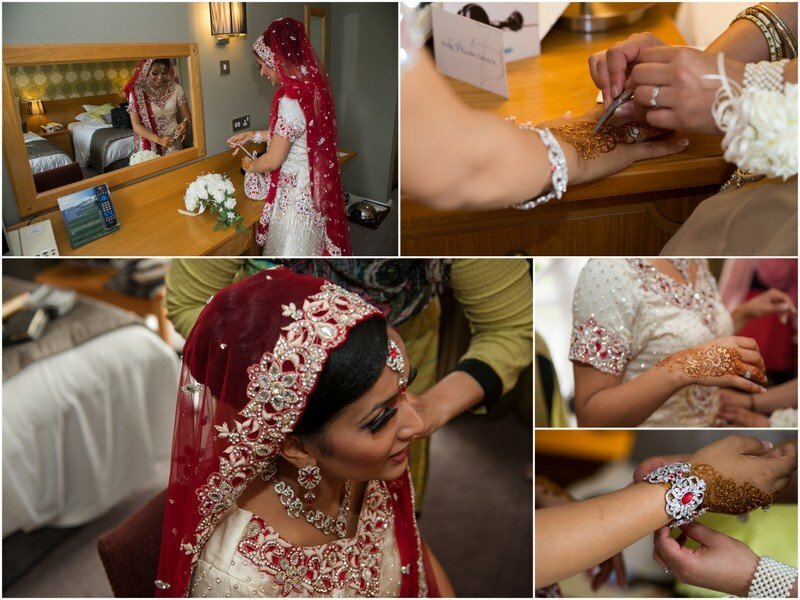 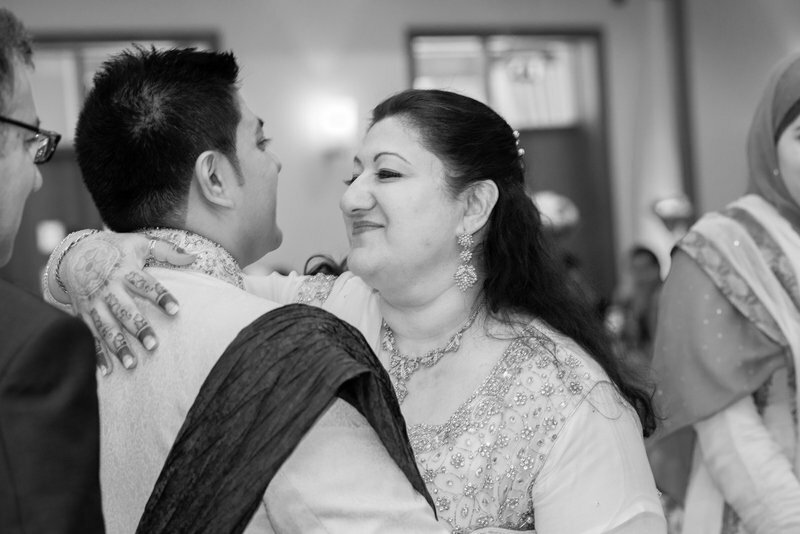 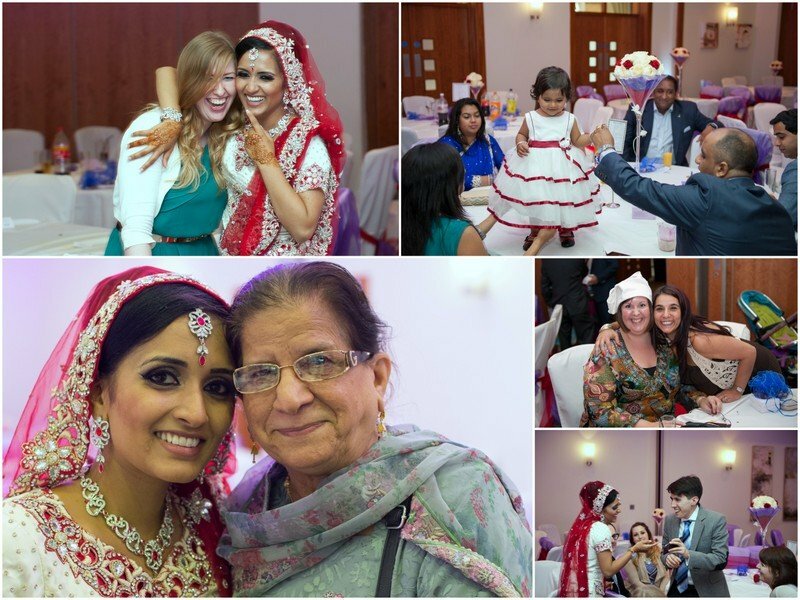 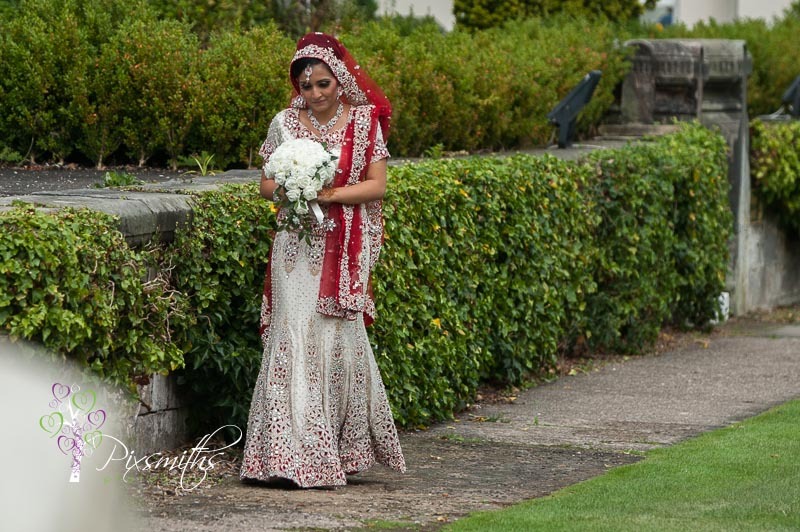 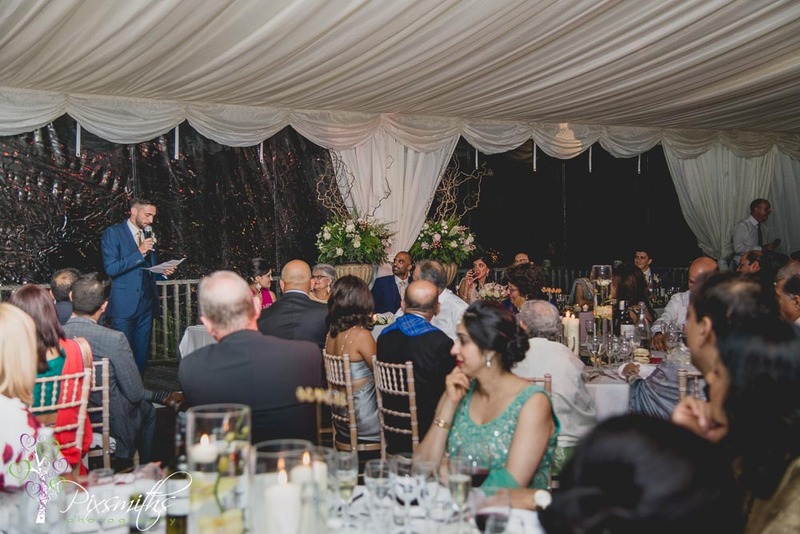 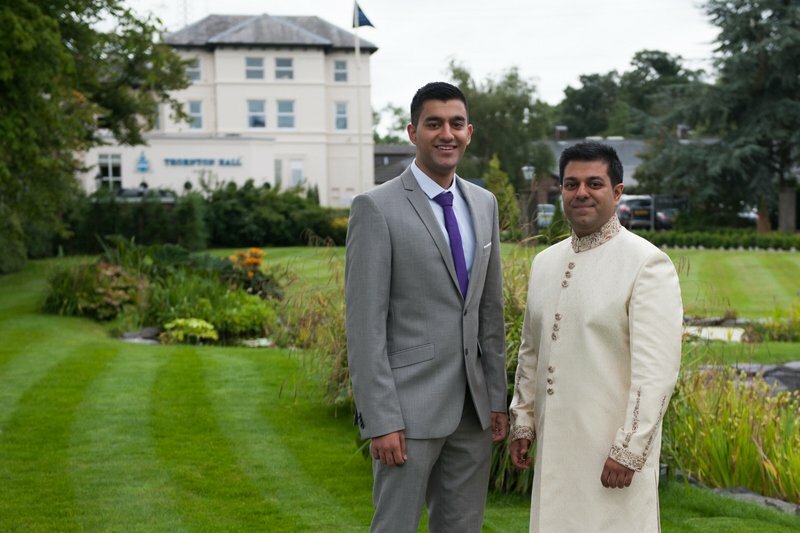 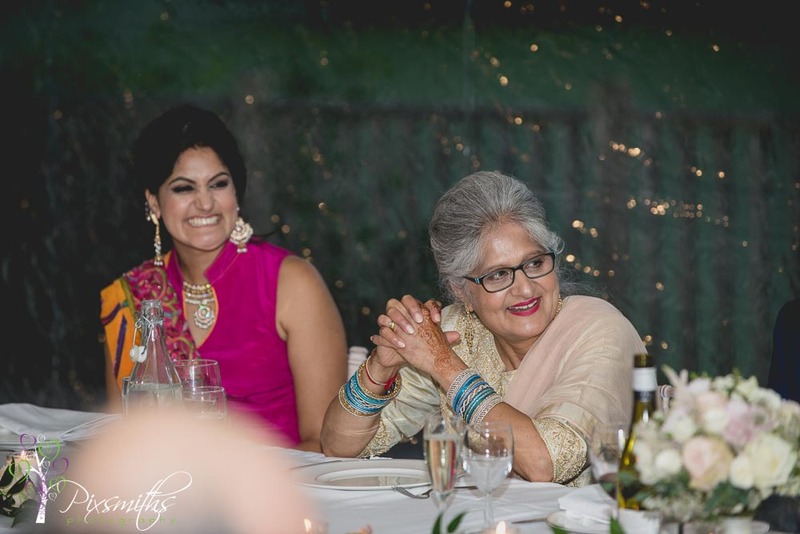 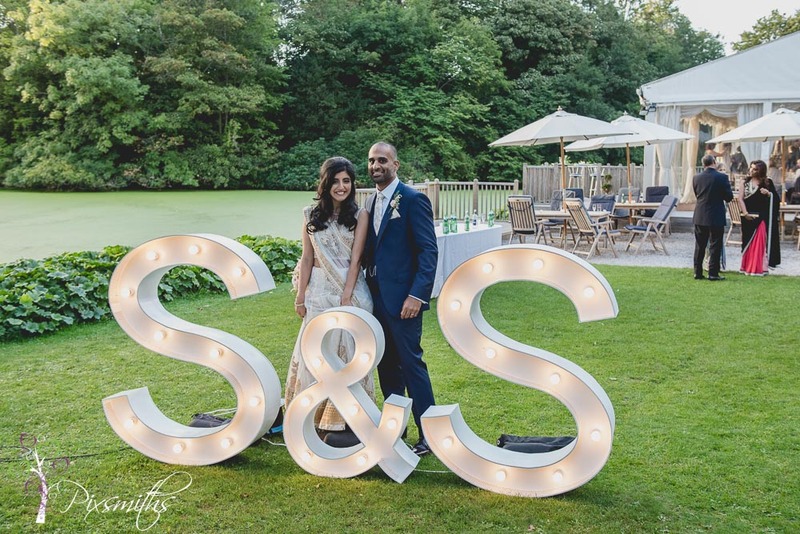 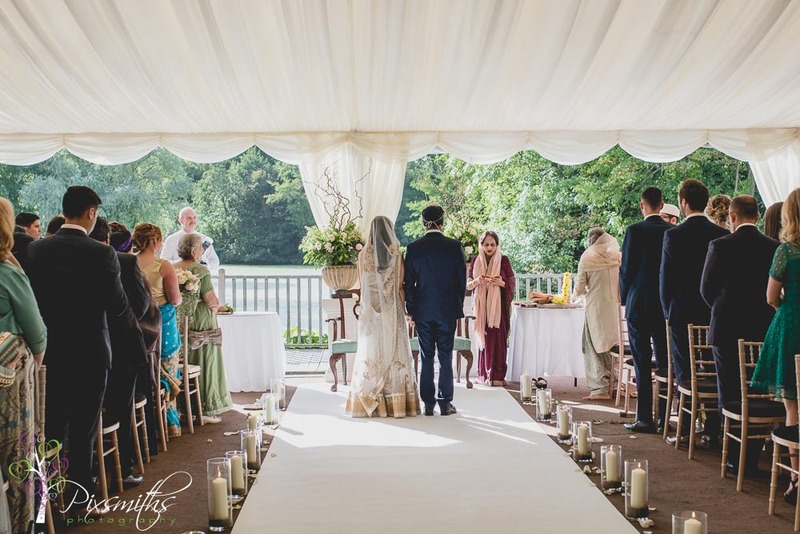 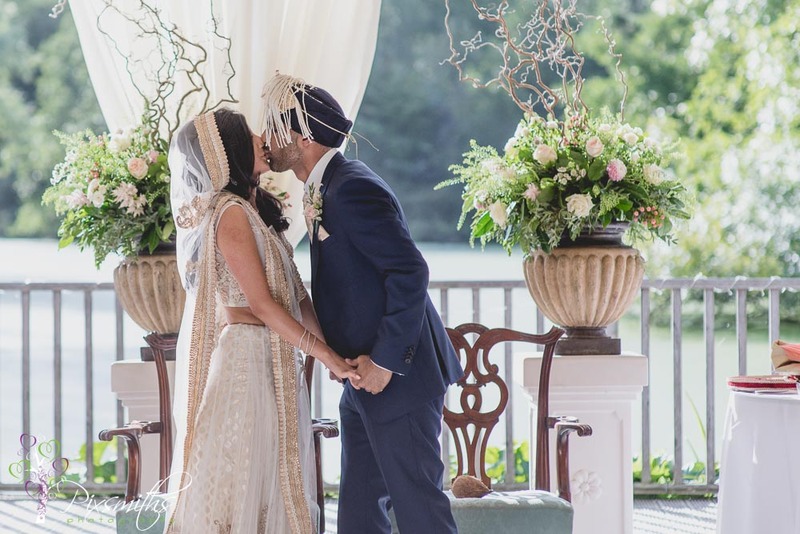 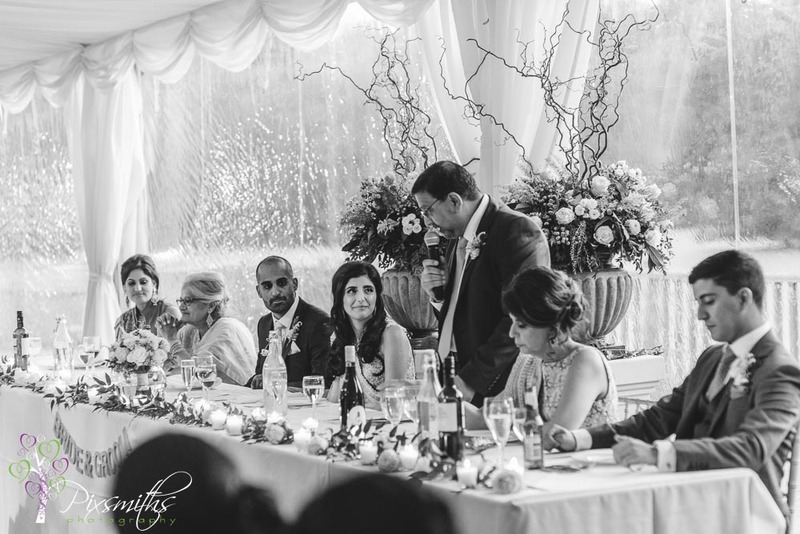 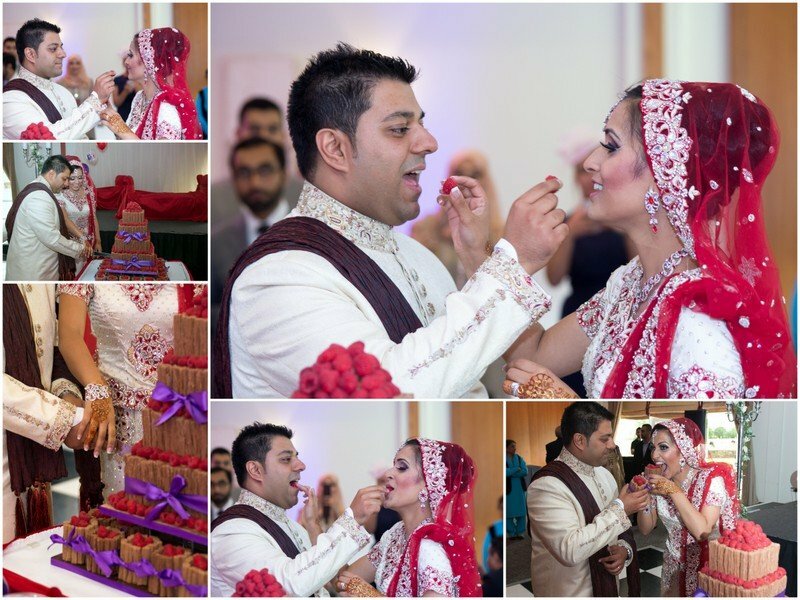 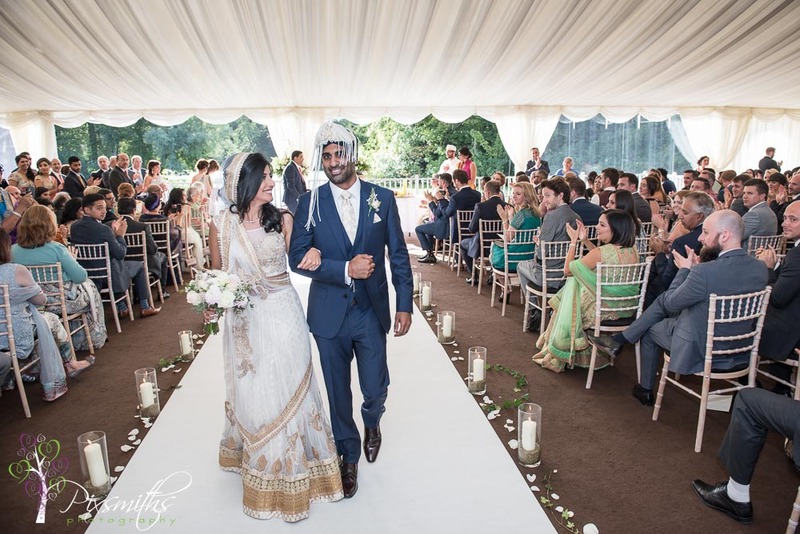 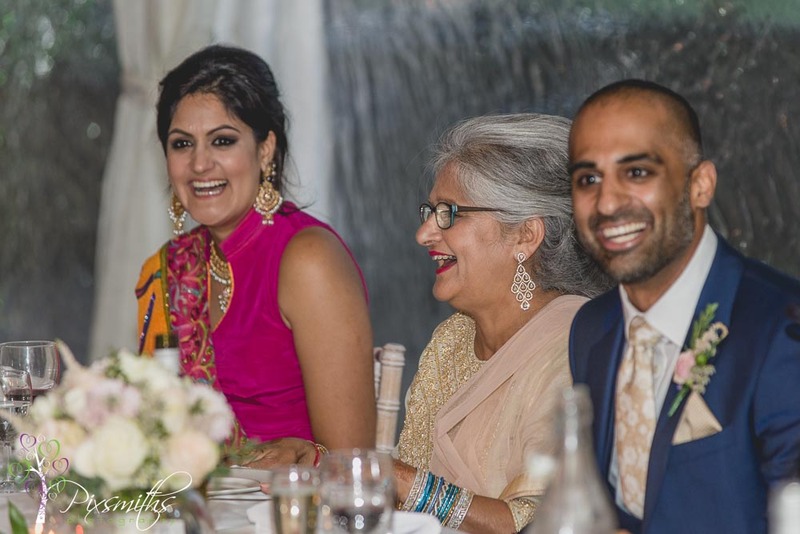 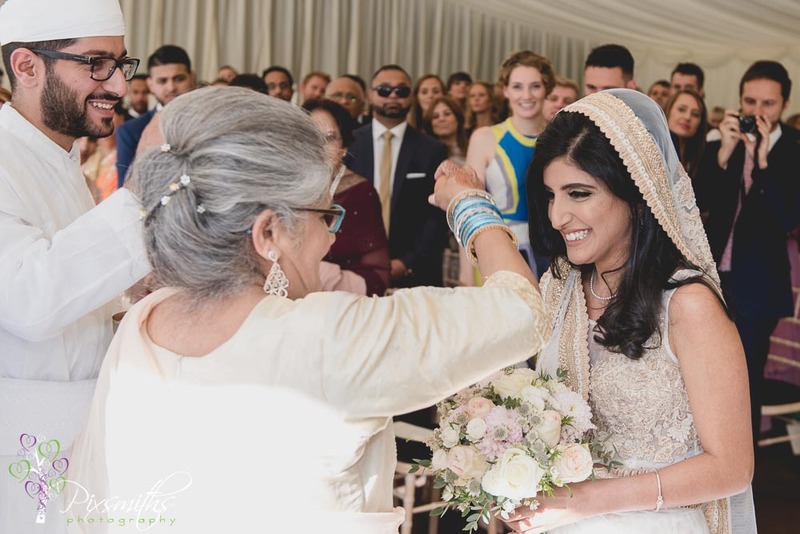 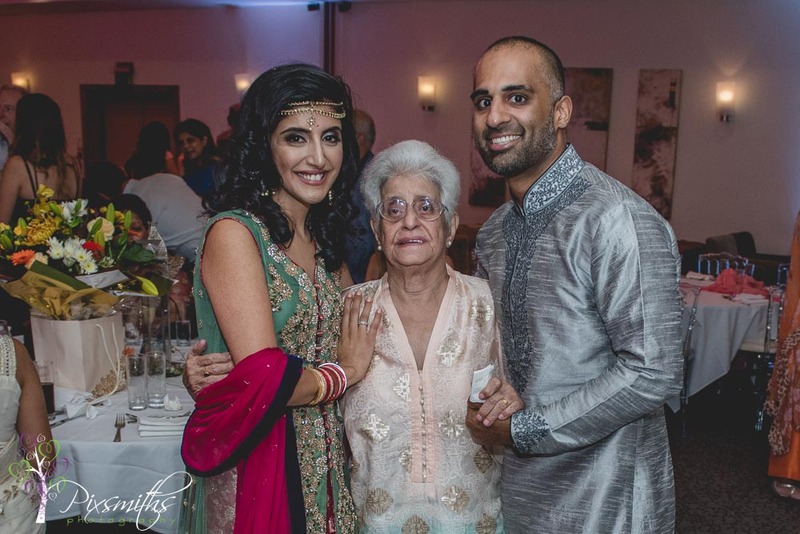 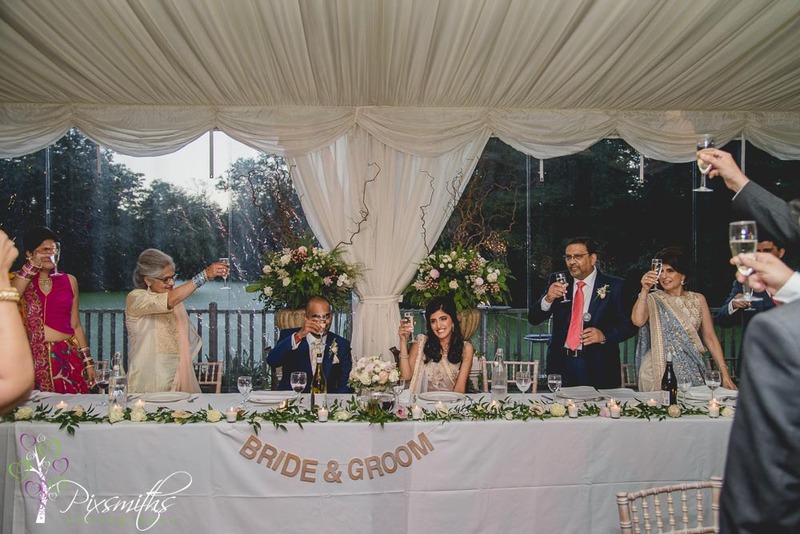 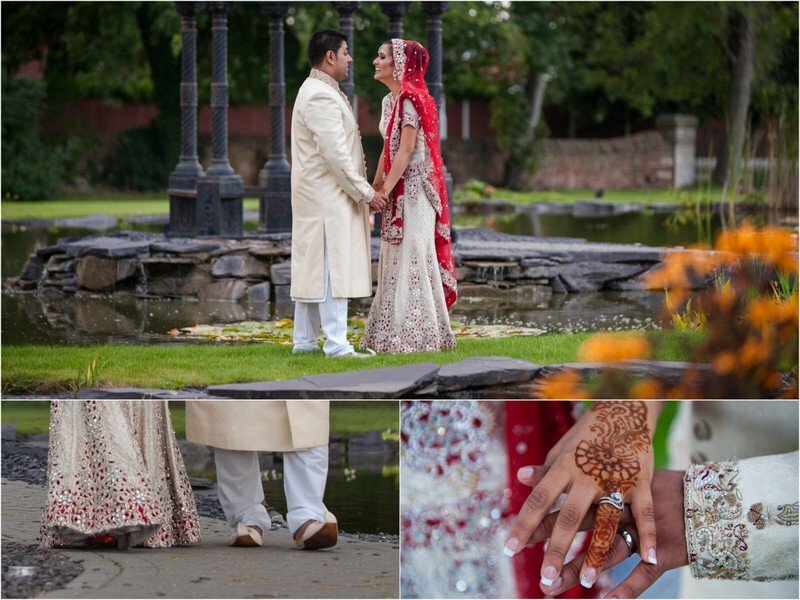 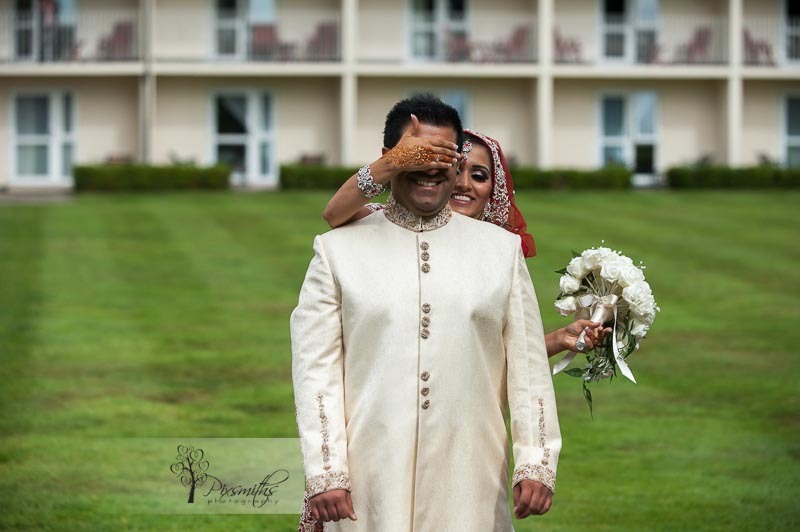 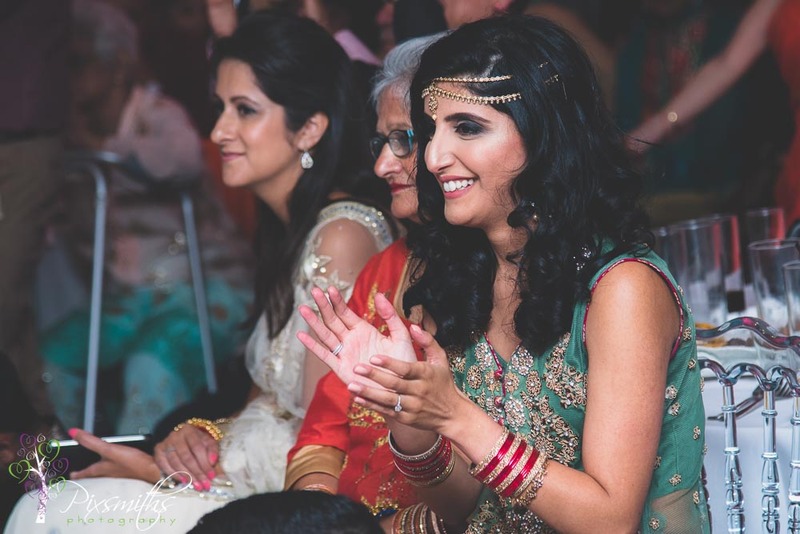 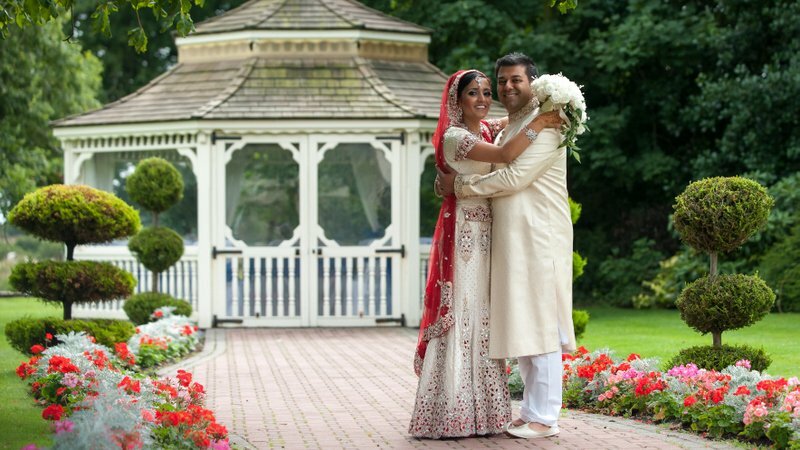 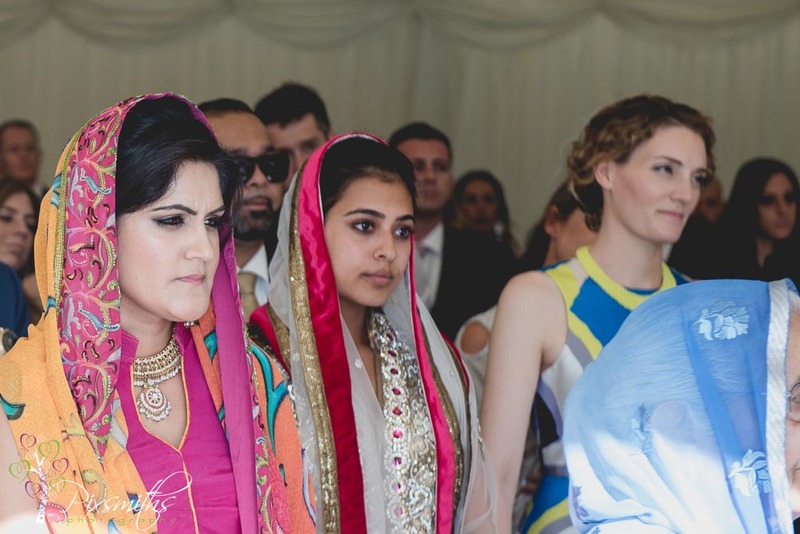 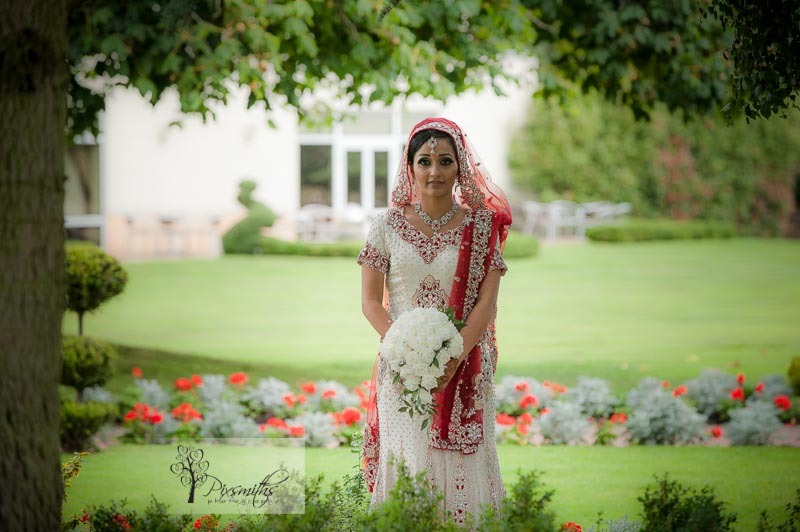 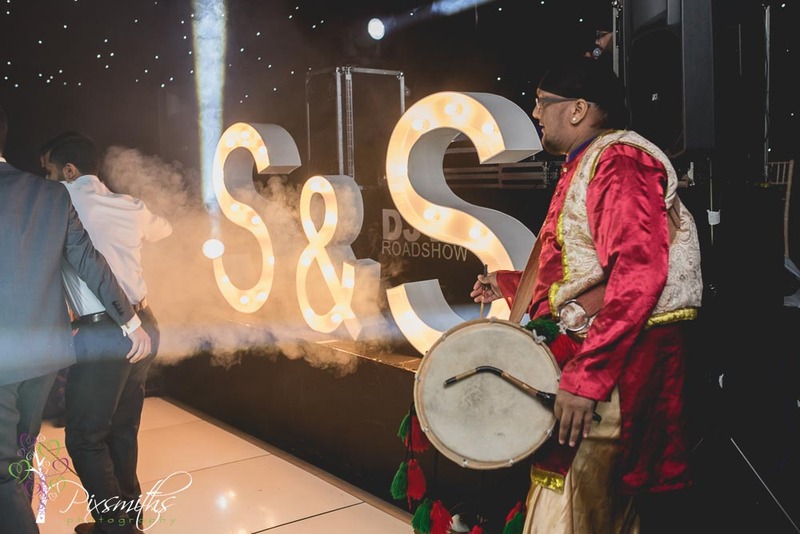 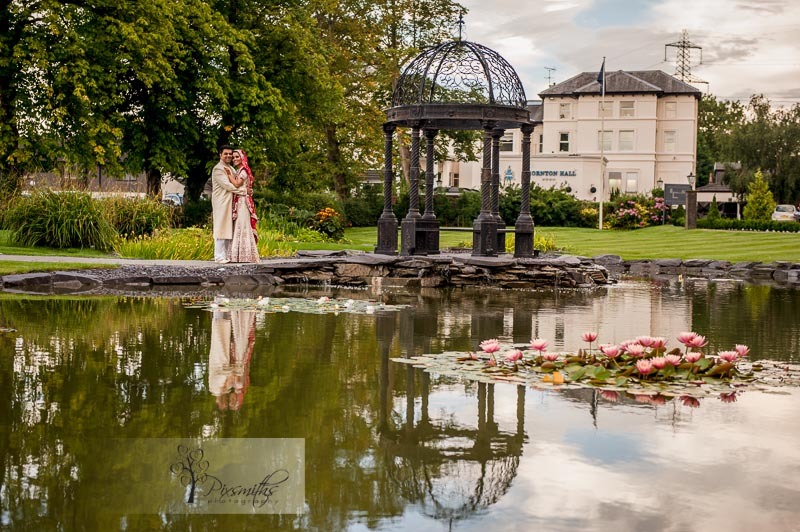 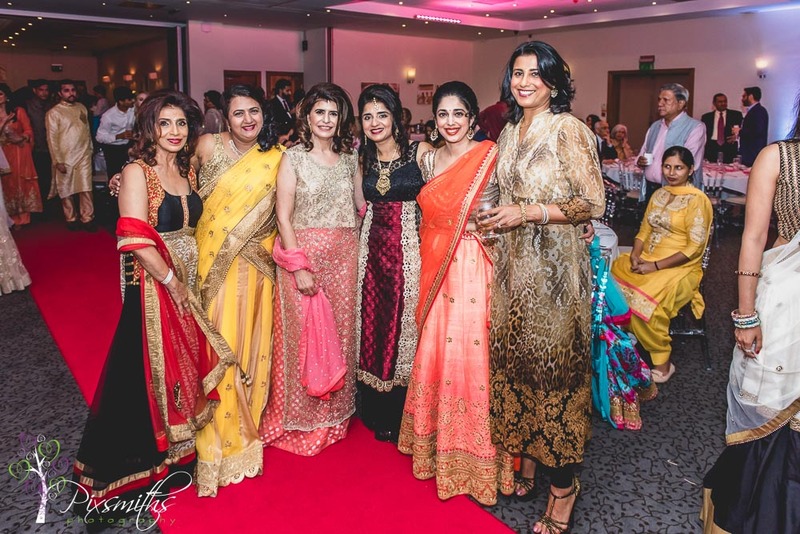 was created especially for Sanaya and Satal’s Sikh and Zoroastrian fusion wedding at Thornton Manor, Lakeside Marquee. 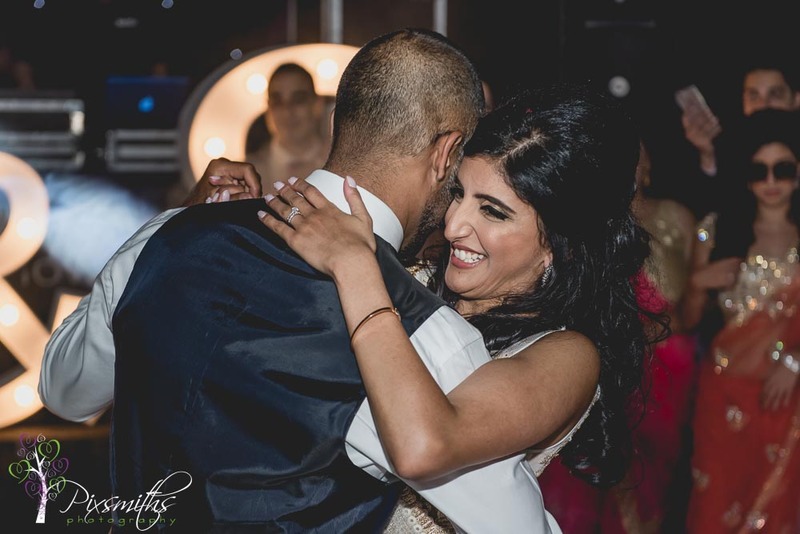 No slow first dance, our couple wished for an impact when the curtain was raised for the evening party to begin and we certainly got that! 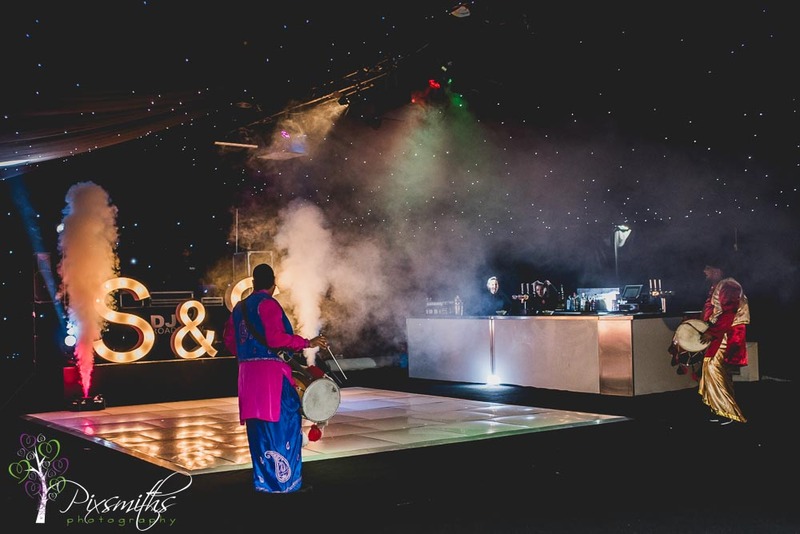 The drummers enticing the party goers to the dance floor. 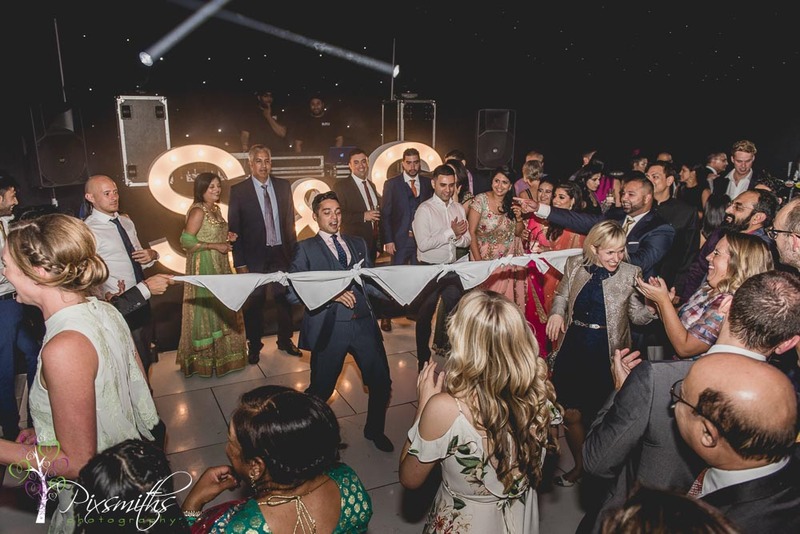 Honestly I don’t think they needed much enticement – the floor was always packed! 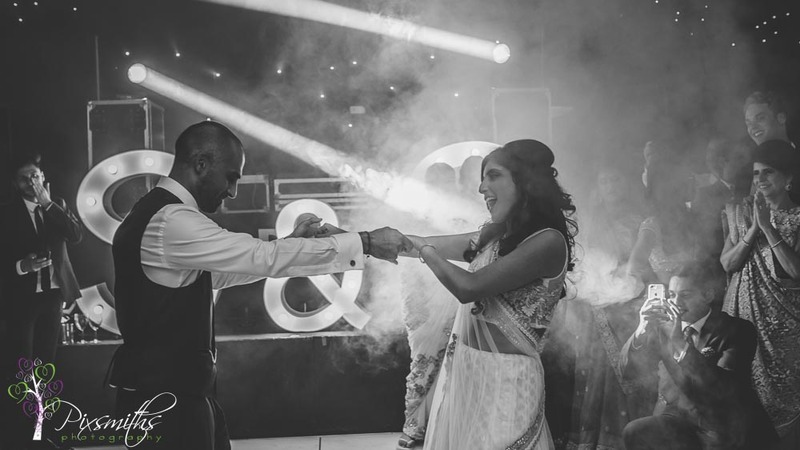 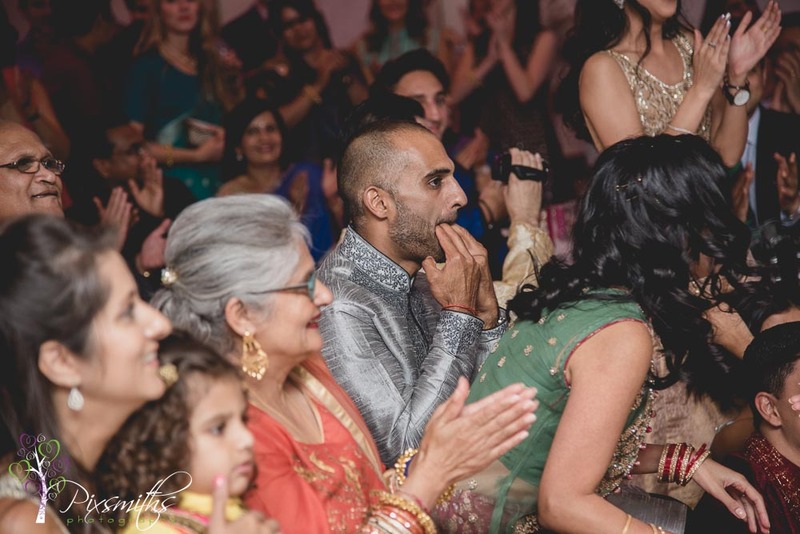 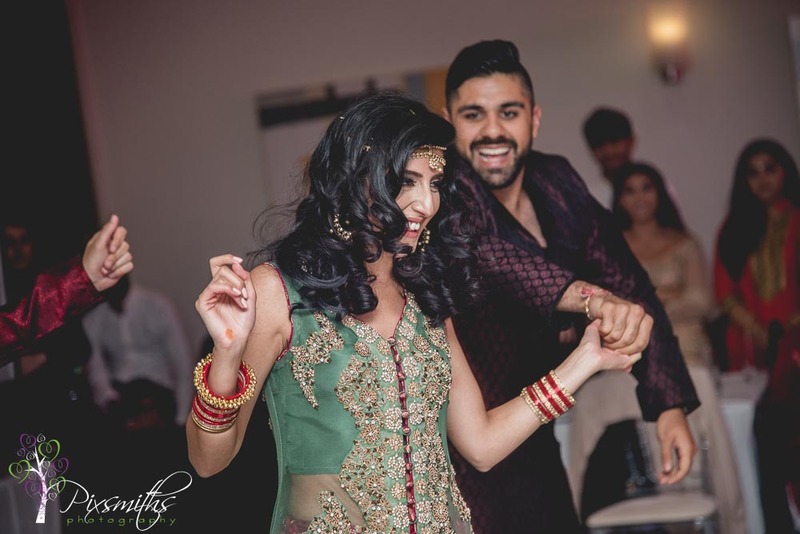 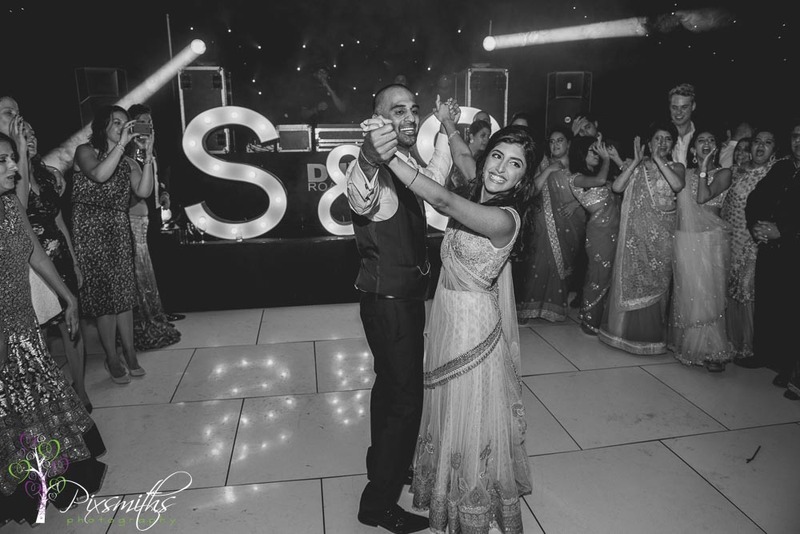 Sanaya and Satal’s first dance came much later! 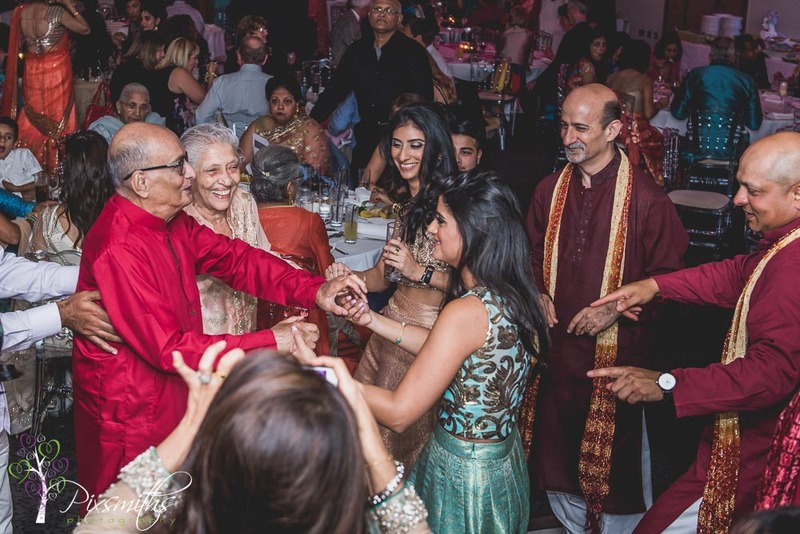 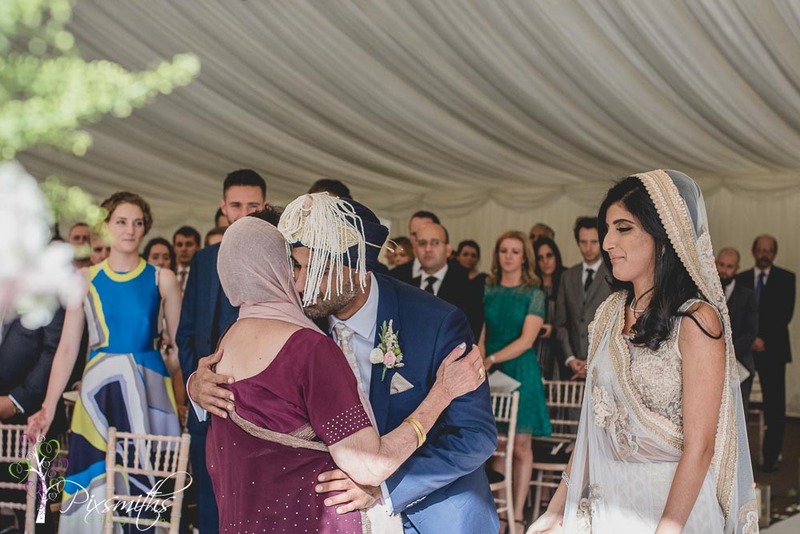 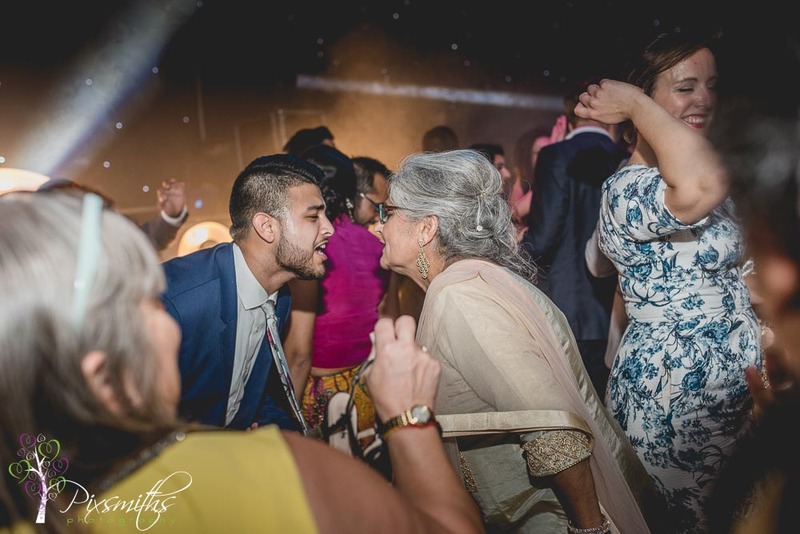 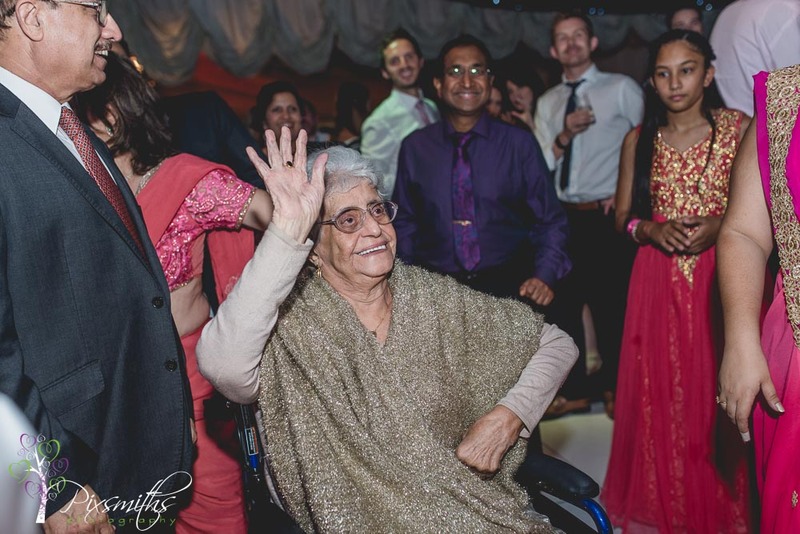 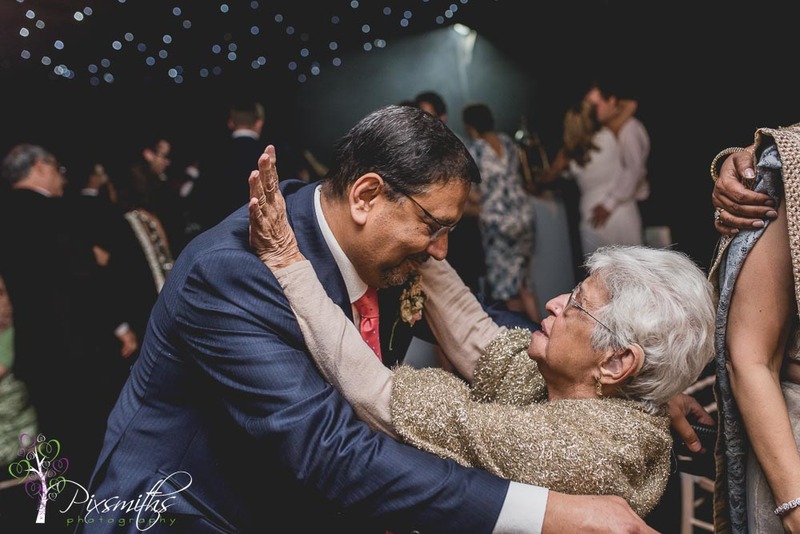 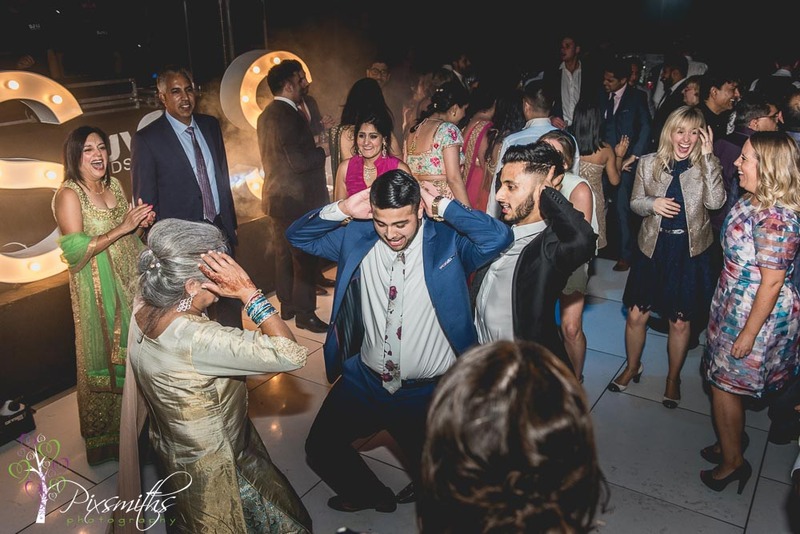 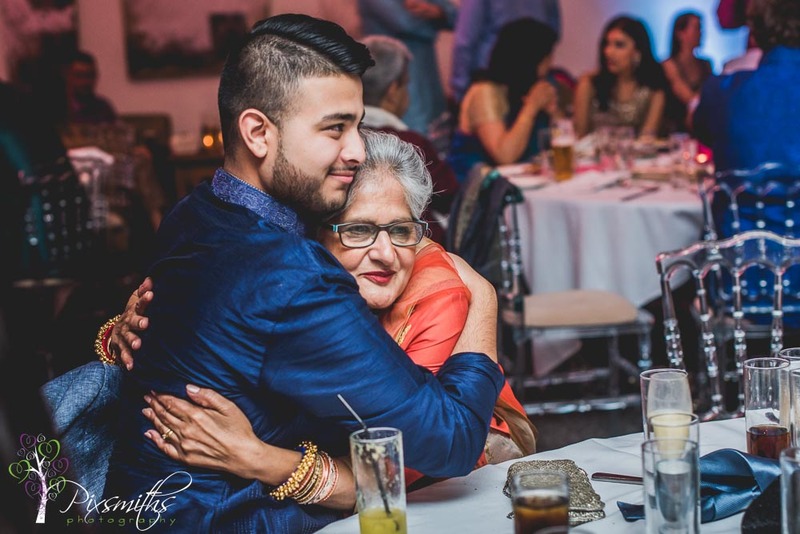 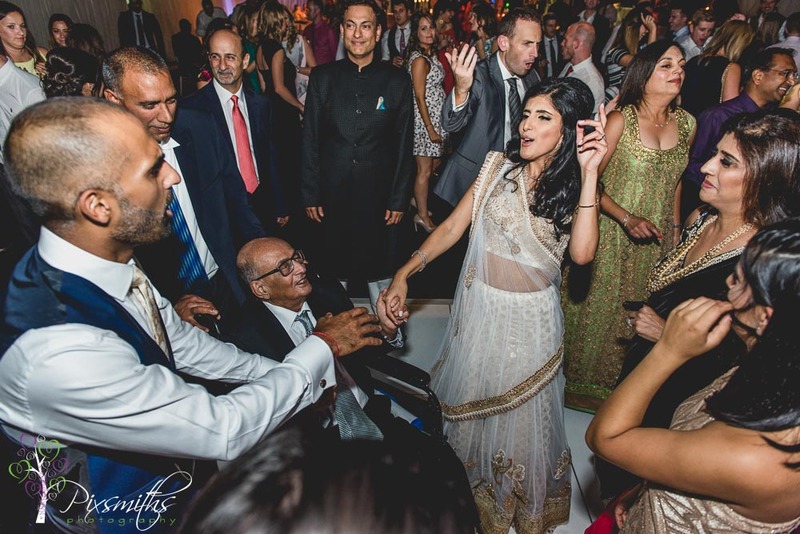 Wonderful to see the older generation of the families being included on the dance floor too – just as in the pre wedding party. 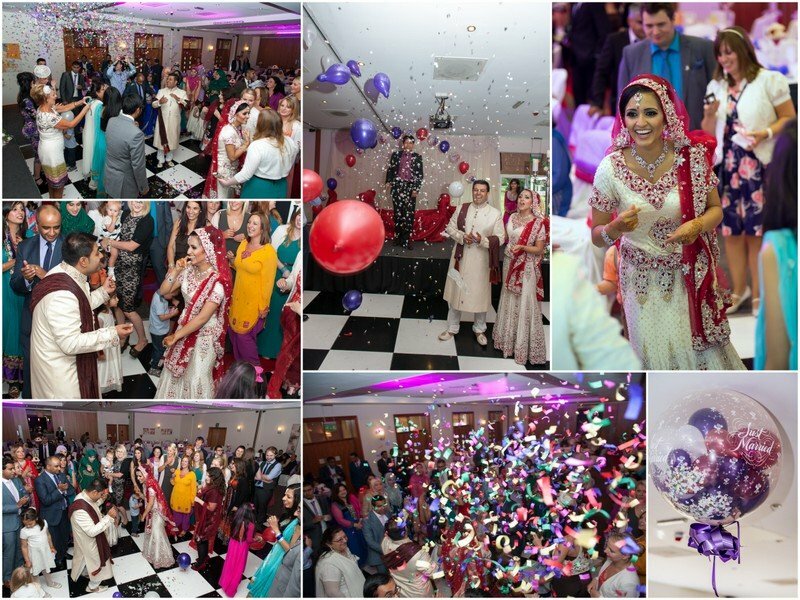 Hope you enjoy these images as much as we enjoyed the day! 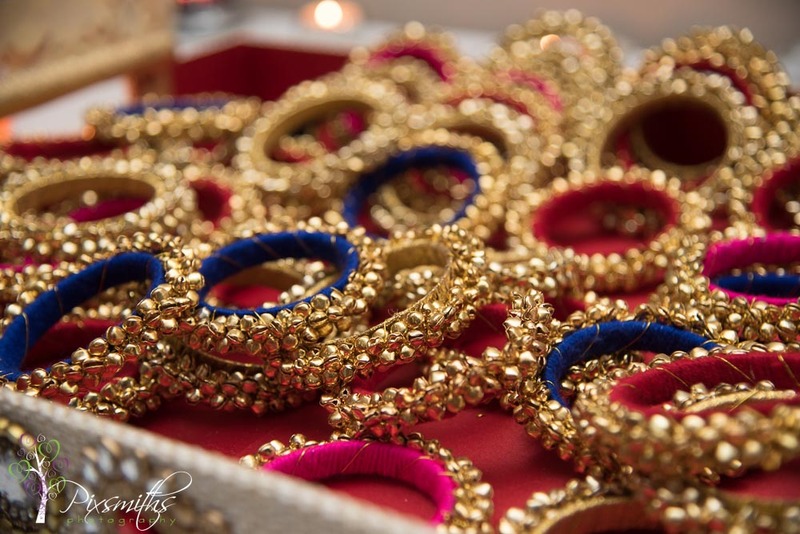 Colourful bangles for the guests to go with all the myriad colours of the ladies saris. 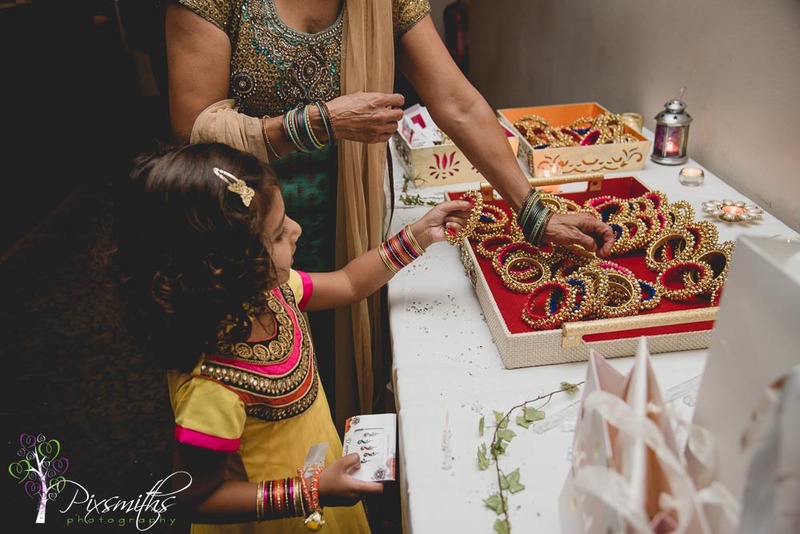 Sanaya was presented with so many gifts in a special ceremony, involving rice, henna, bracelets and coconut amongst other items! 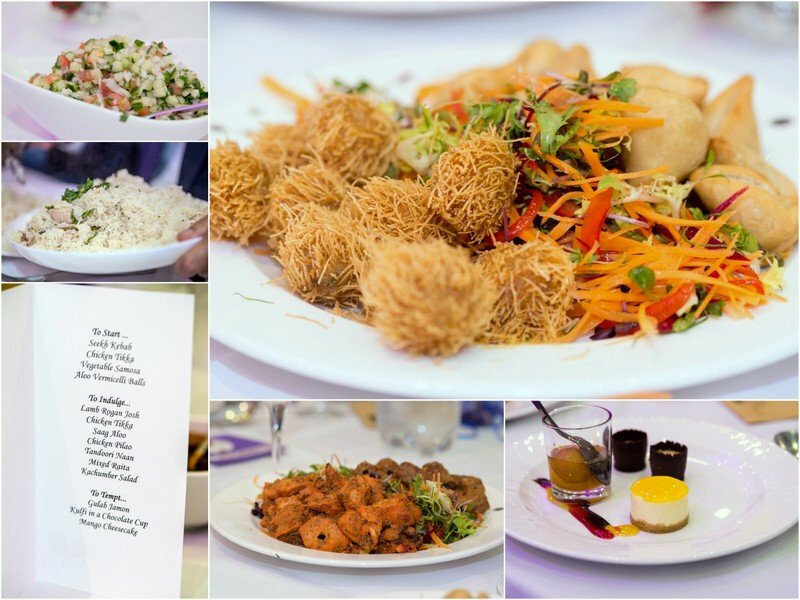 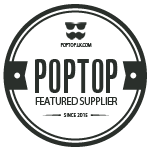 Good food to enjoy and then some unusual dancing! 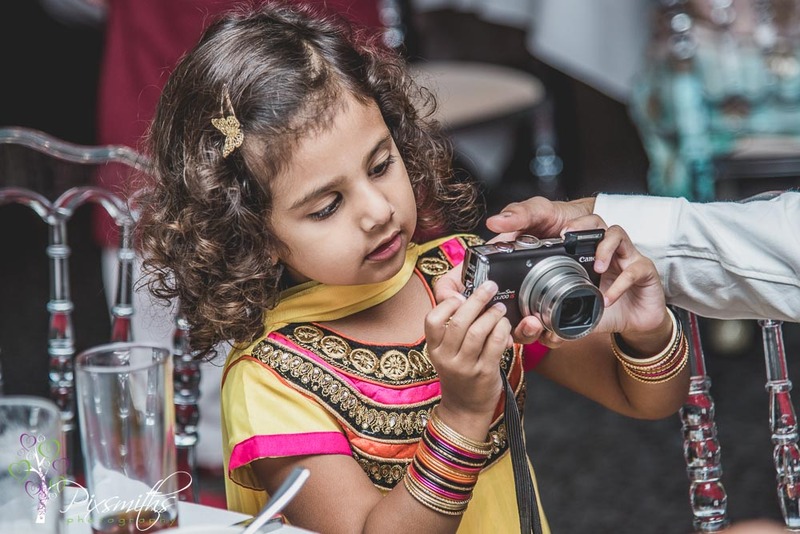 – I’ll let the pictures do the talking for that! 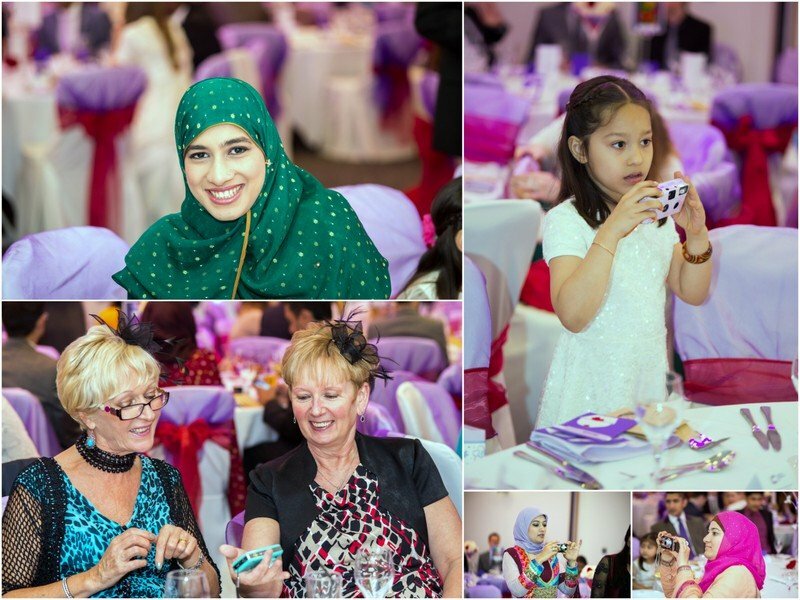 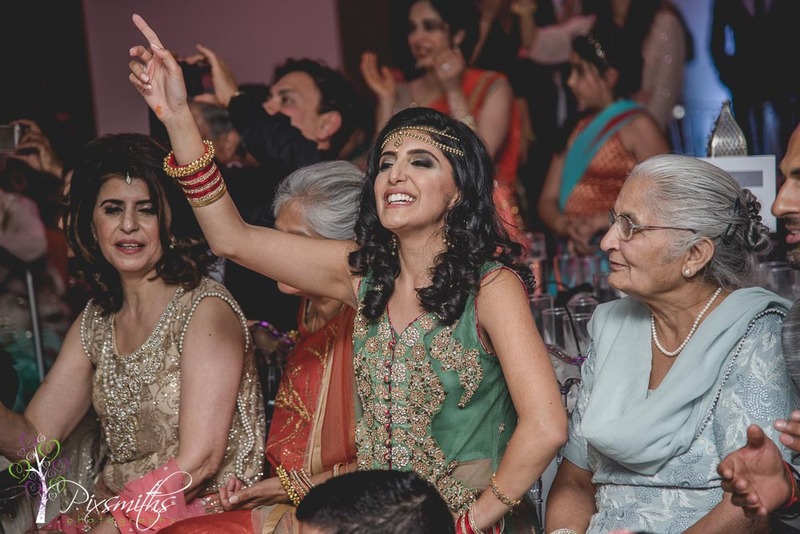 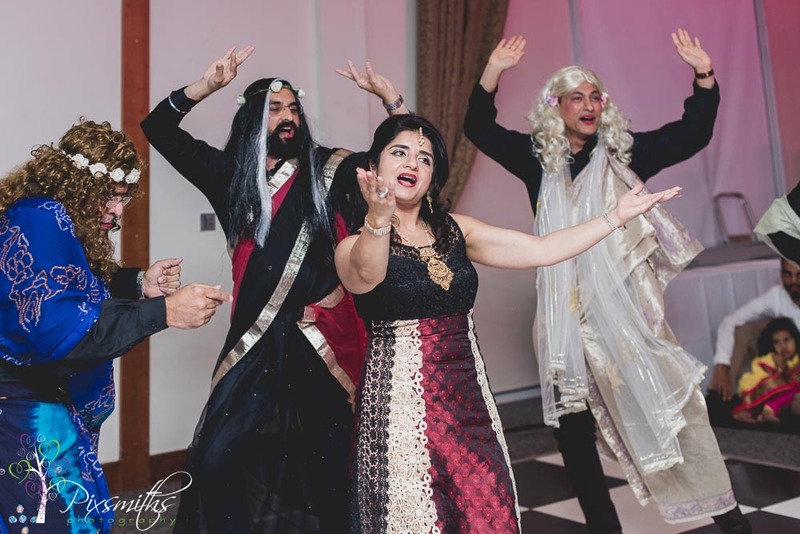 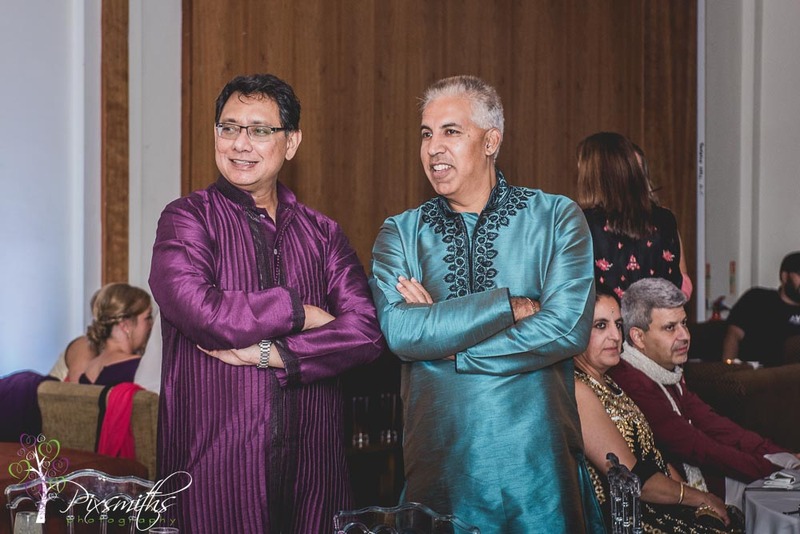 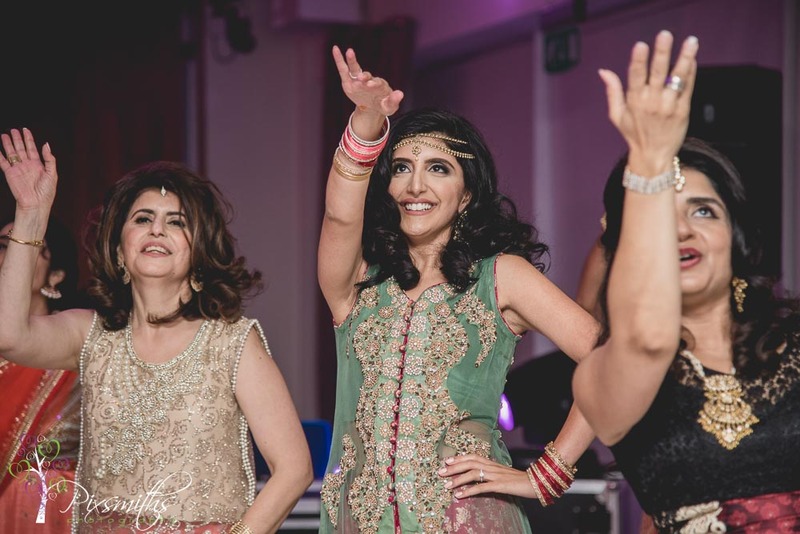 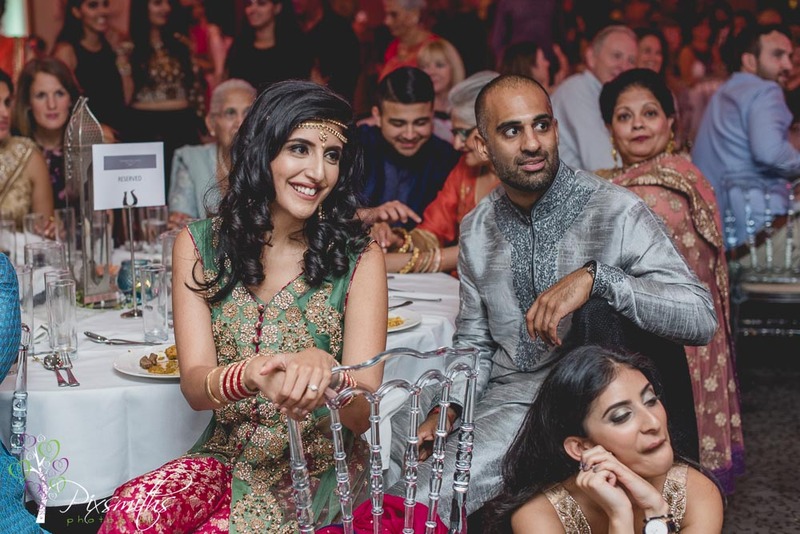 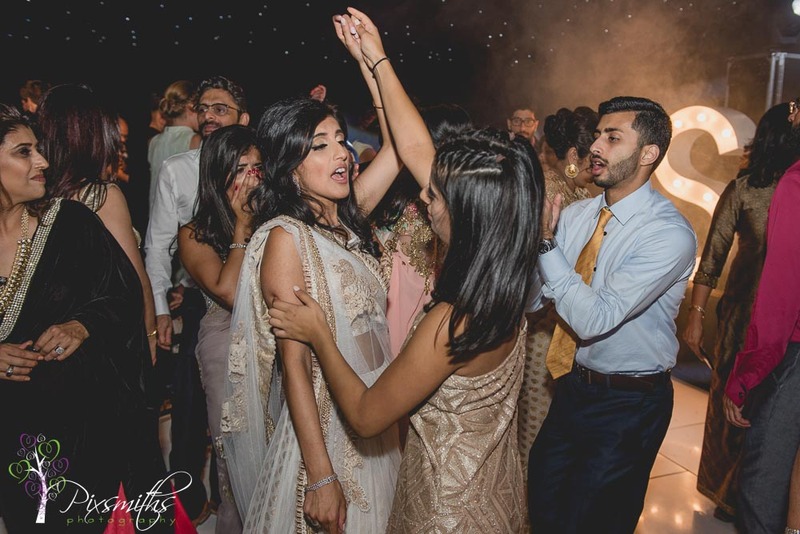 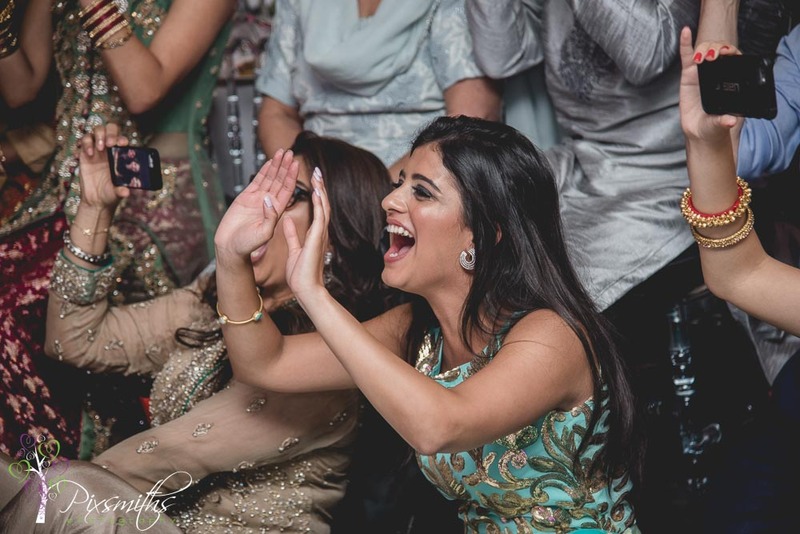 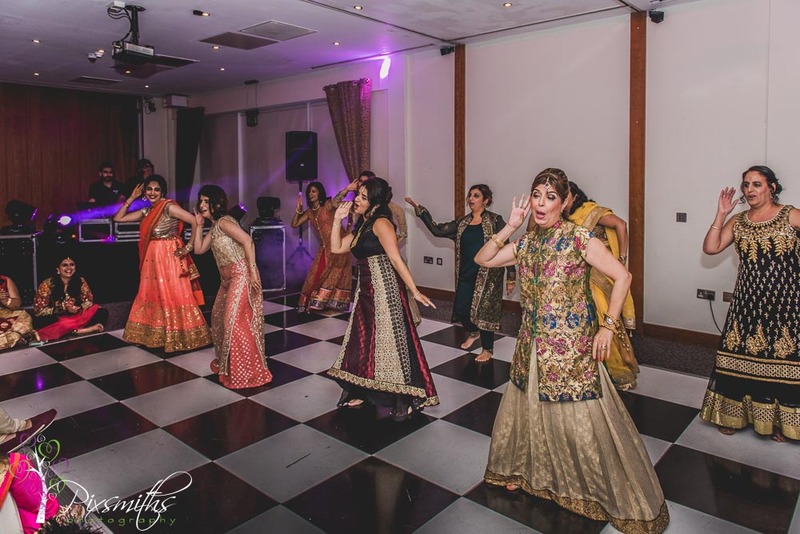 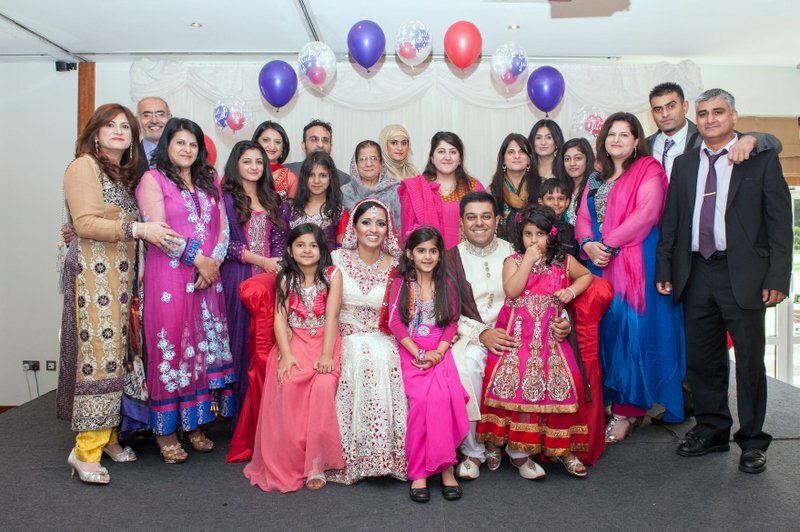 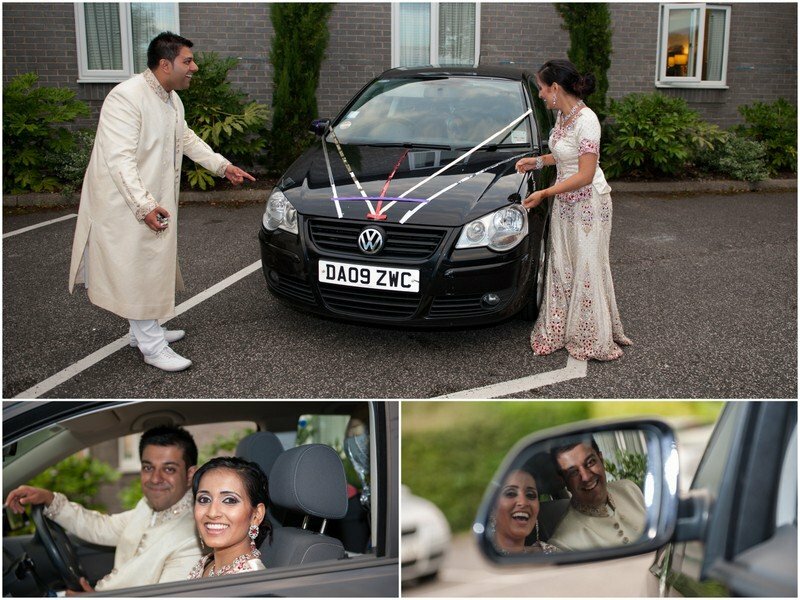 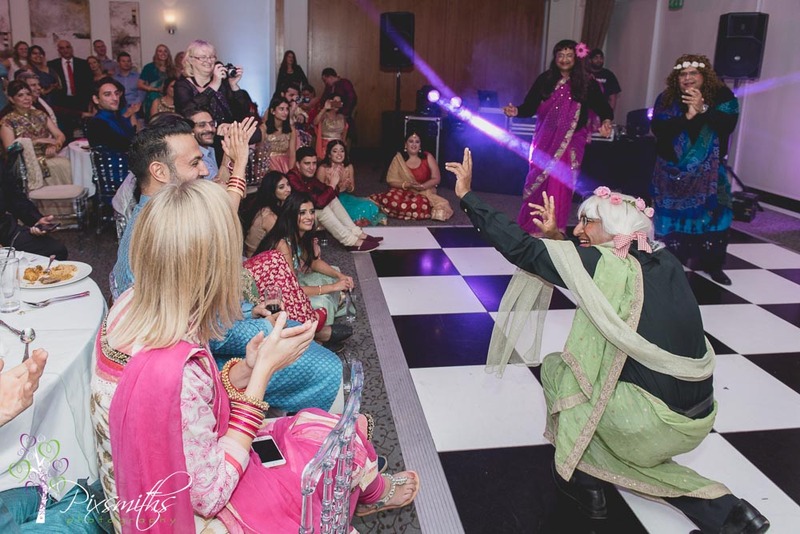 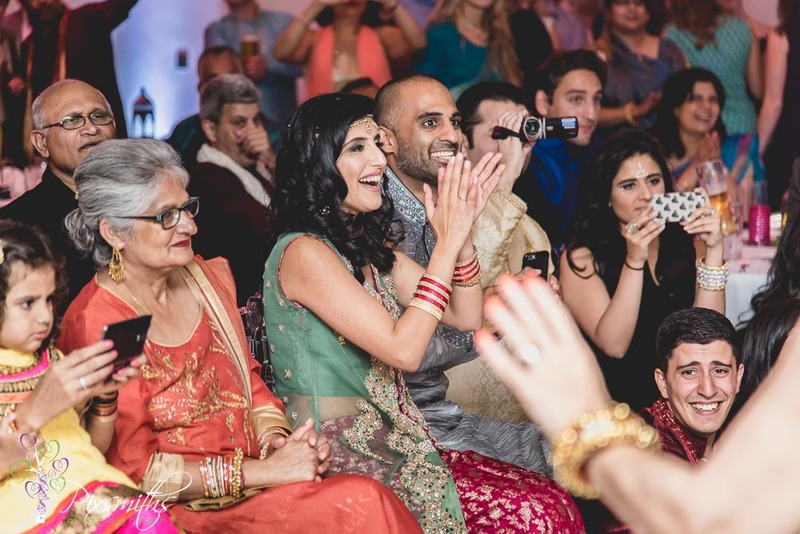 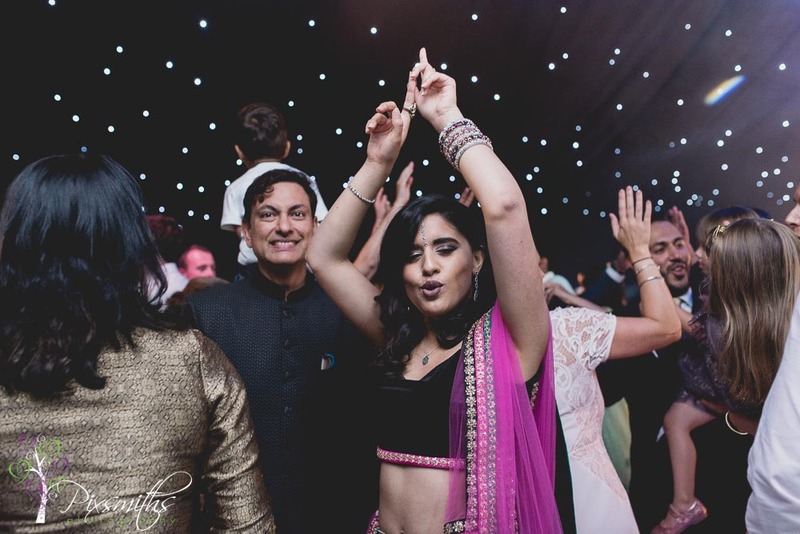 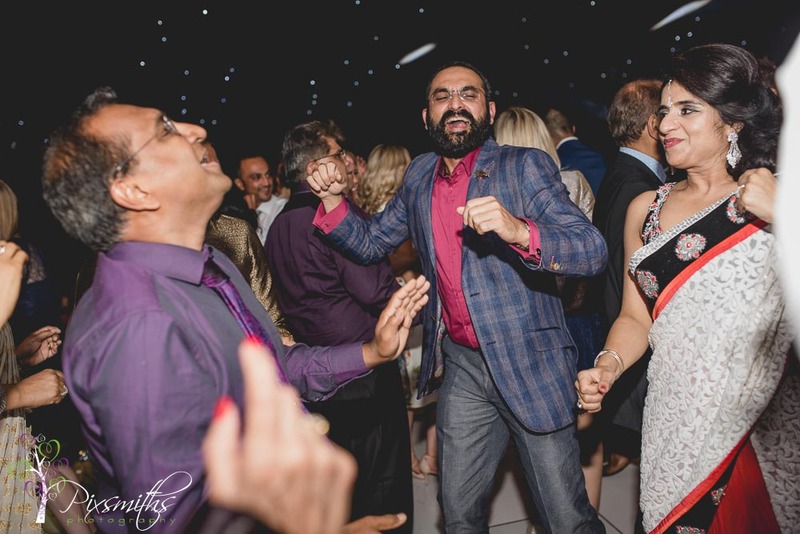 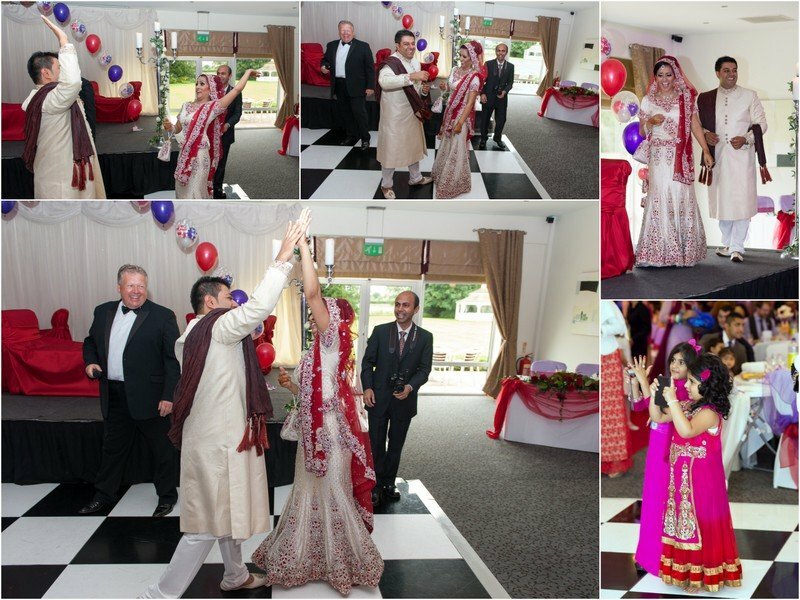 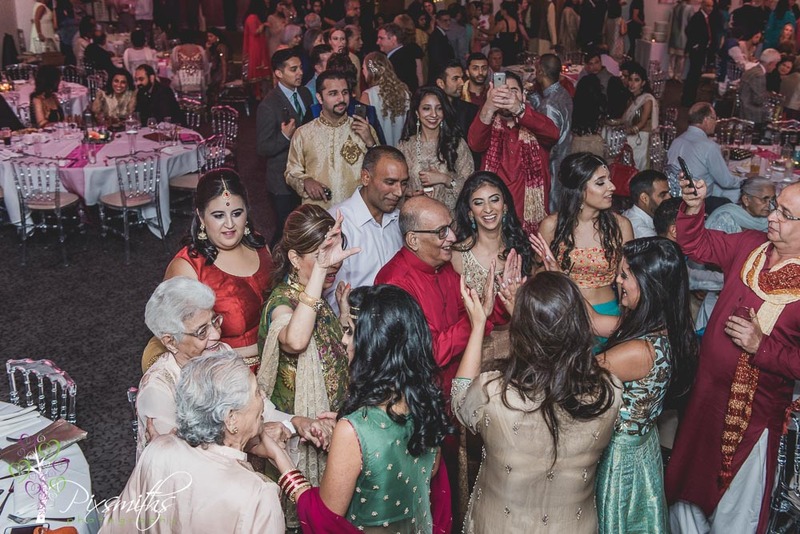 In all a splendid fun occasion, lots of laughter and joy and dancing to entertain everyone at this Asian wedding party. 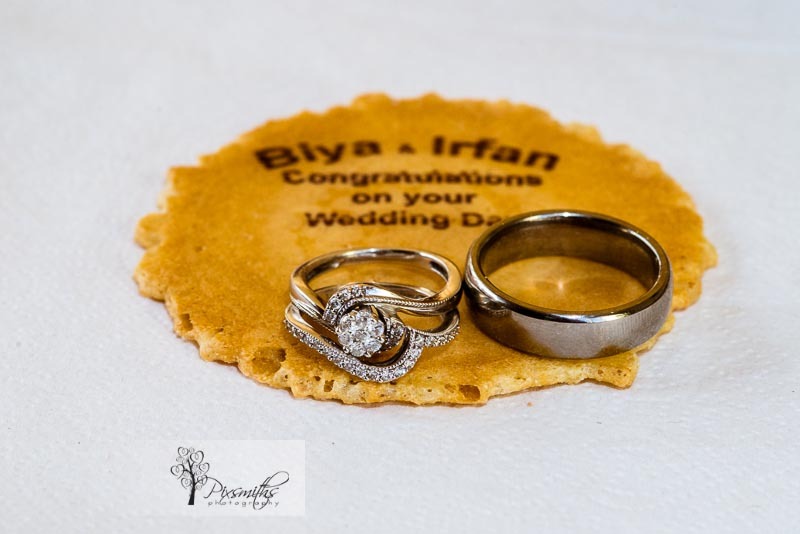 So having met Biya and Irfan in an earlier post documenting their First look we now come to the wedding ceremonies and reception. 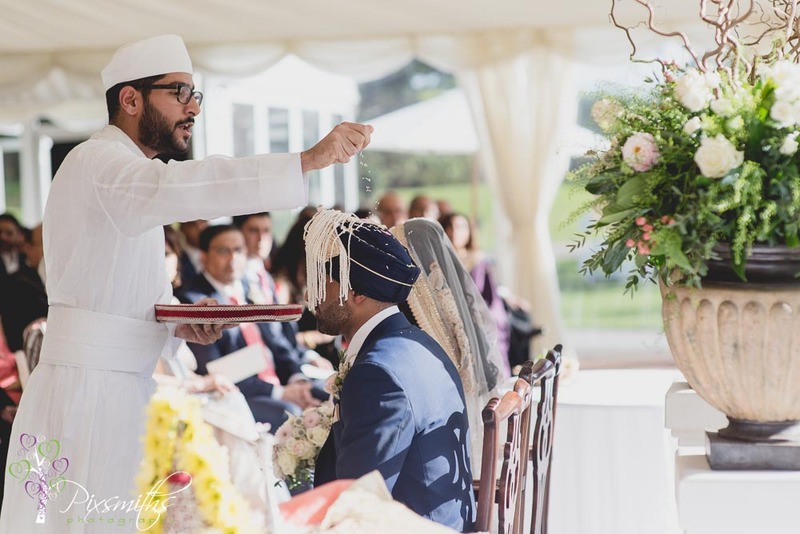 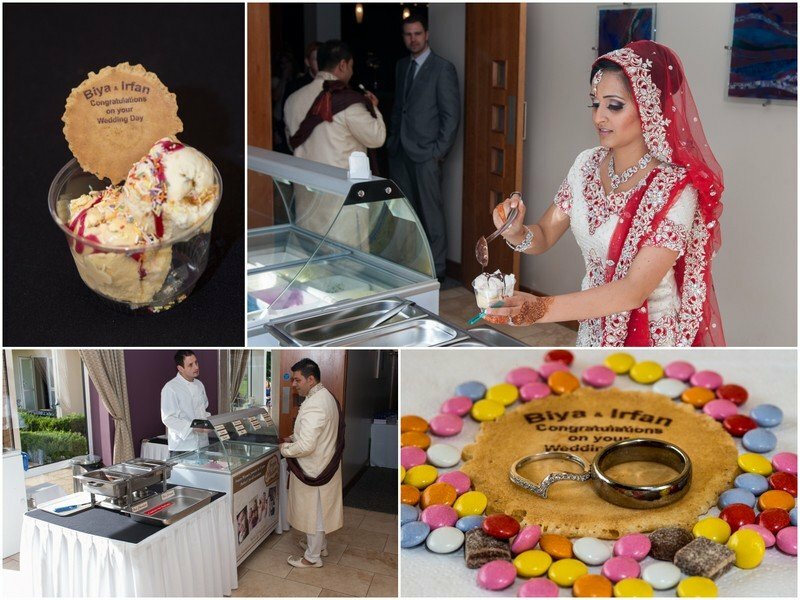 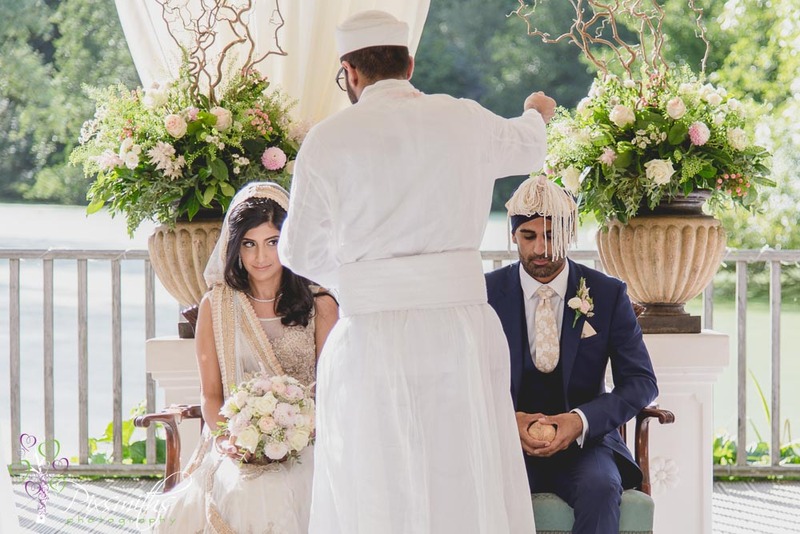 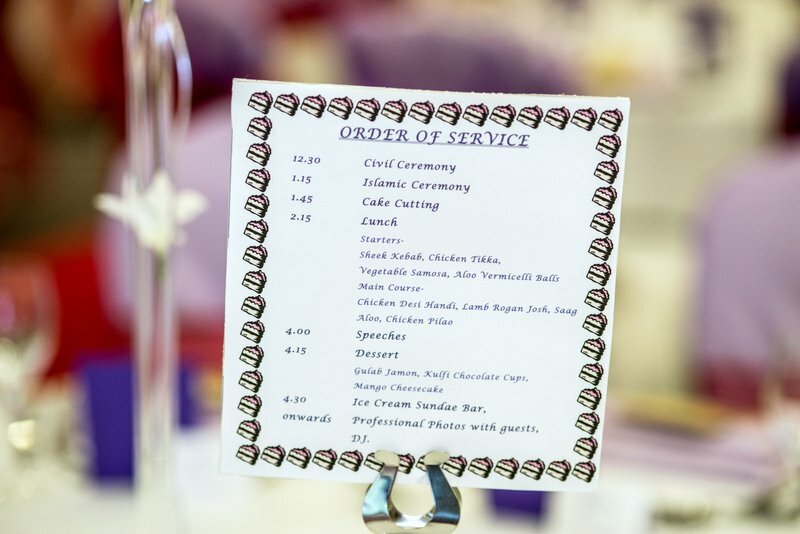 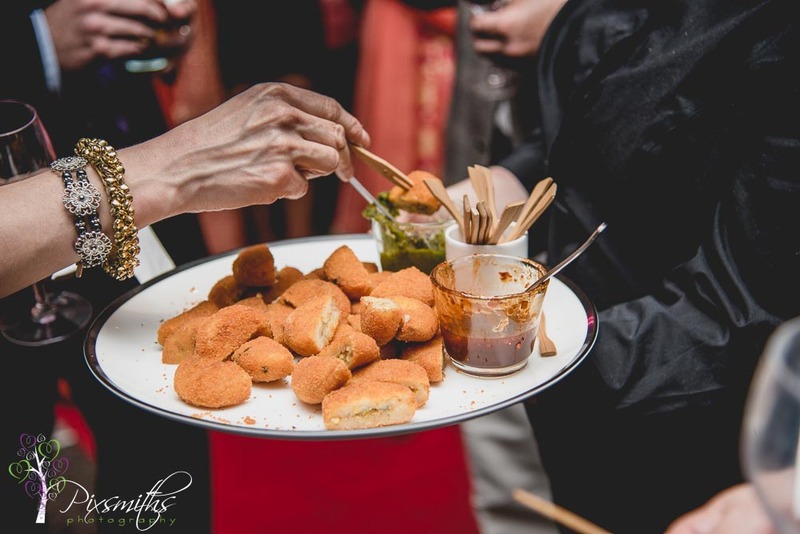 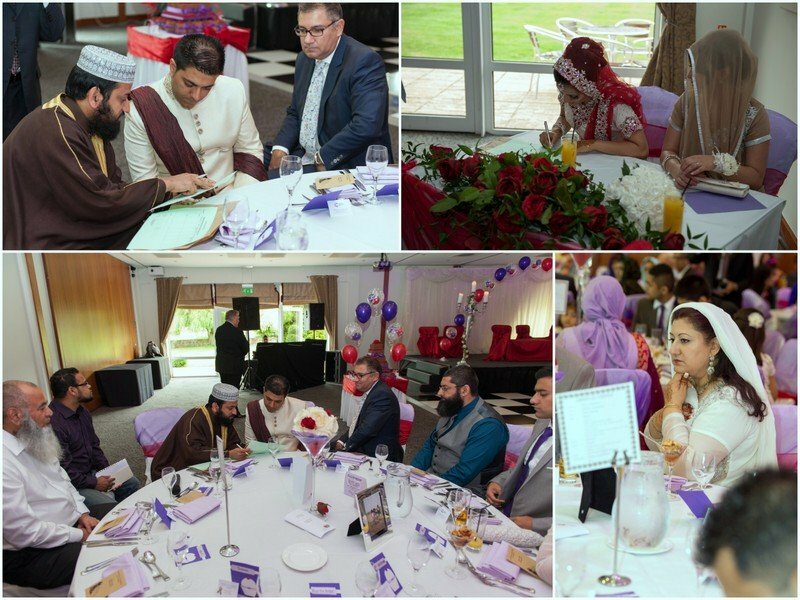 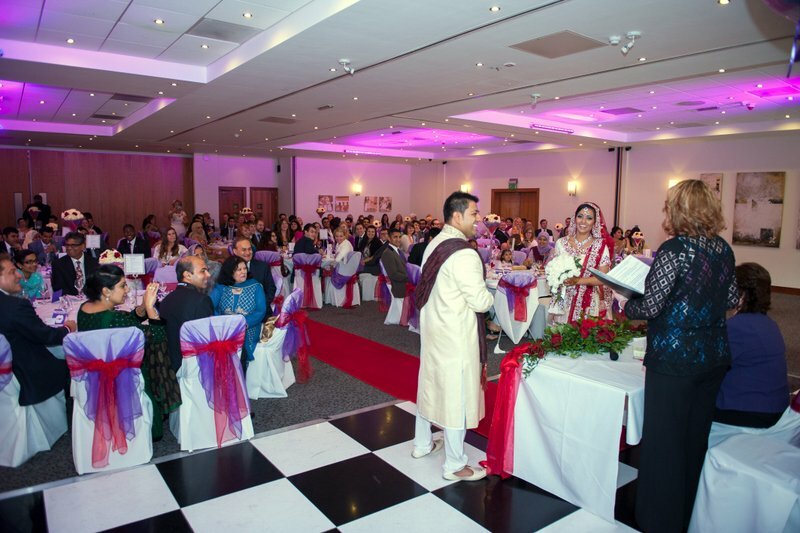 Civil ceremony first and then the Islamic one, cake cutting lots of food and then speeches…and more food with scrumptious ice-cream being on hand from Frozen Pleasure– check out the wafers with their name on too! 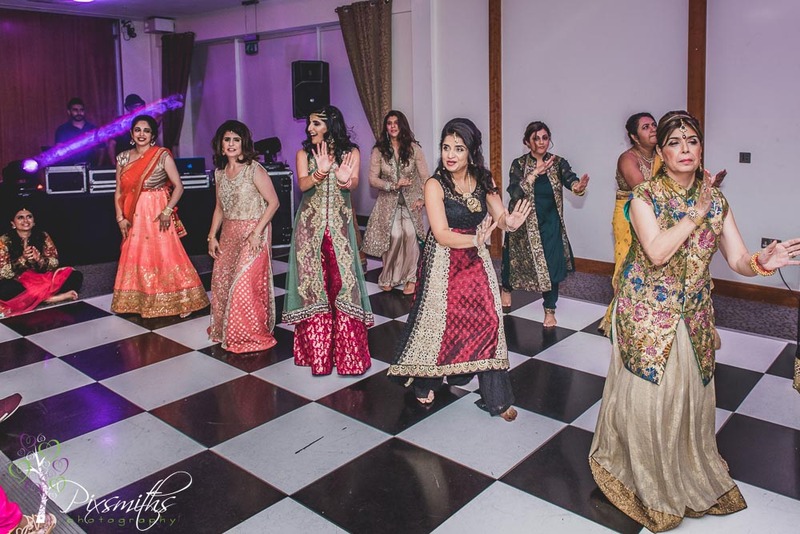 Lots of pictures with their friends and family followed by dancing. 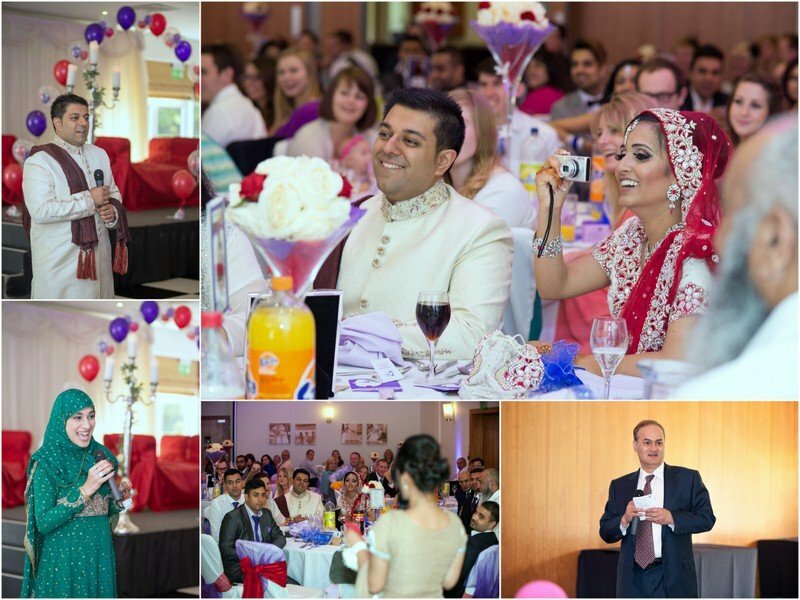 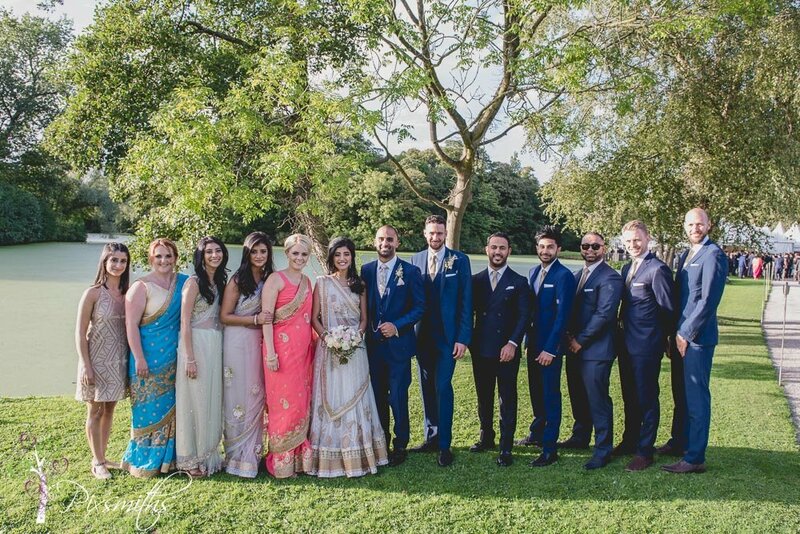 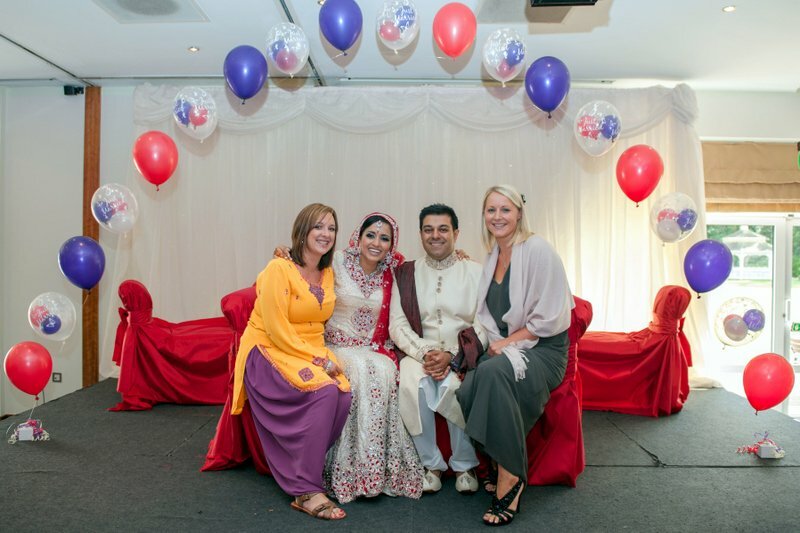 Such a colourful affair and a real privilege to be able to capture their day. 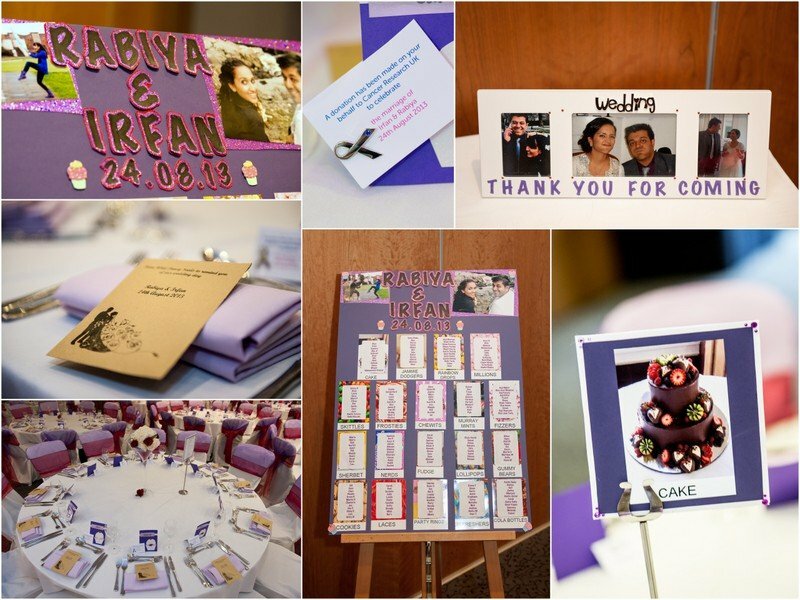 Food and cake were a real highlight for the wedding so much all the table names were sweets with the Bride and Groom’s table called cake. 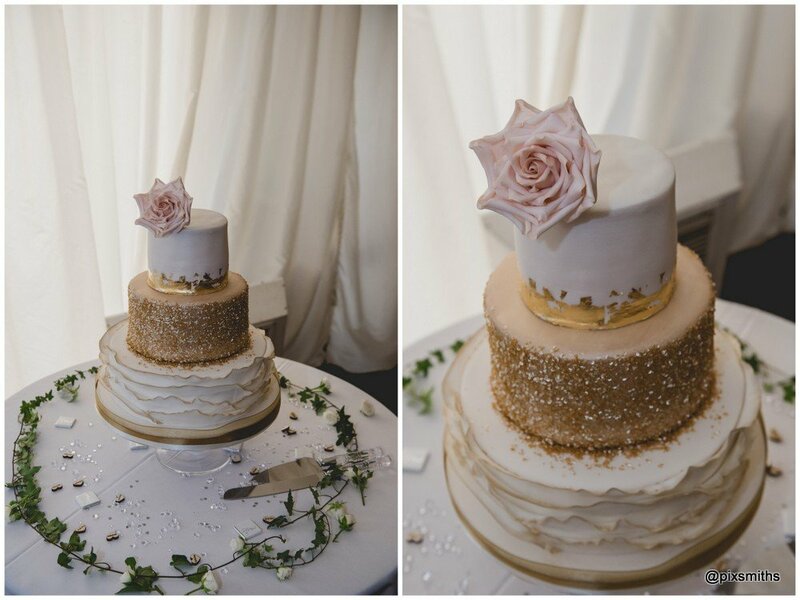 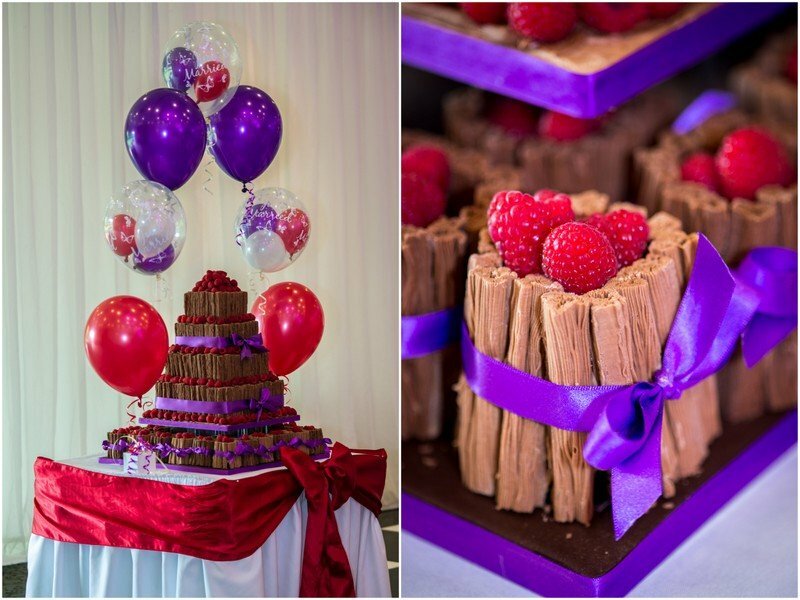 The wedding cake itself was a chocolate flake and raspberry masterpiece from Pipedreams in West Kirby – looked and tasted amazing! 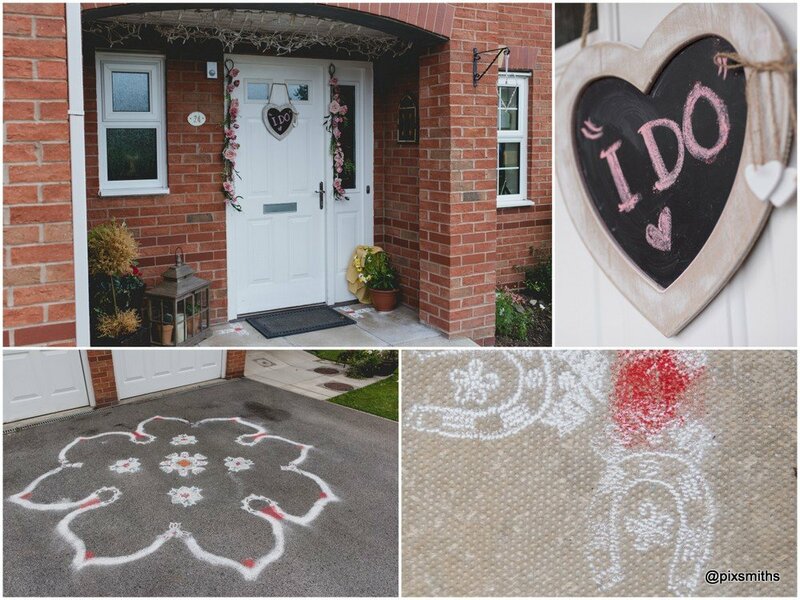 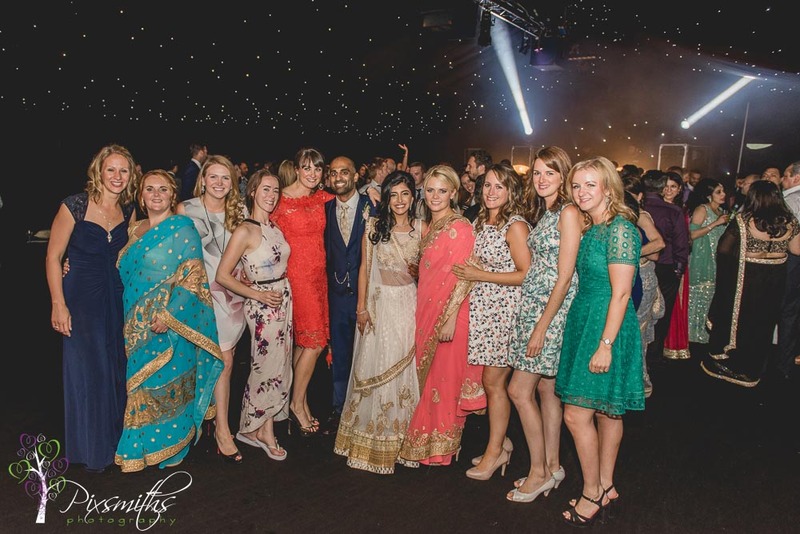 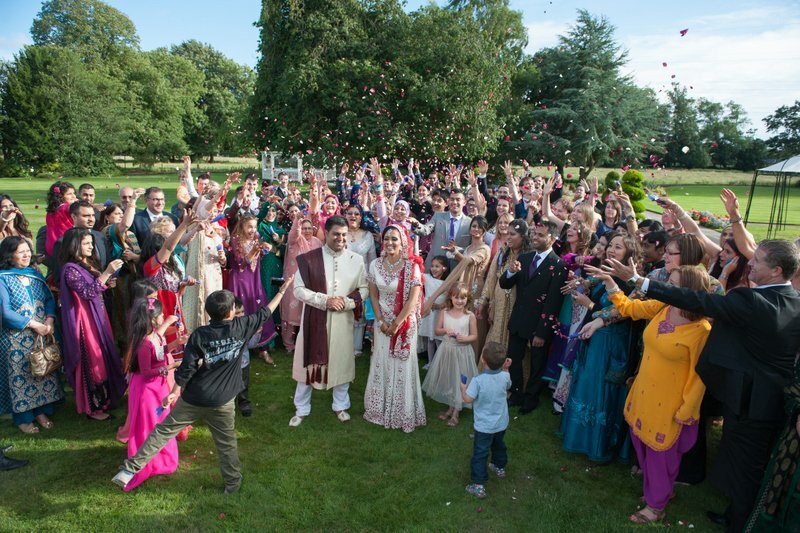 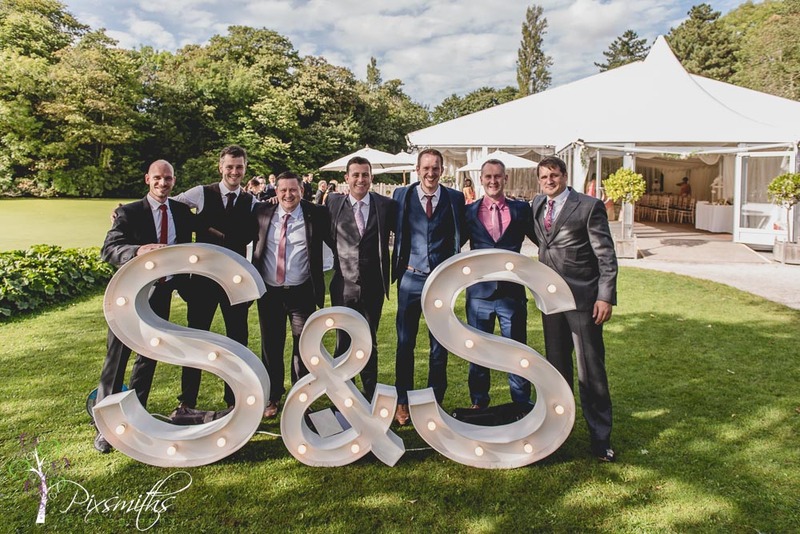 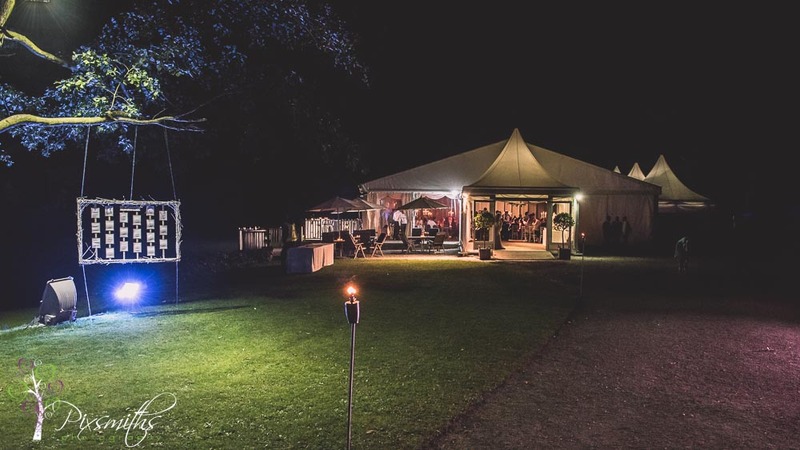 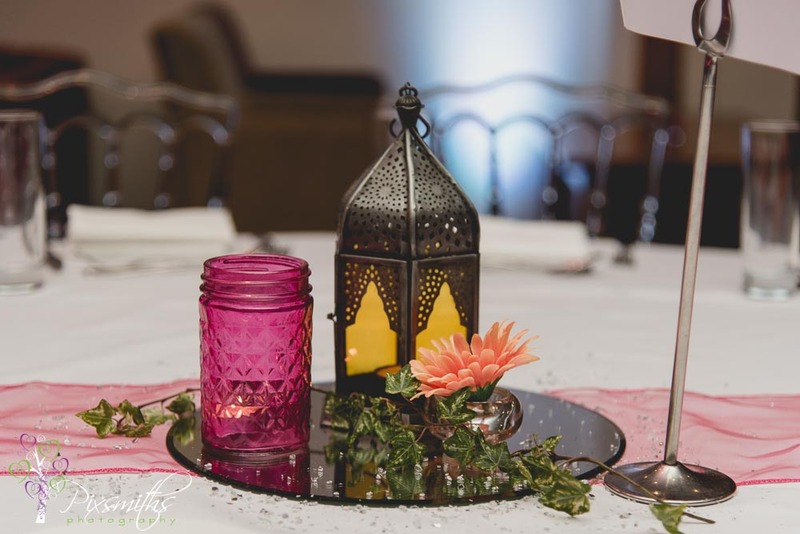 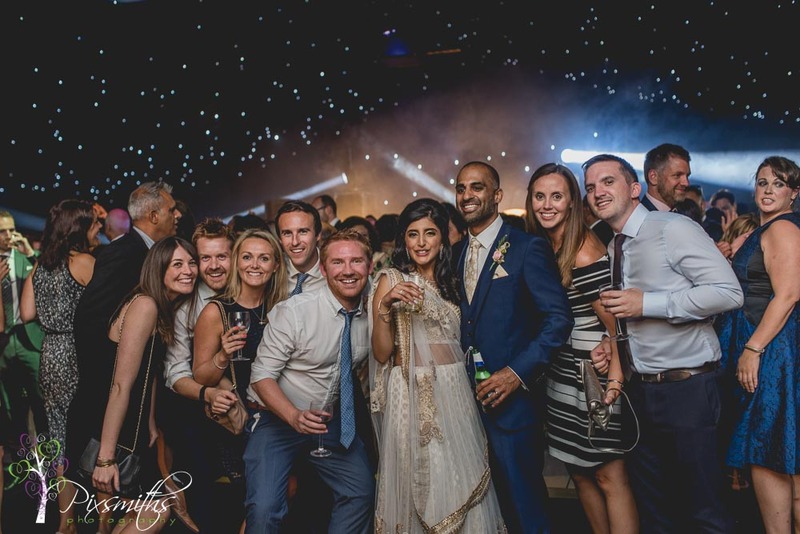 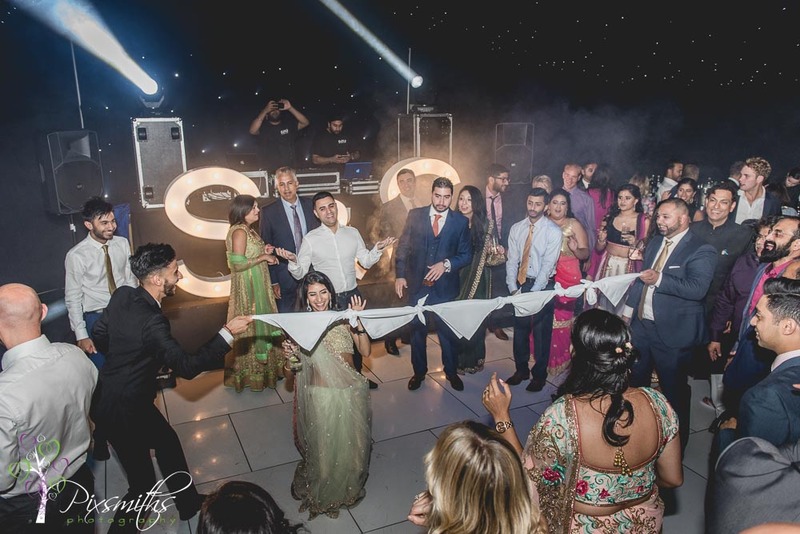 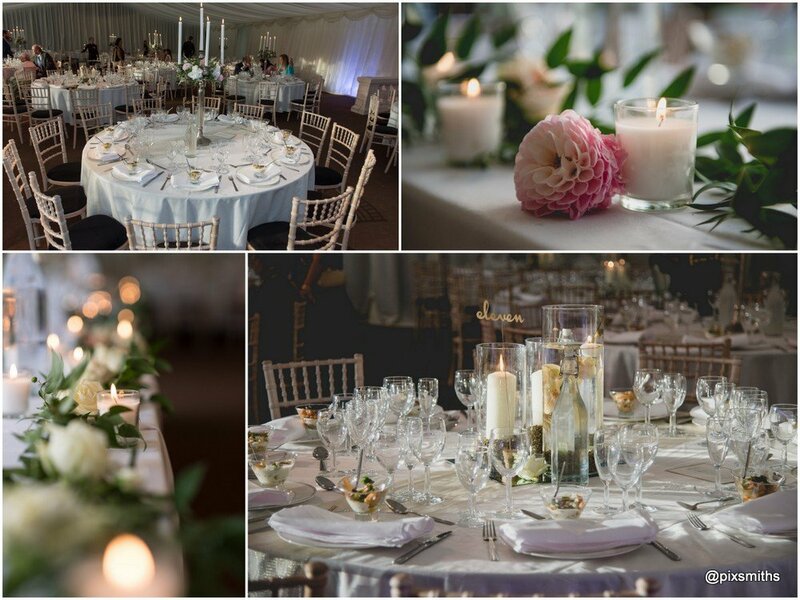 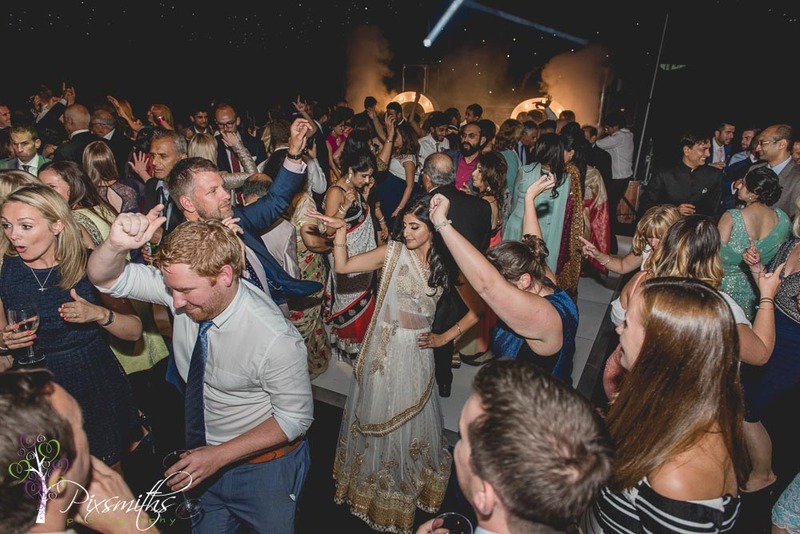 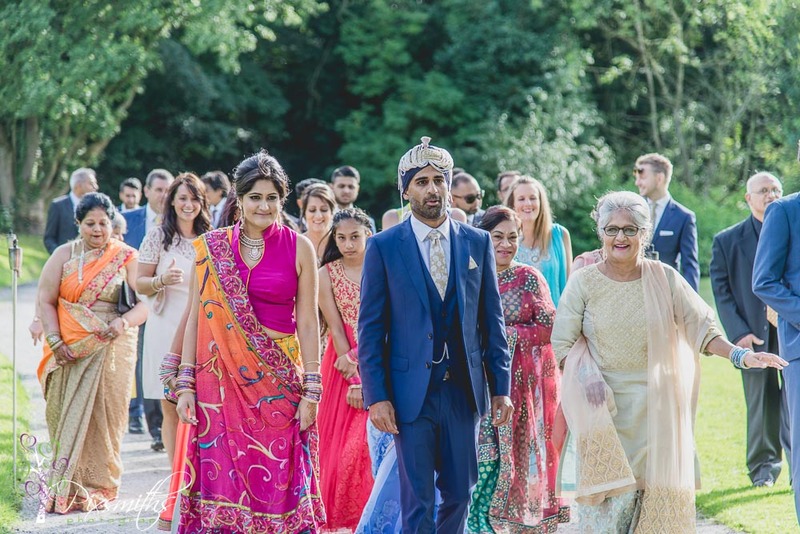 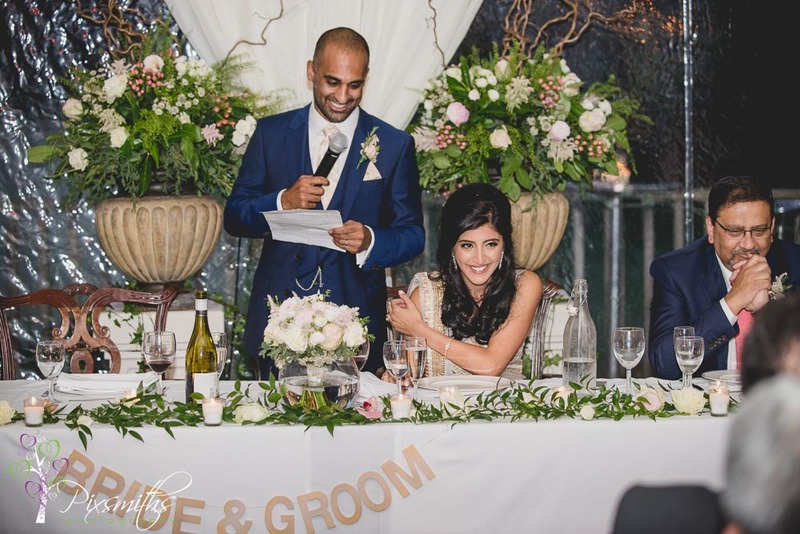 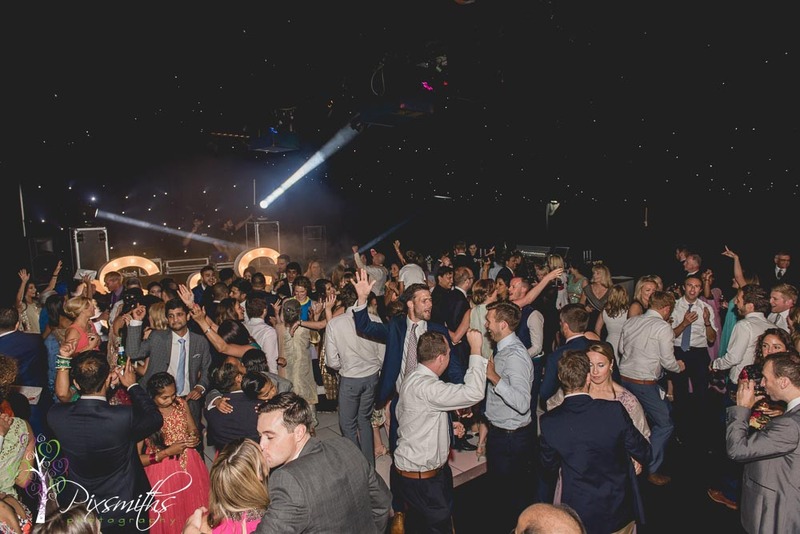 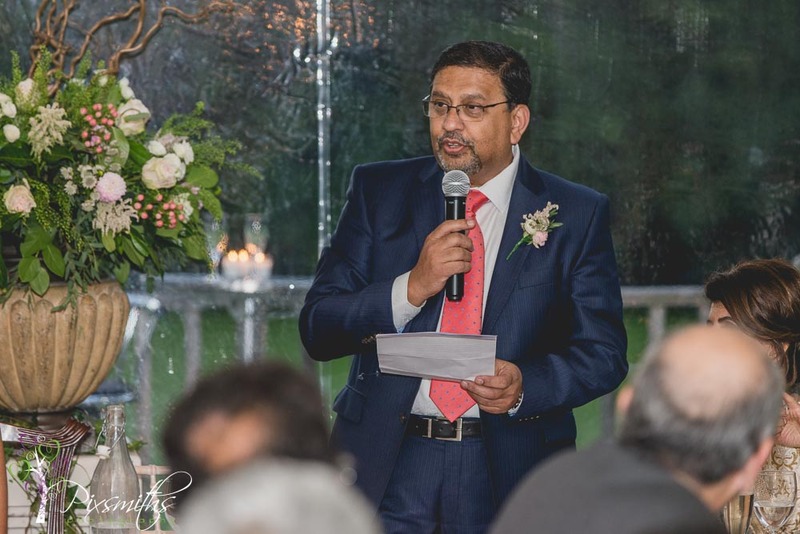 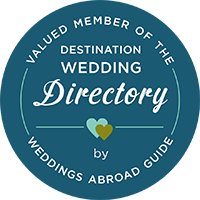 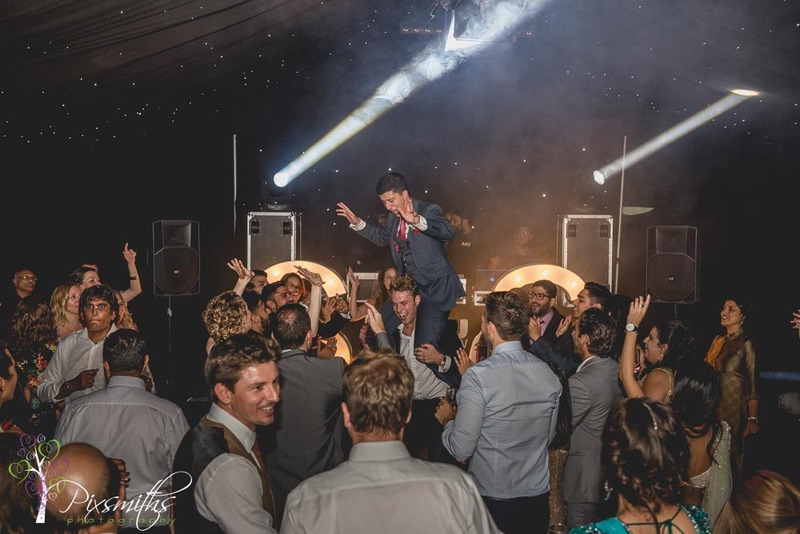 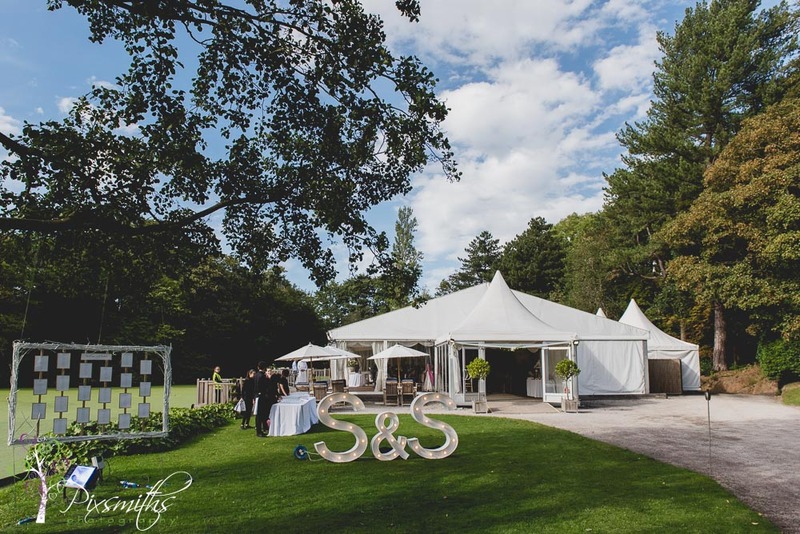 One of the most organised weddings we ever had the pleasure to cover – huge thanks to Martin the event organiser who kept everybody informed with the day’s events as they unfolded meant everyone had a fantastic day and didn’t miss anything. 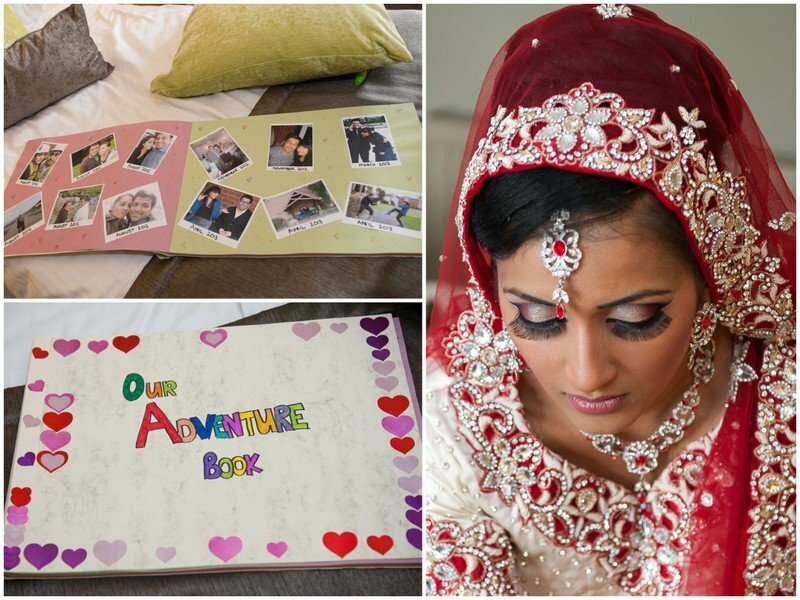 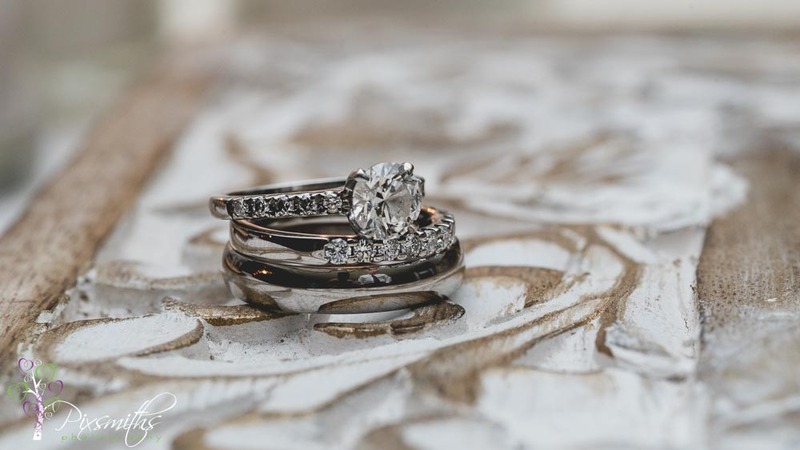 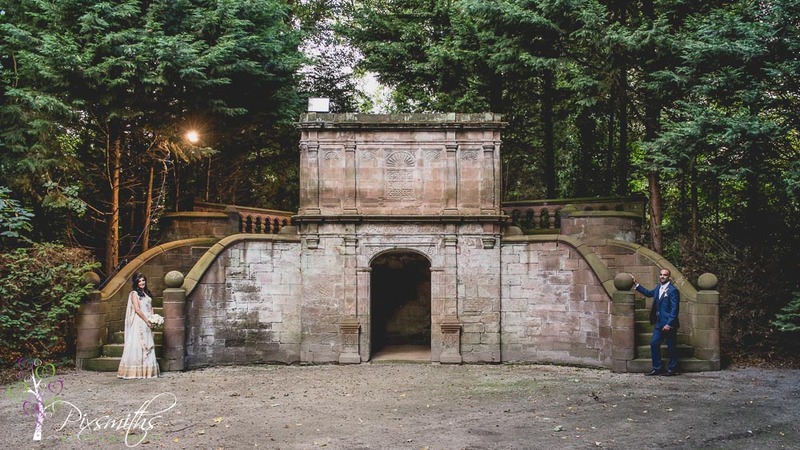 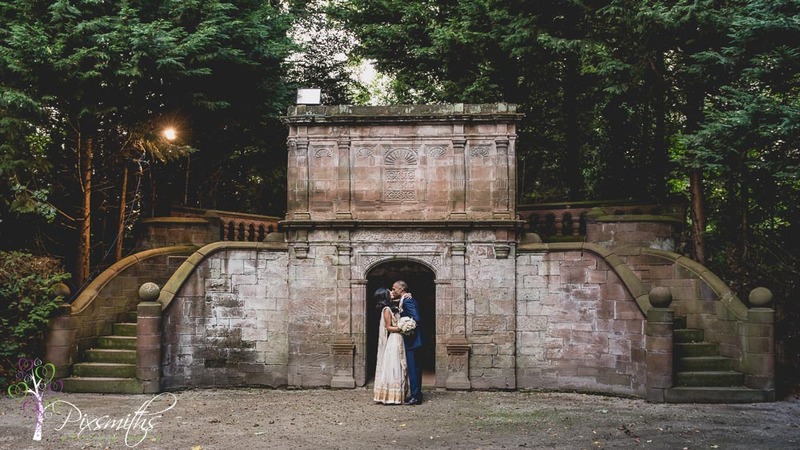 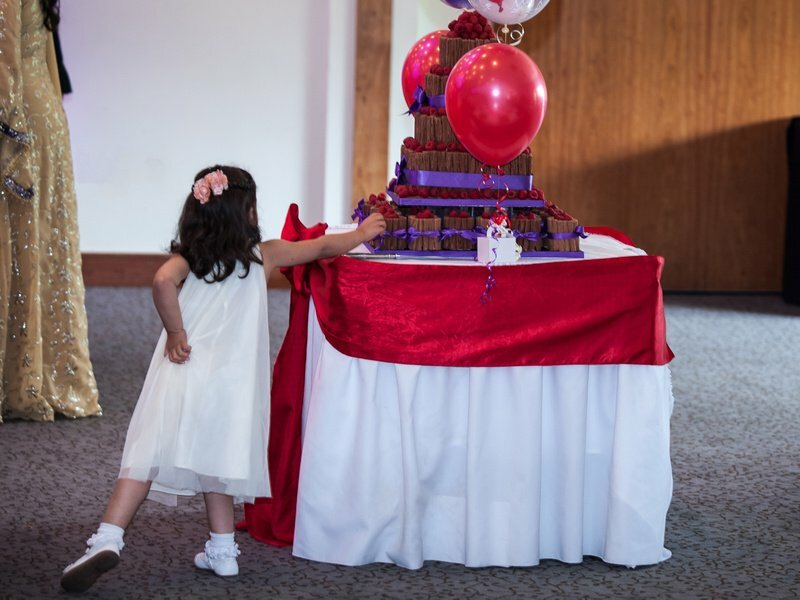 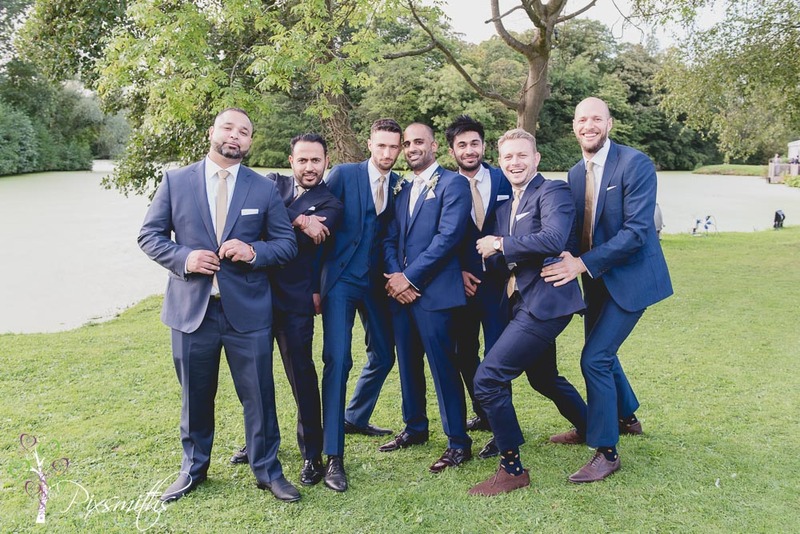 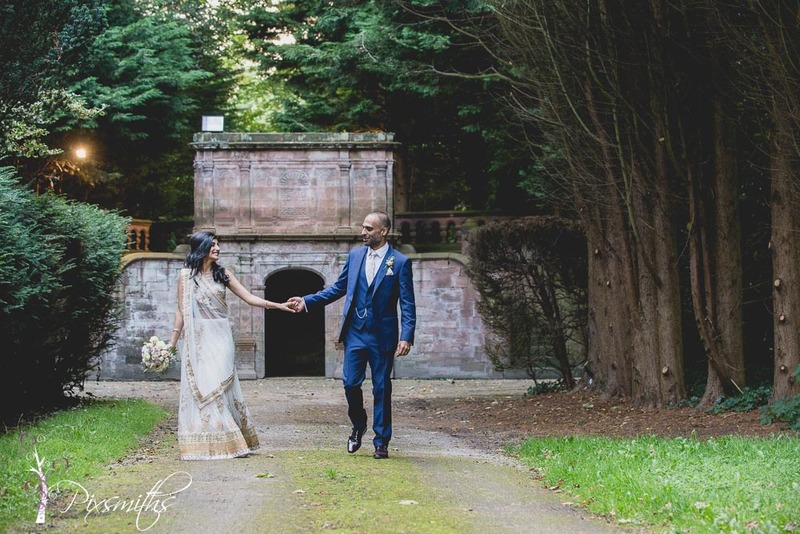 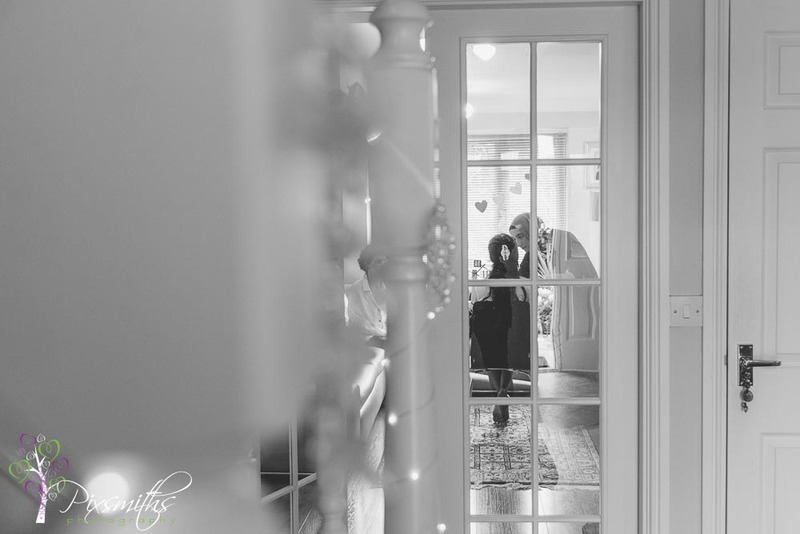 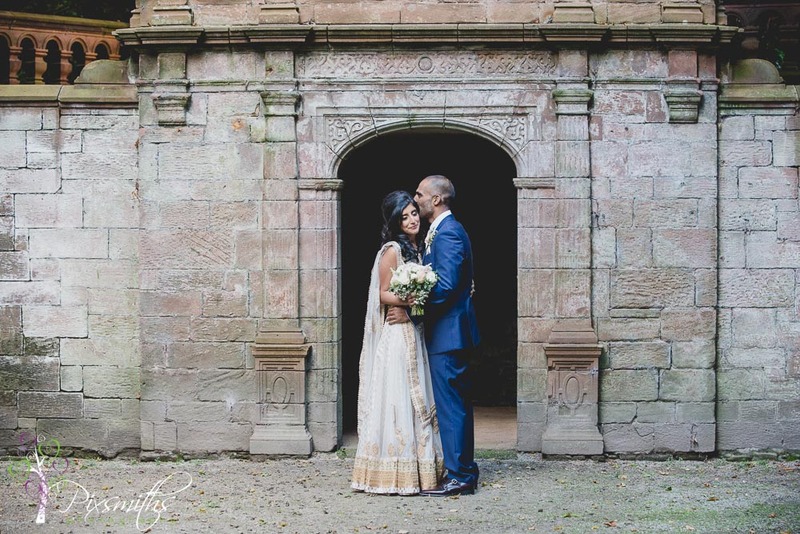 Now you might think that this blog title refers to sneak peeks at some of Biya and Ifan’s images from their beautiful wedding day at Thornton Hall. 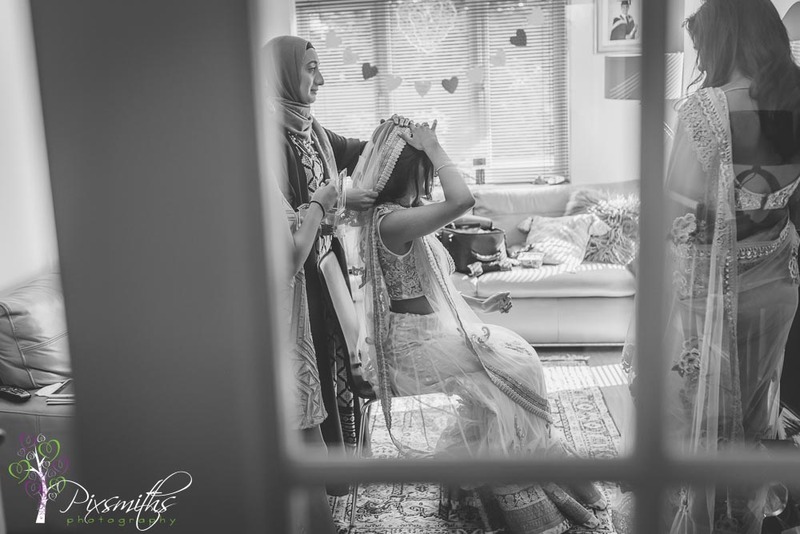 Actually its OUR sneak peeks at them as they saw each other on their wedding in their gorgeous wedding outfits, before the ceremony. 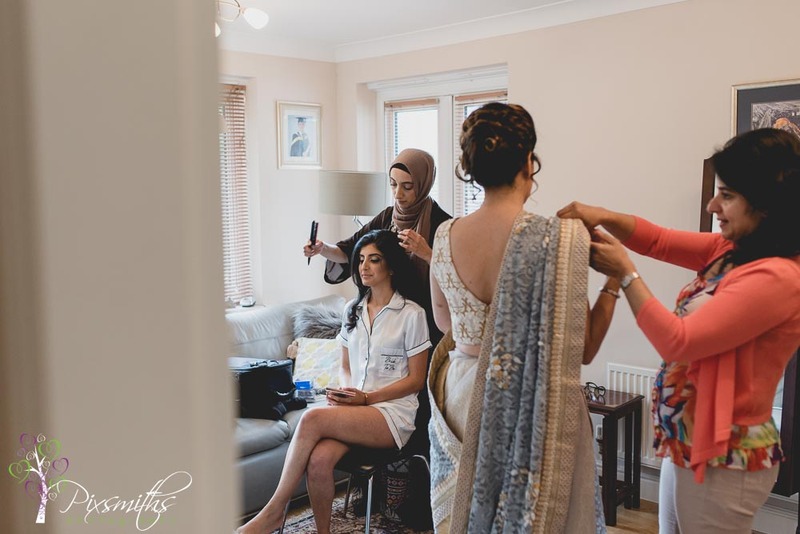 Their wedding day schedule was different from the traditional British one where groom is awaiting his bride at the altar and they had already requested to have their portraits before their two ceremonies which led straight in to their reception – but we’ll save that for another time. 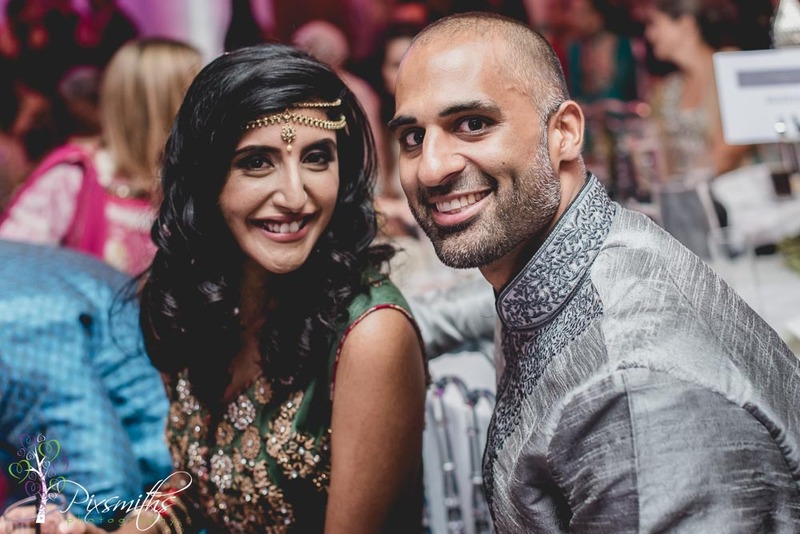 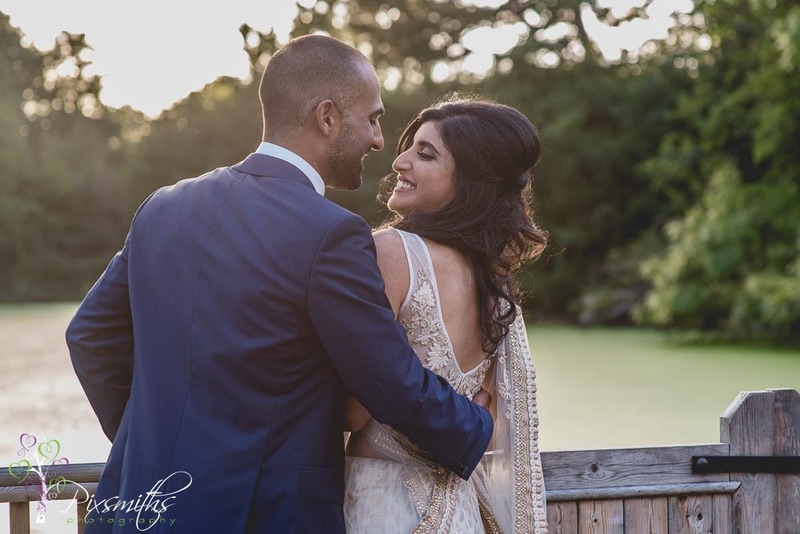 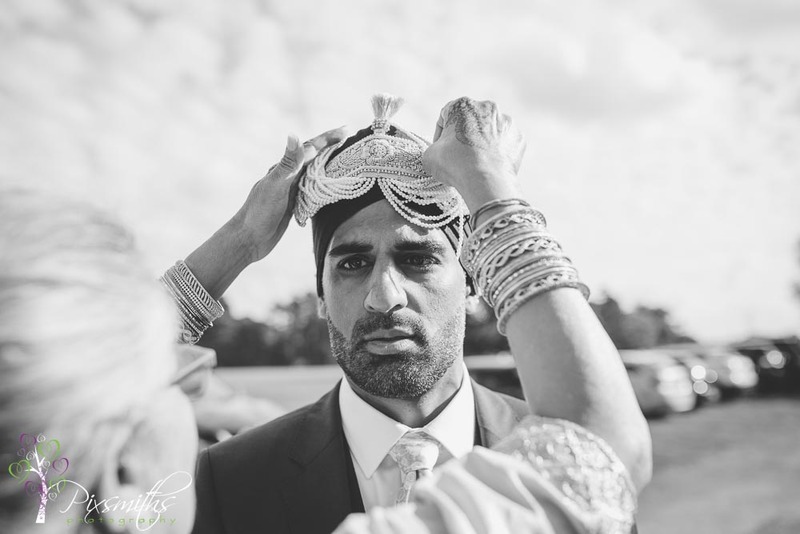 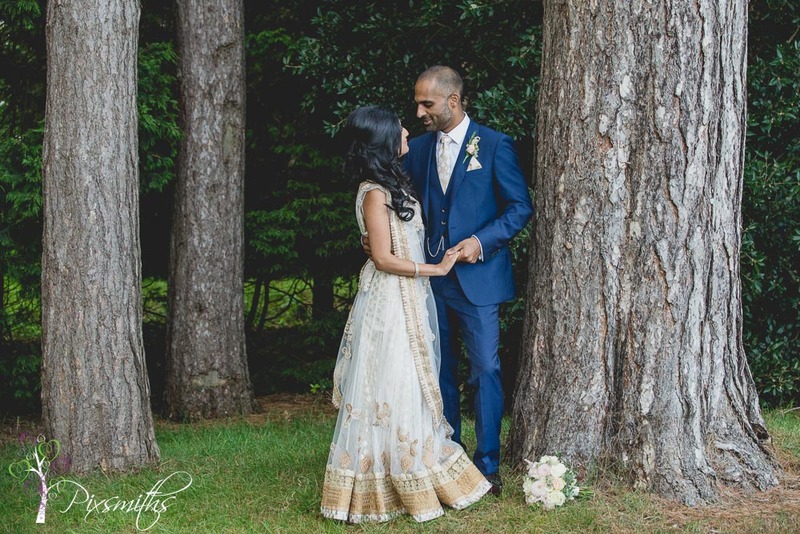 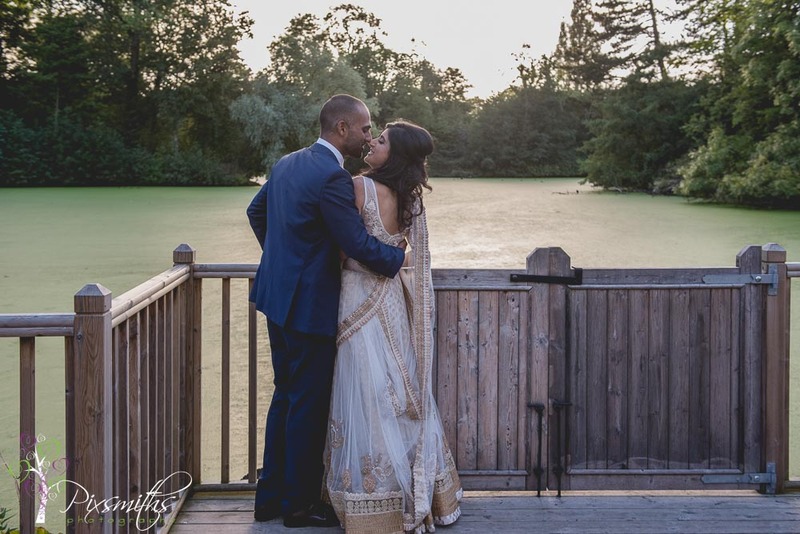 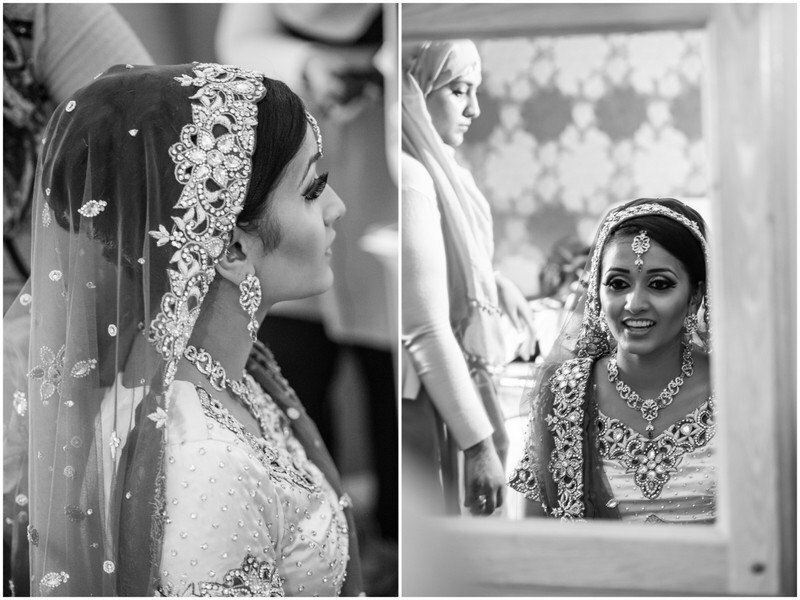 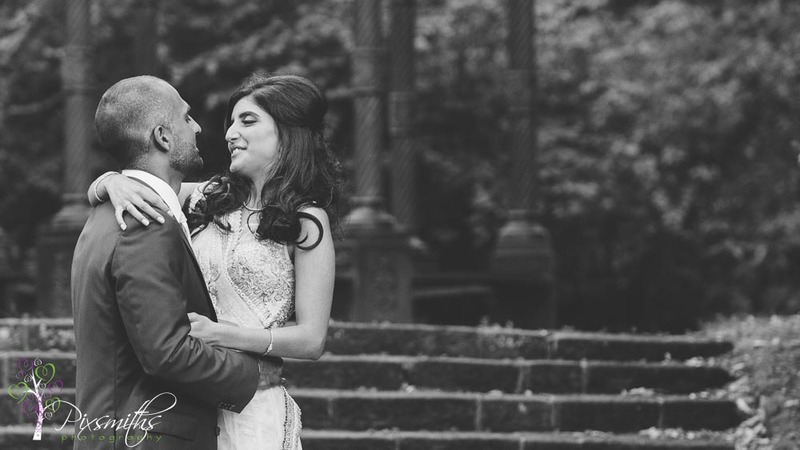 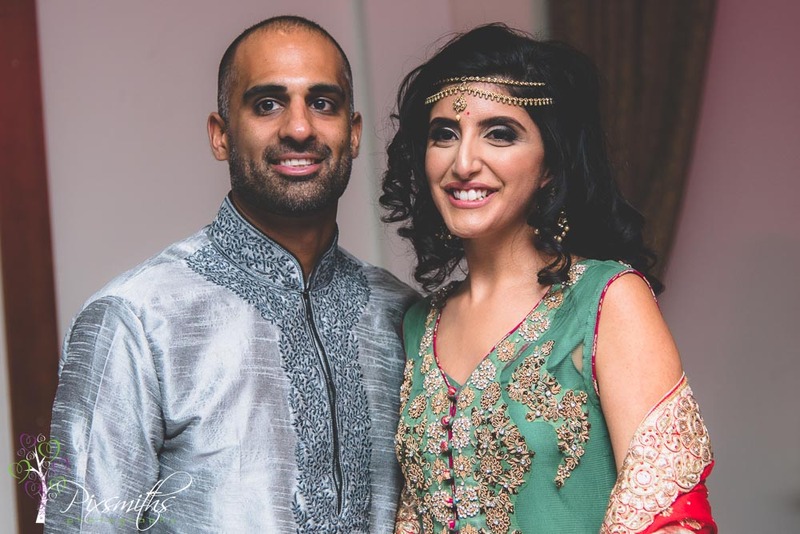 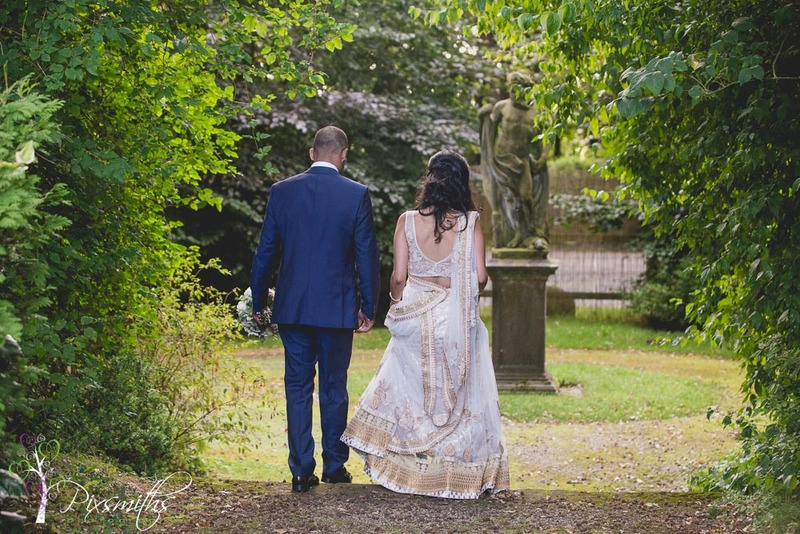 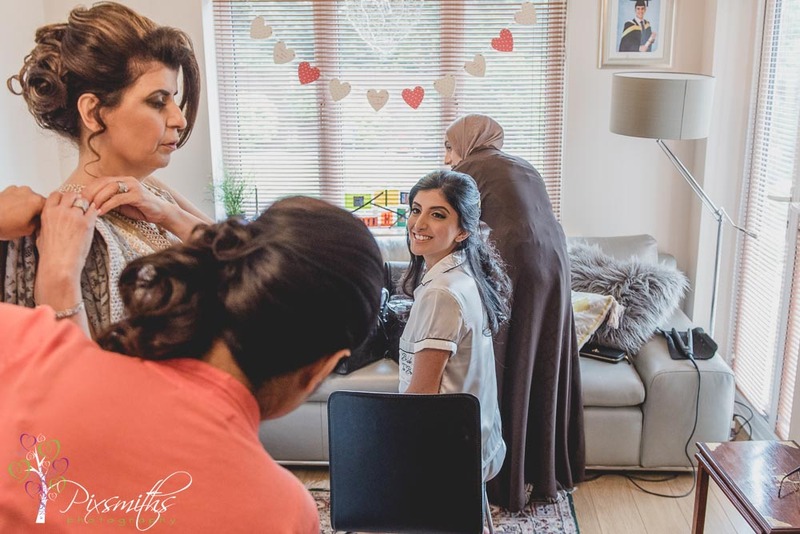 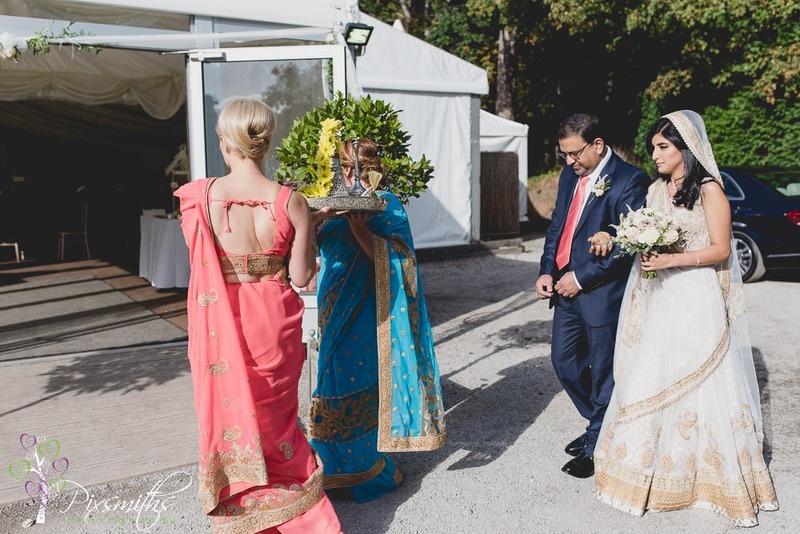 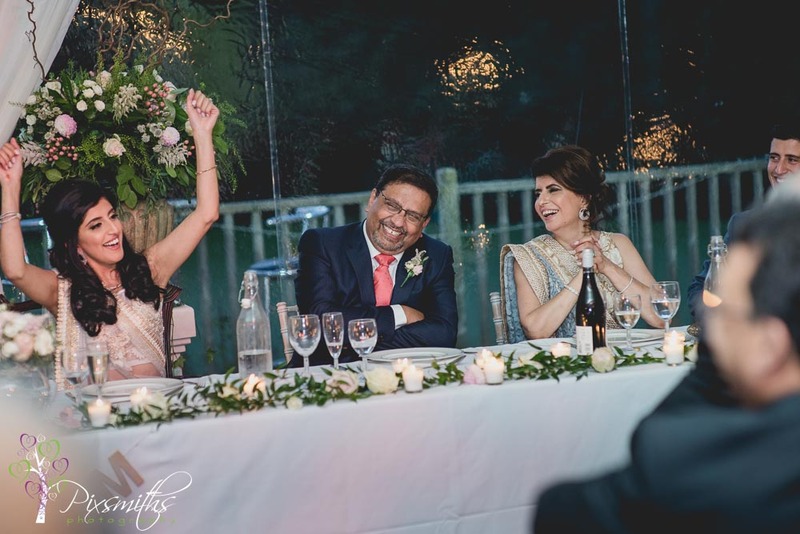 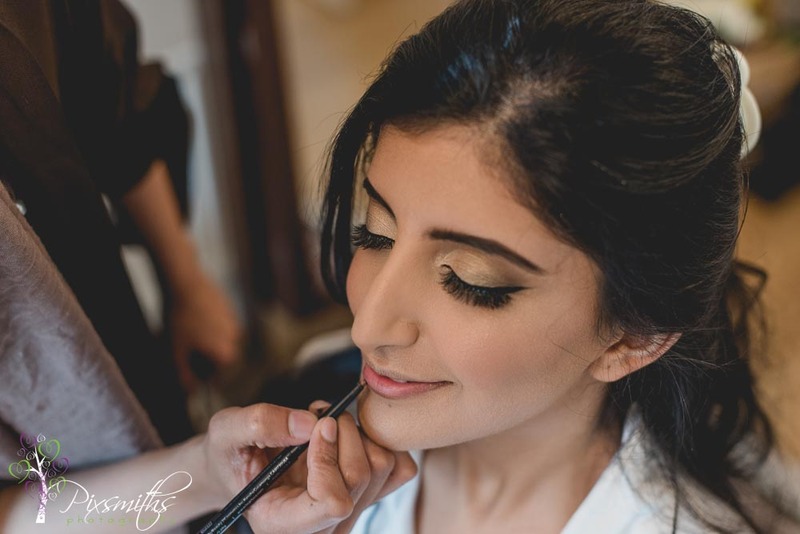 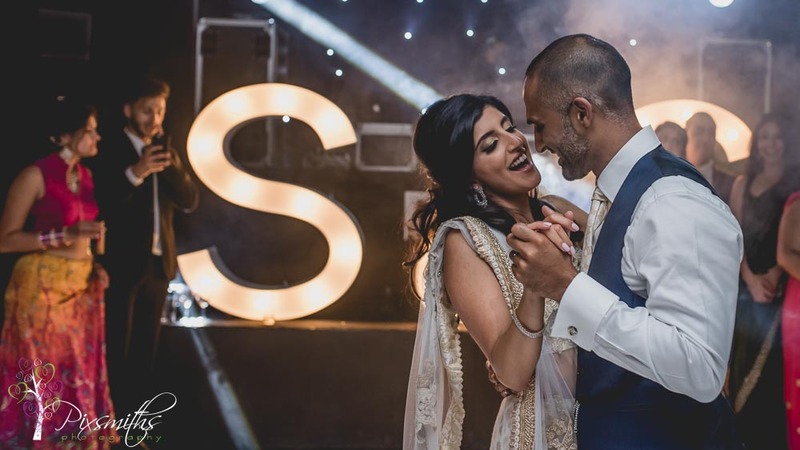 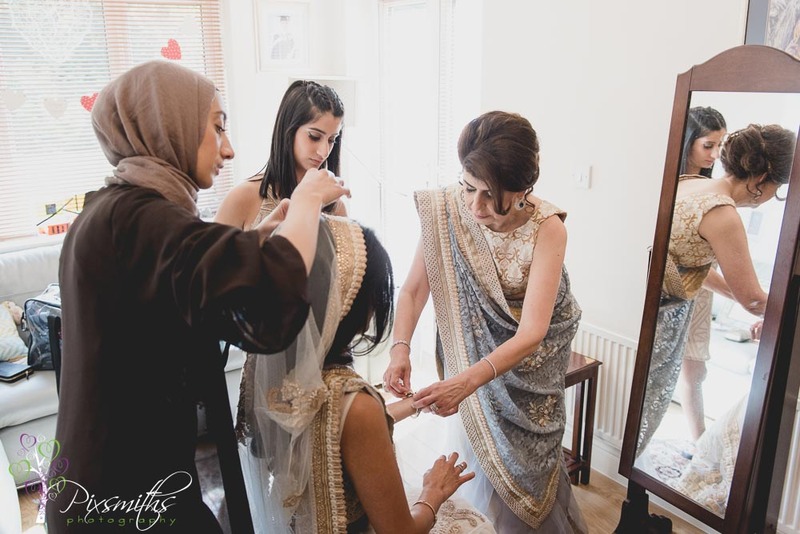 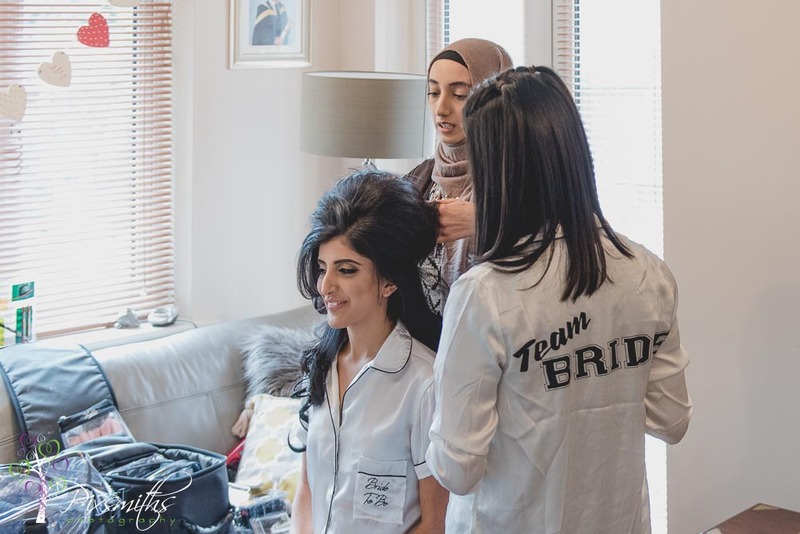 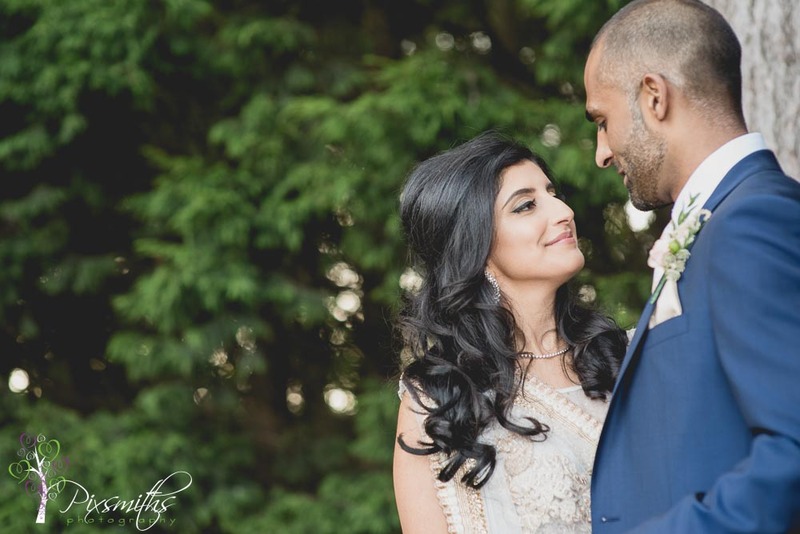 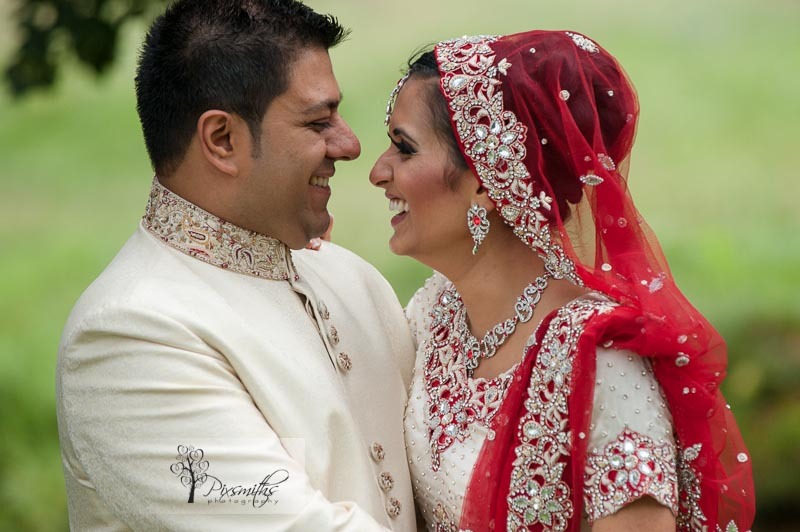 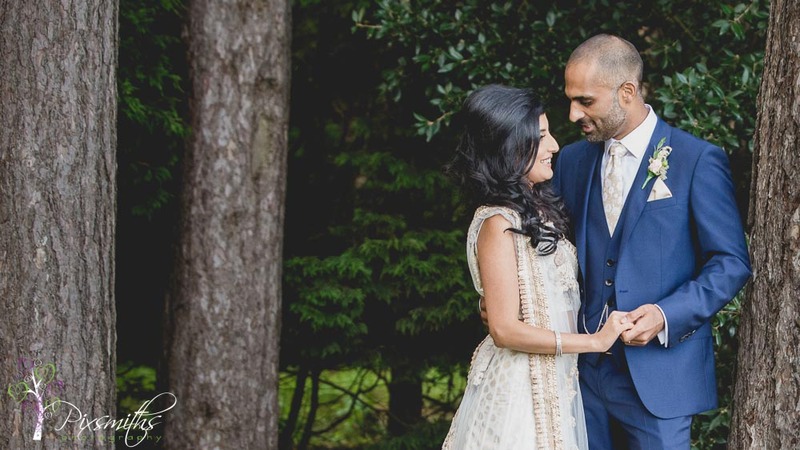 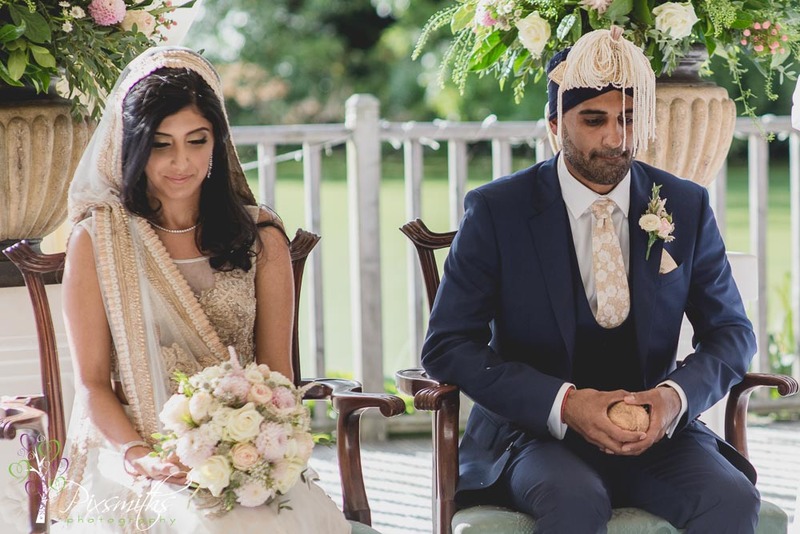 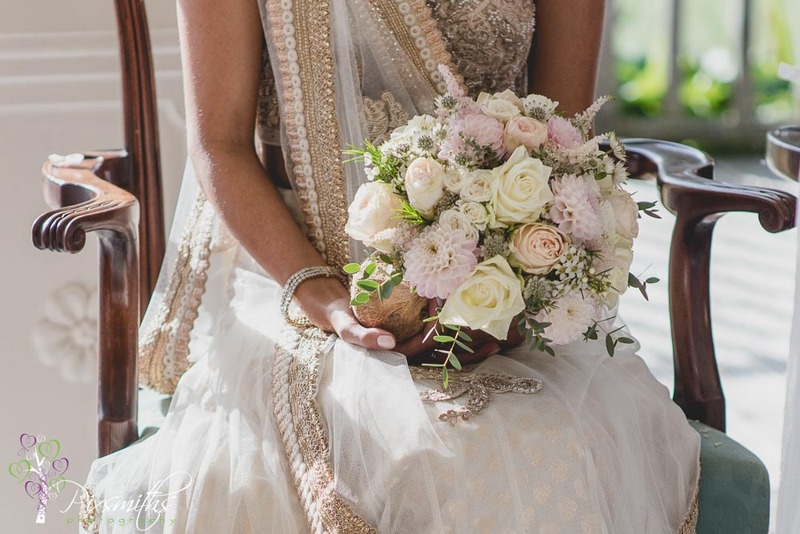 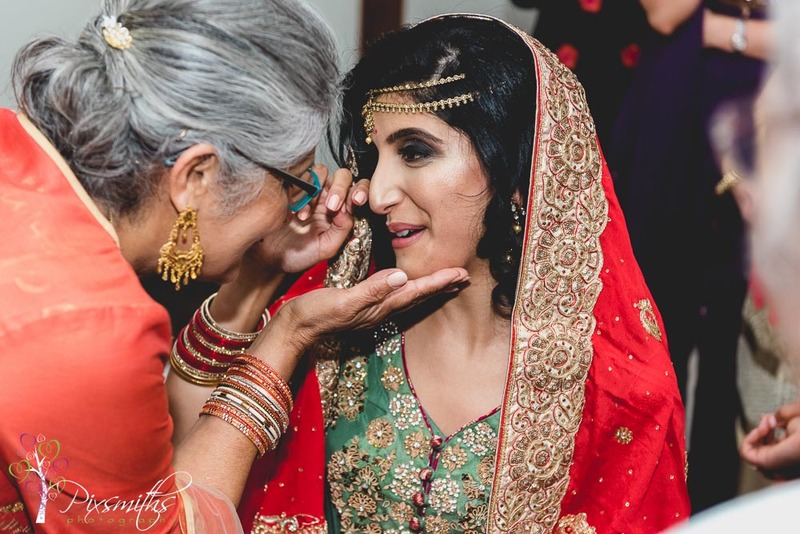 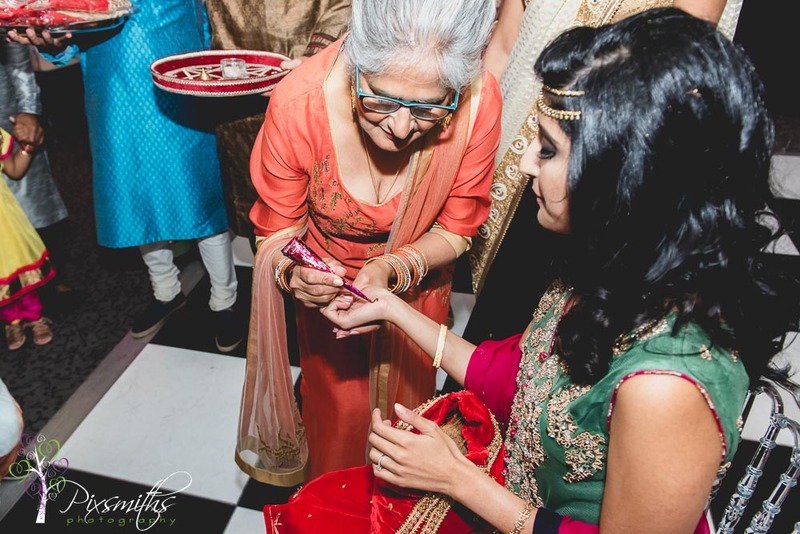 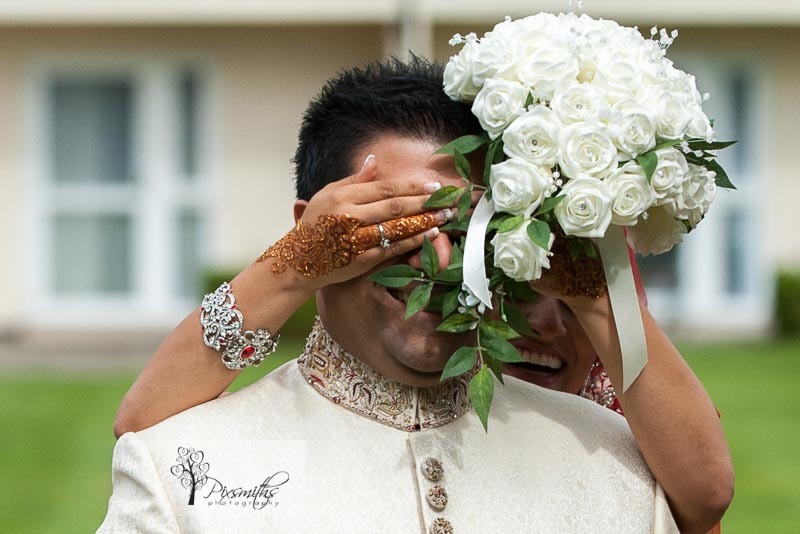 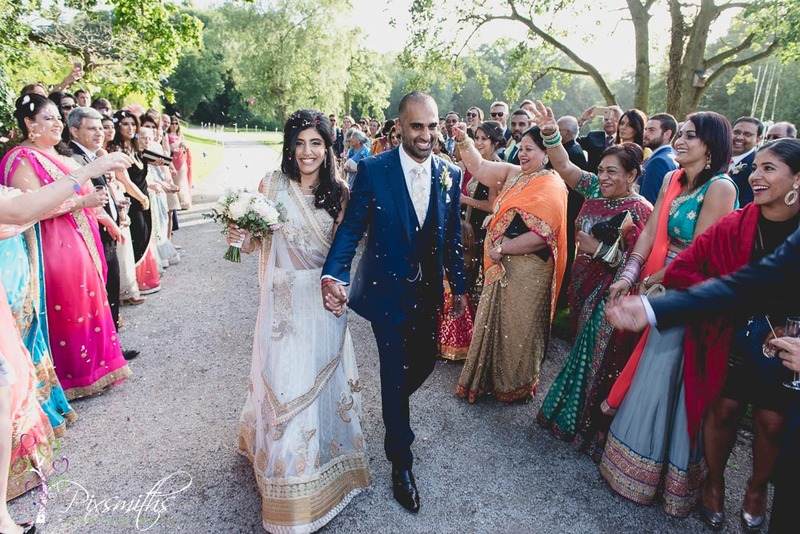 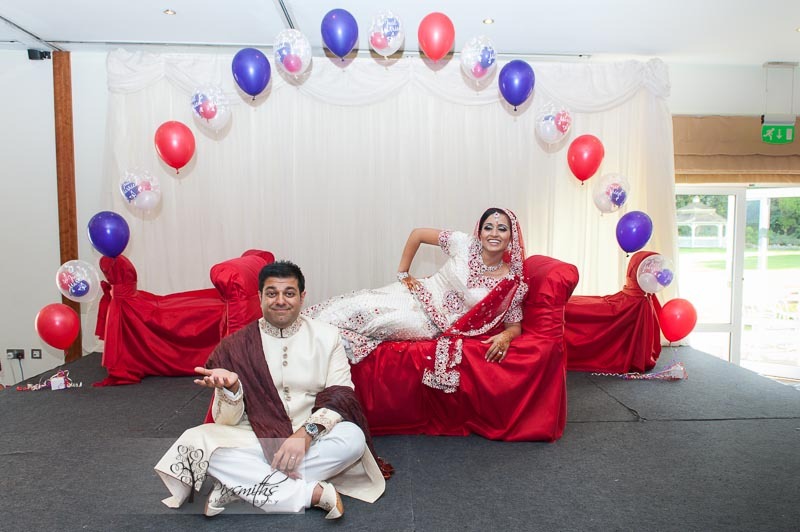 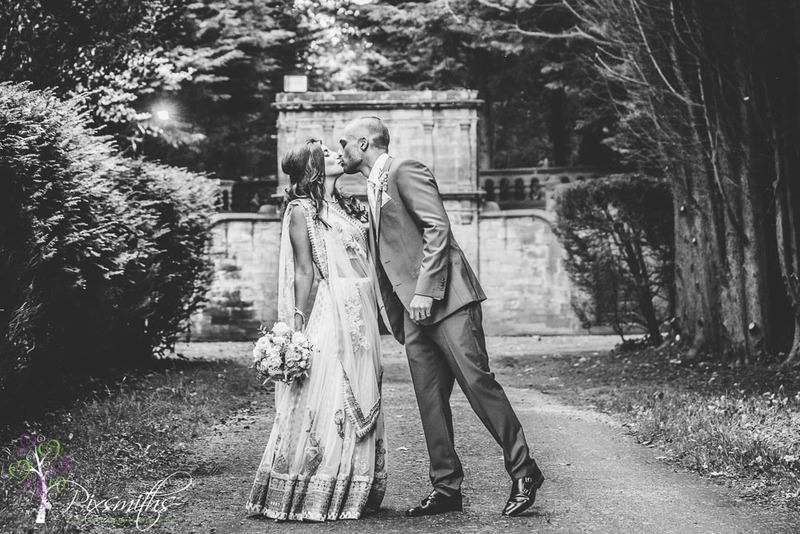 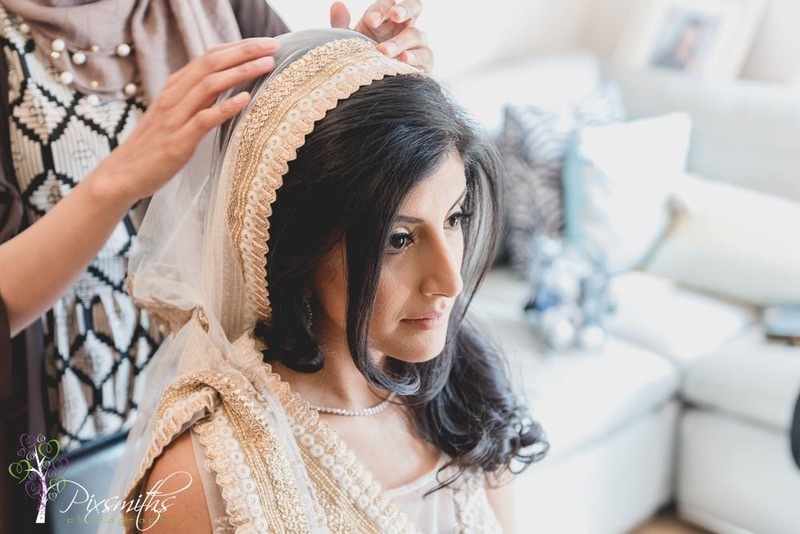 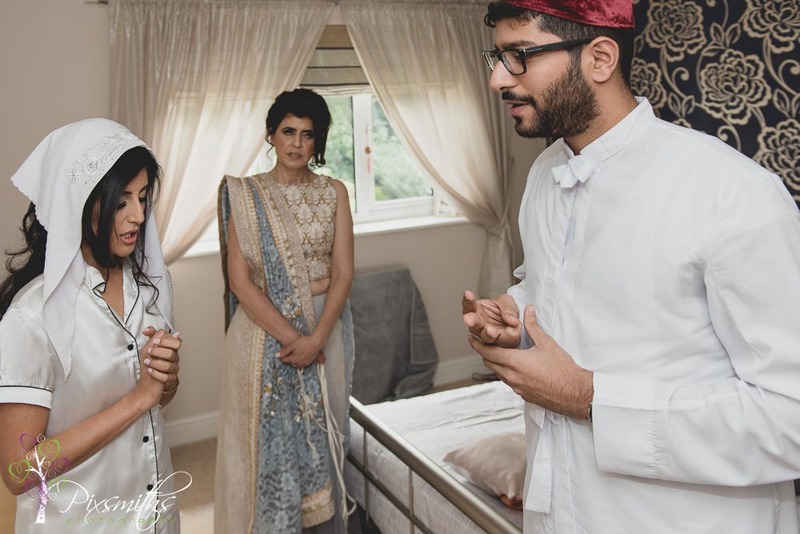 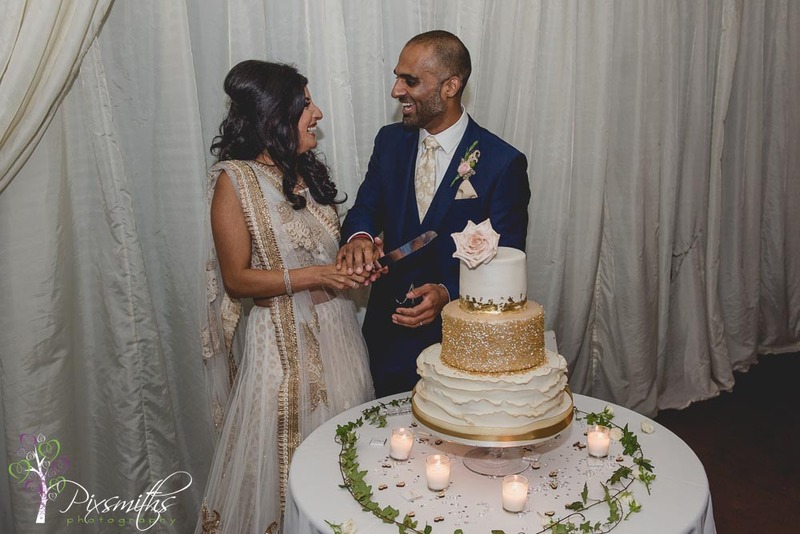 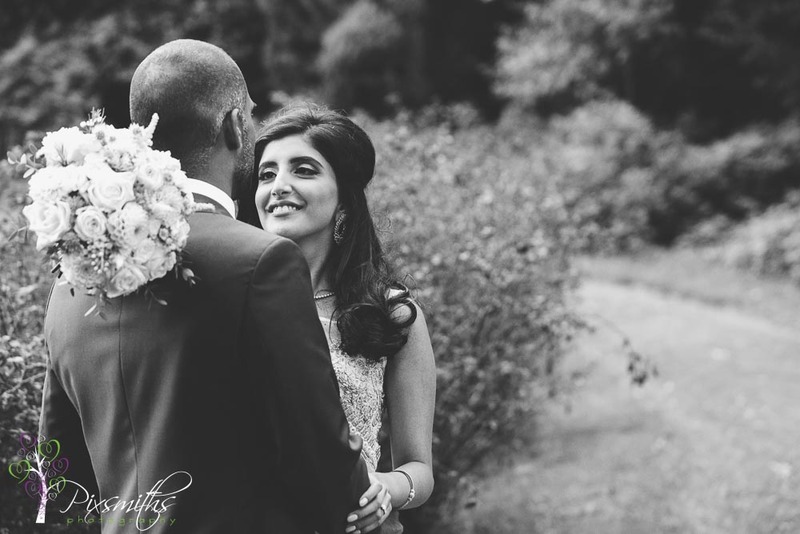 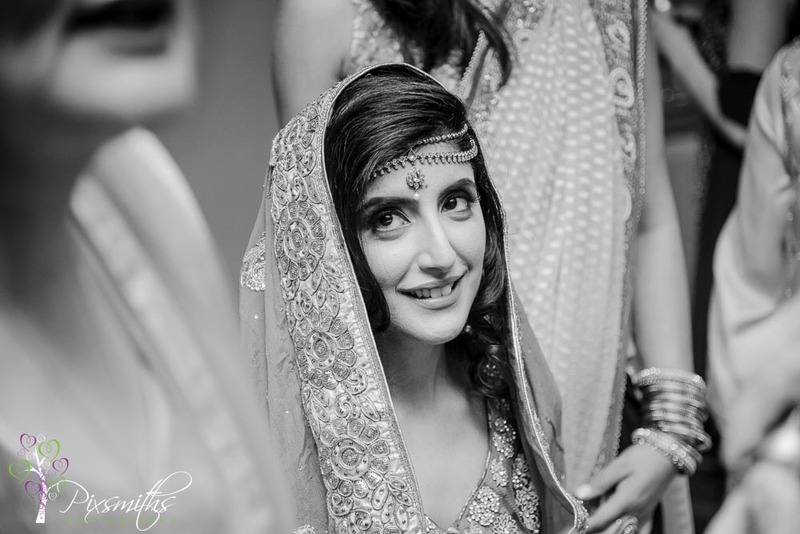 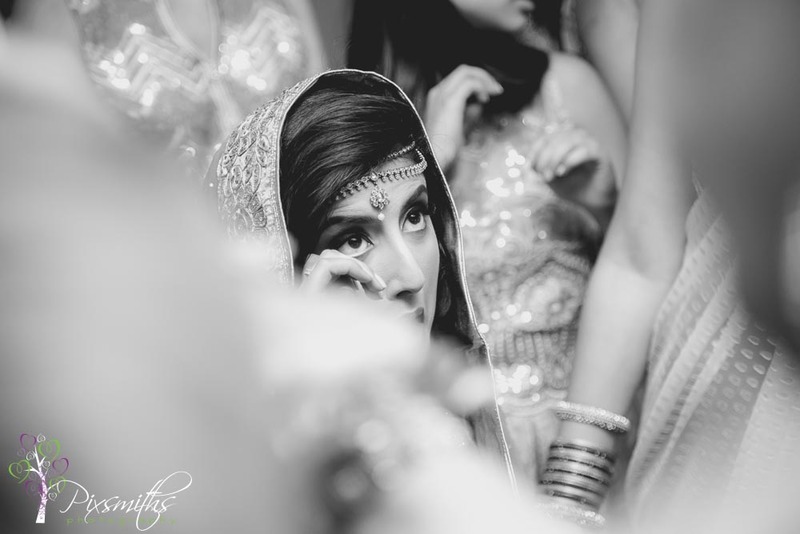 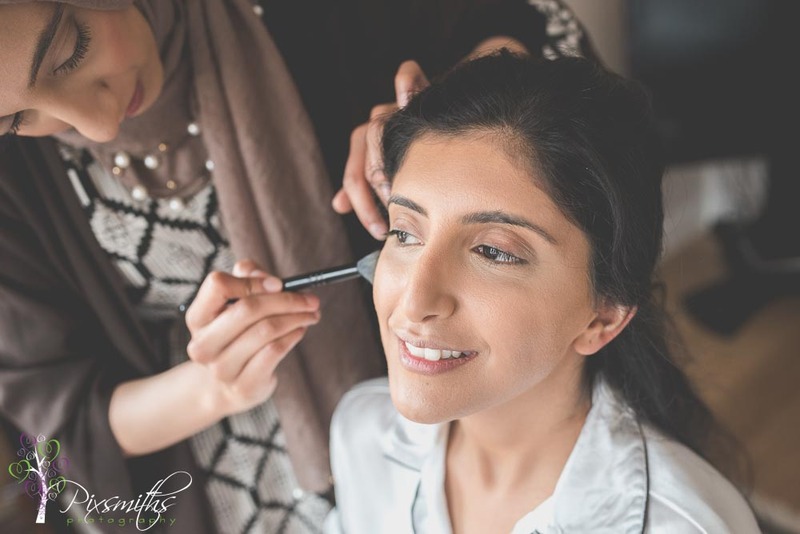 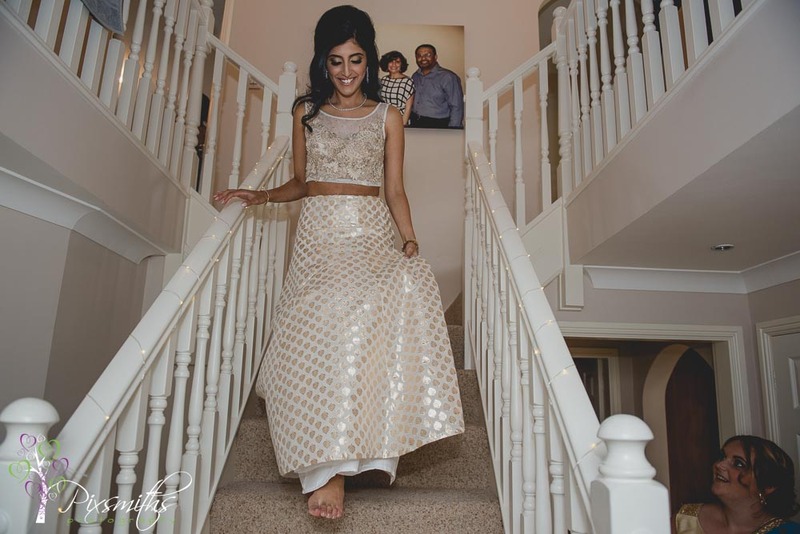 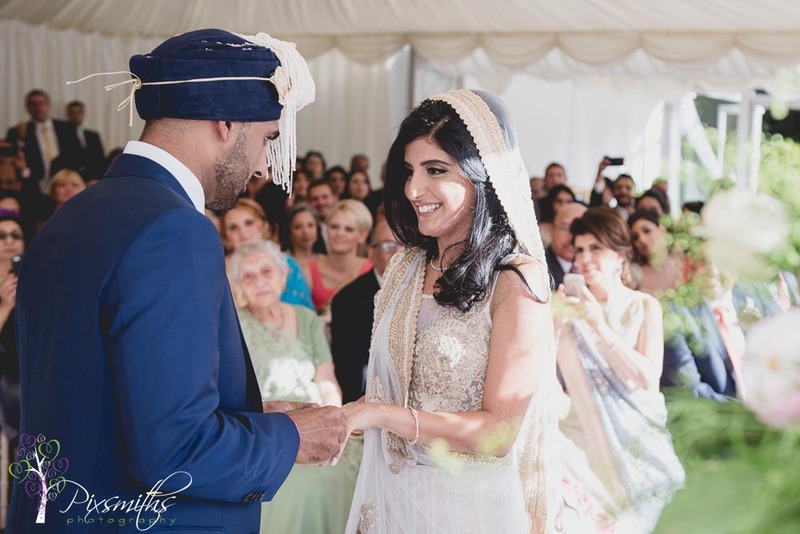 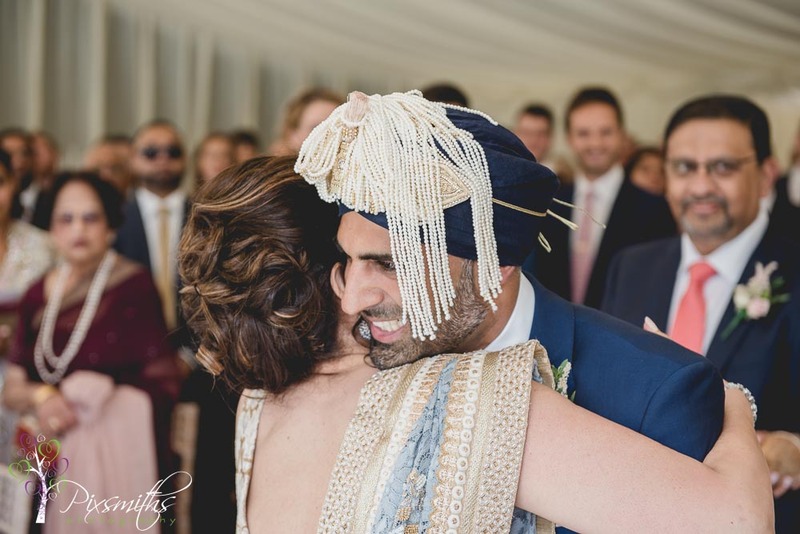 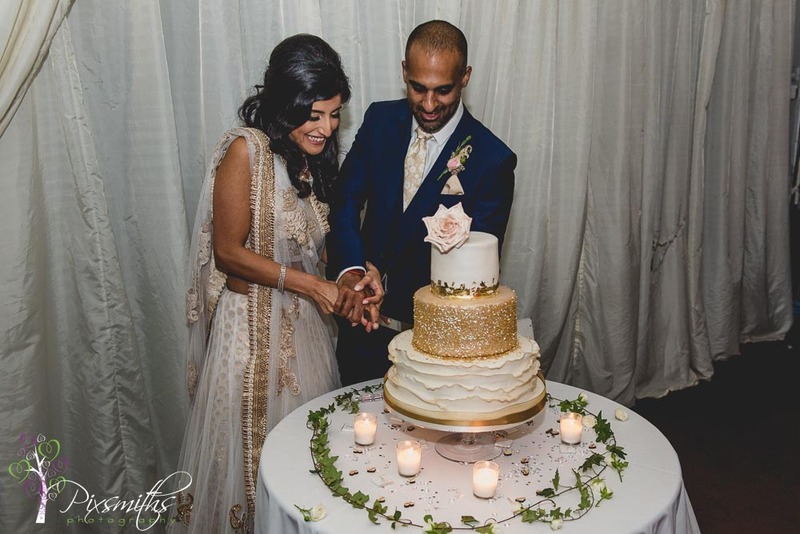 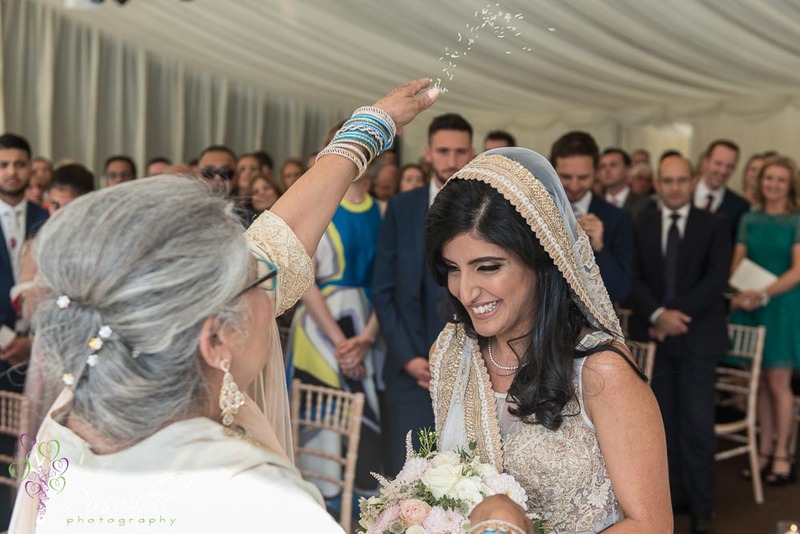 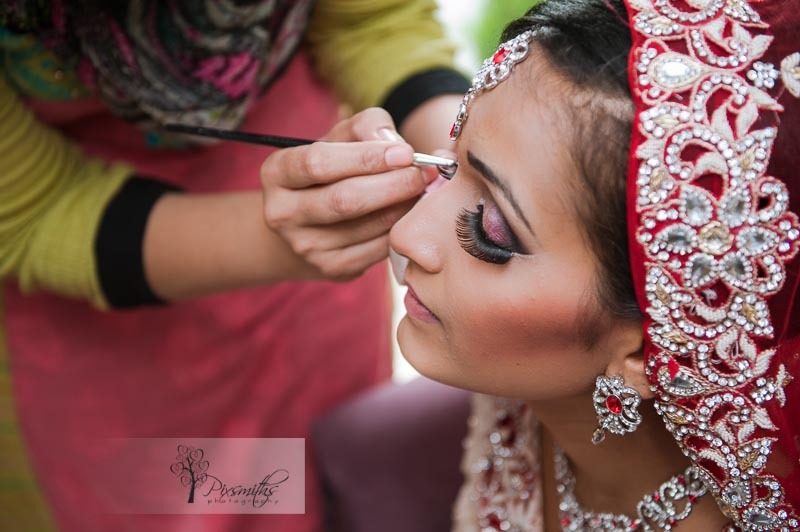 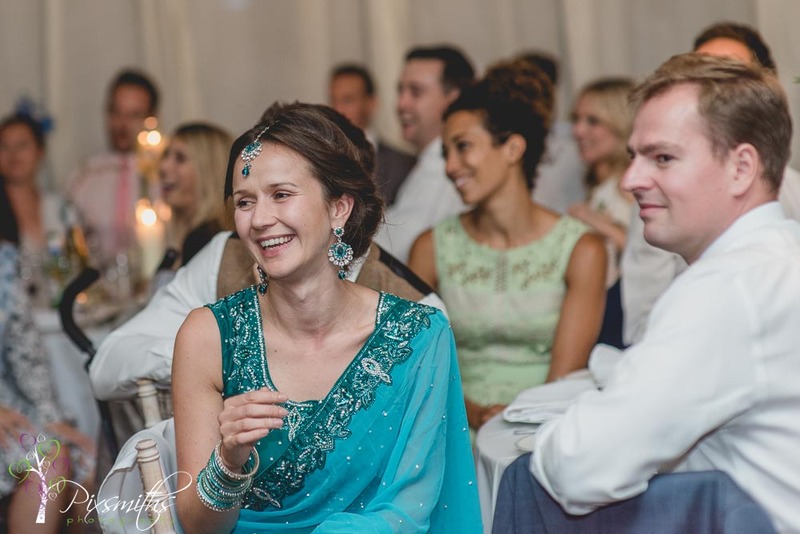 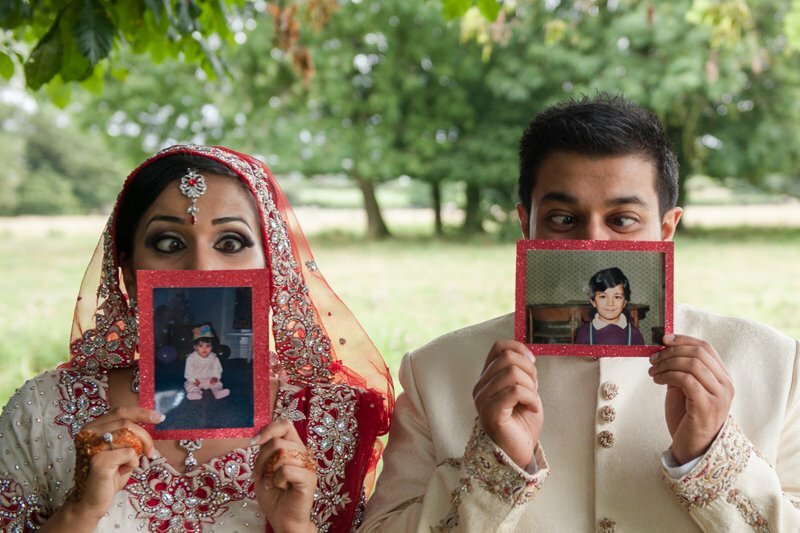 So this fun couple were happy to try something a bit different and do this “First Look” and then do a few portraits Biya was beautifully made up by her skilful specialist Asian MUA and bedecked in beautiful jewels to accompany her stunning bridal dress. 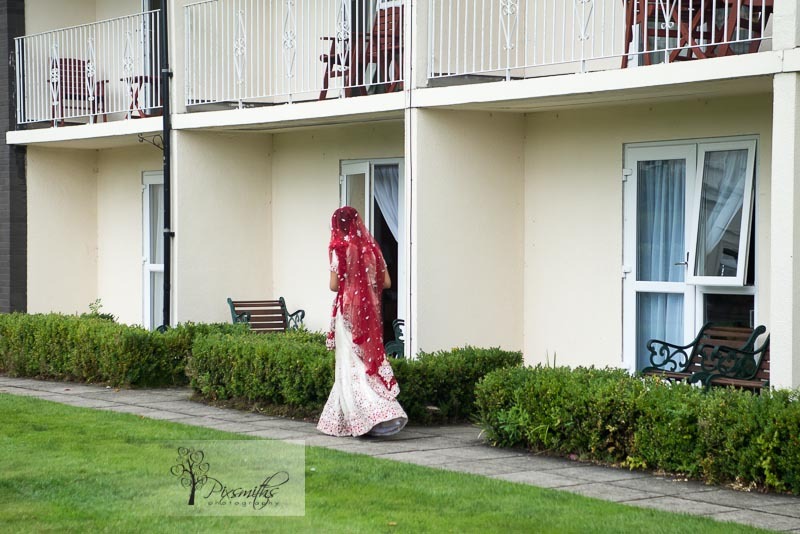 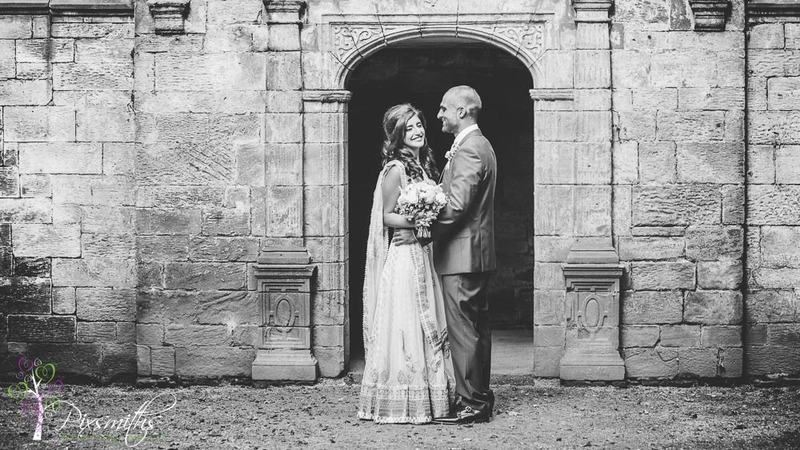 Her room was on the ground floor at Thornton Hall and so was easy to open the patio doors , leading onto the grounds and walk along the path towards Irfan, put her hand over his eyes and turn him around so they could admire each other – a special moment just between the two of them…well and of course us but we were just standing back and capturing the reaction with some long lenses unobtrusively. 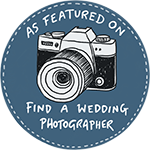 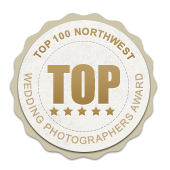 Its quite popular in America to do this type of shoot but becoming more popular in the UK now and could be a good idea if you have tight time schedules between end of service and sitting down for the wedding breakfast. 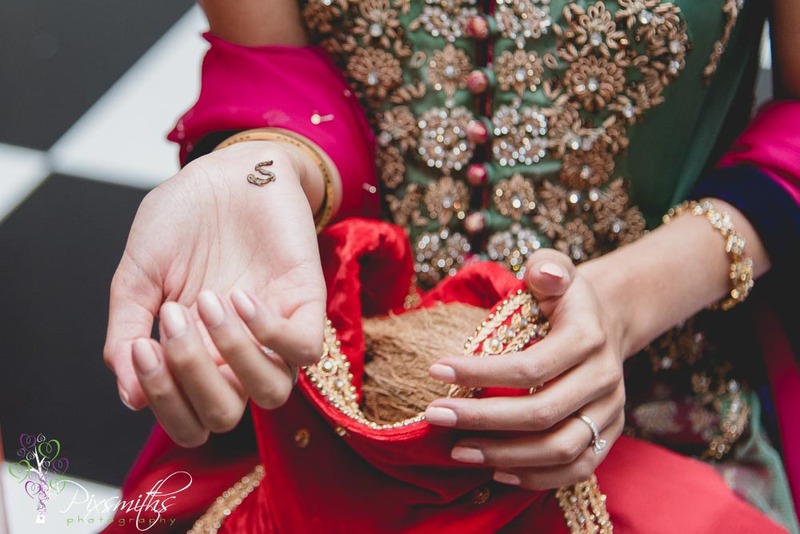 Would you dare to do this?? 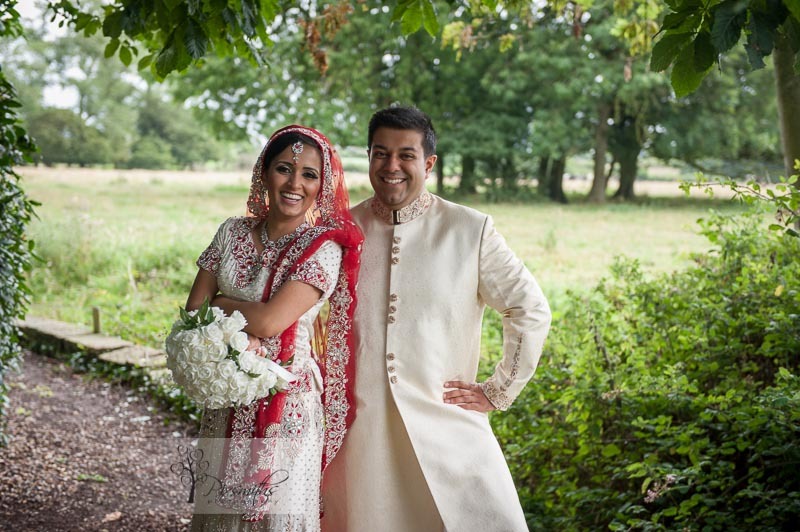 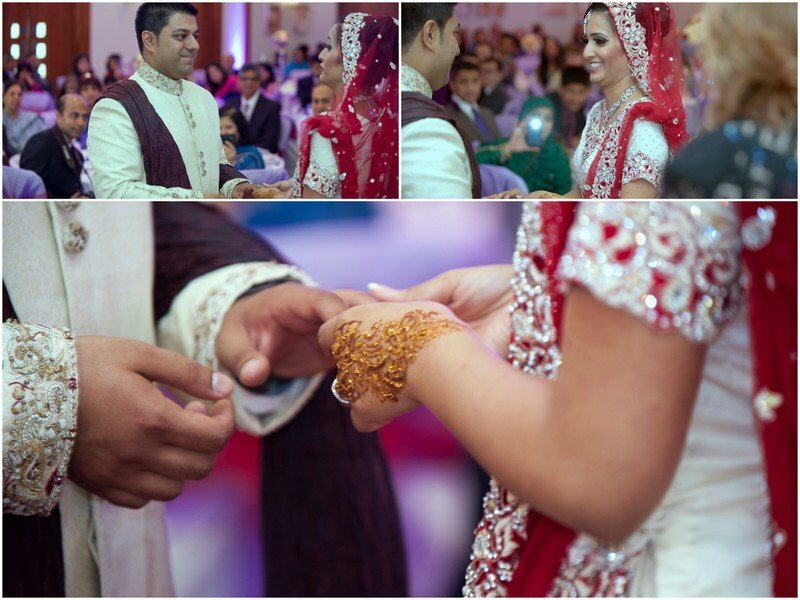 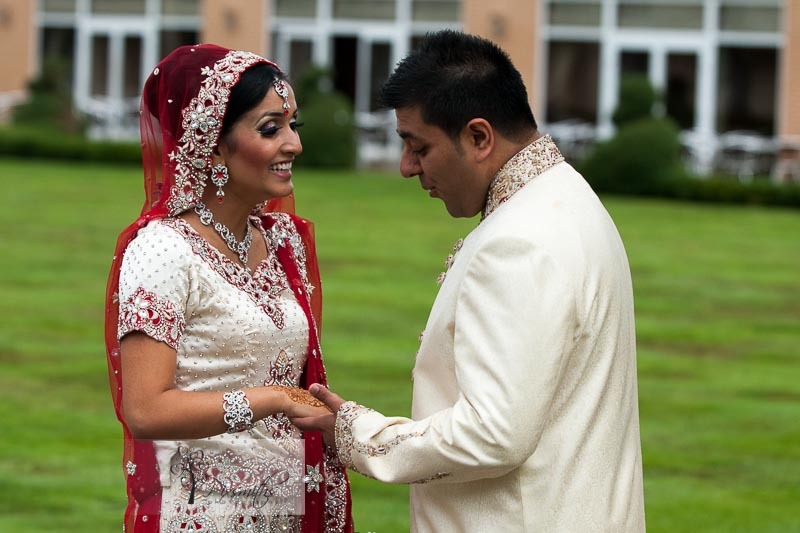 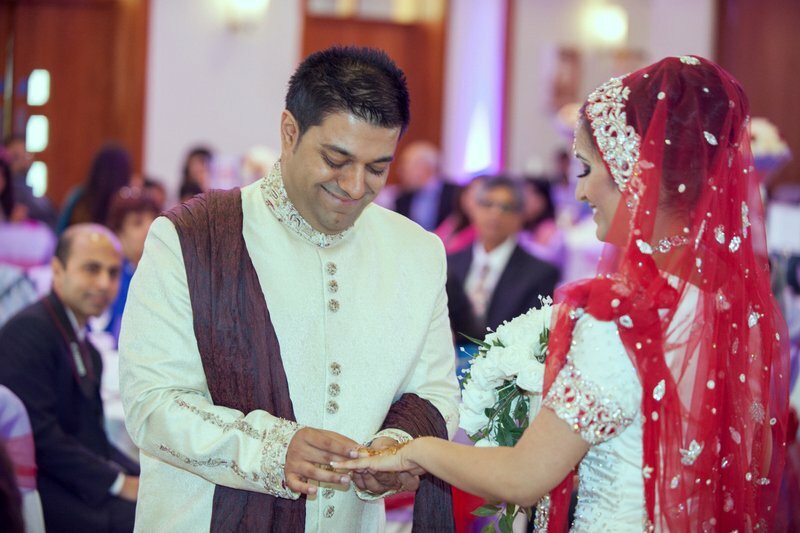 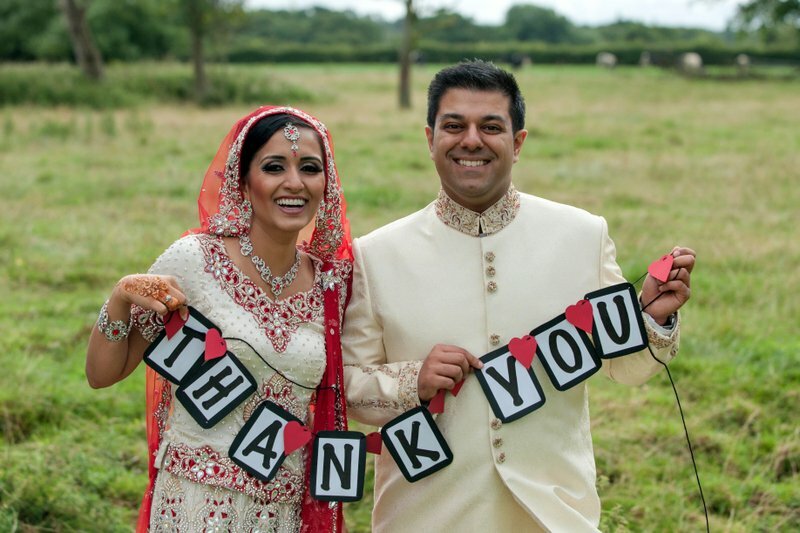 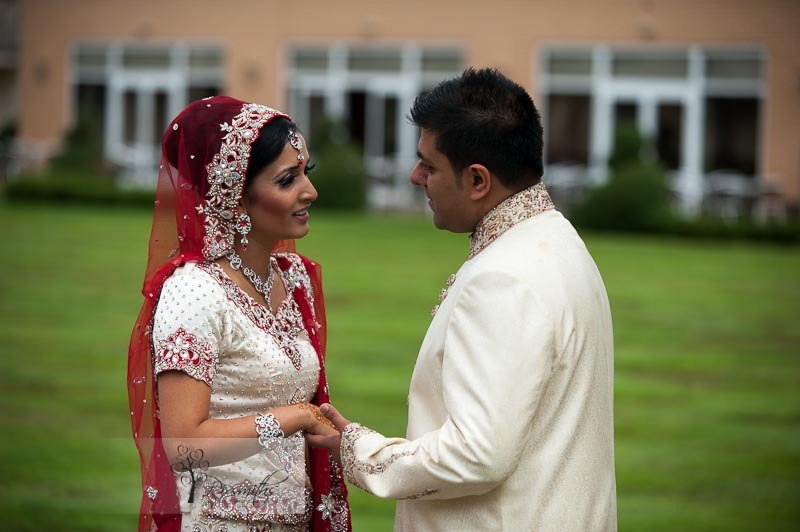 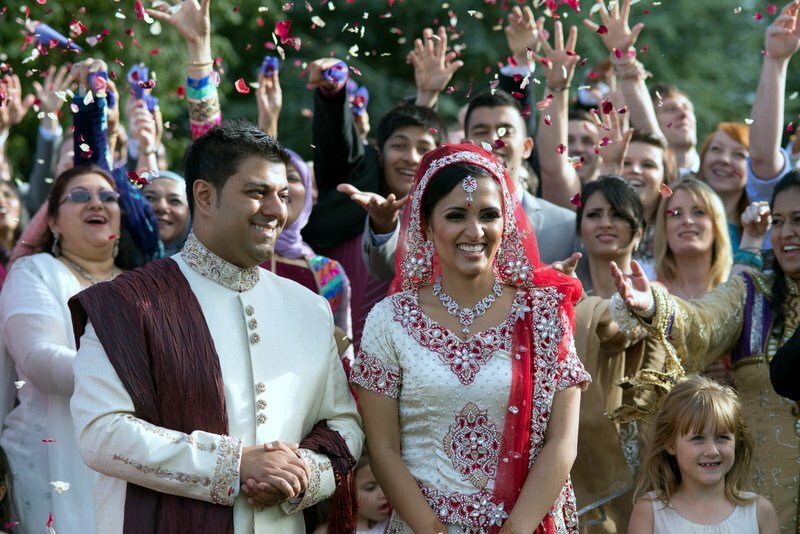 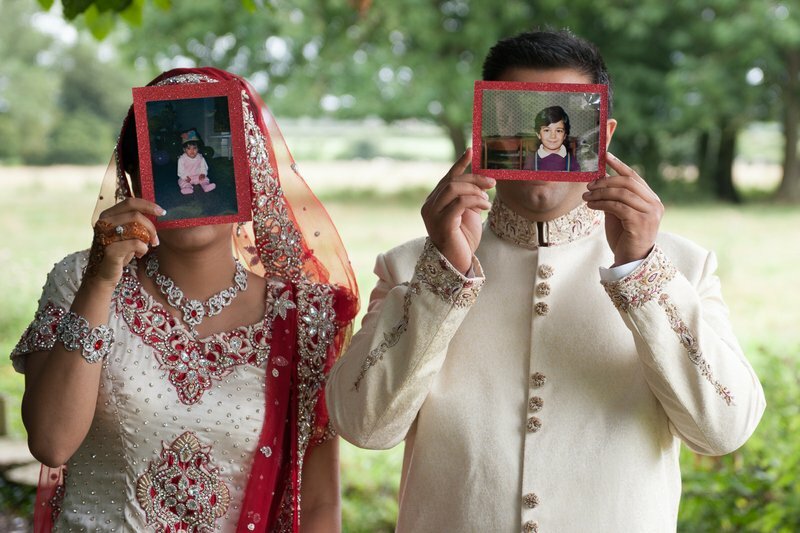 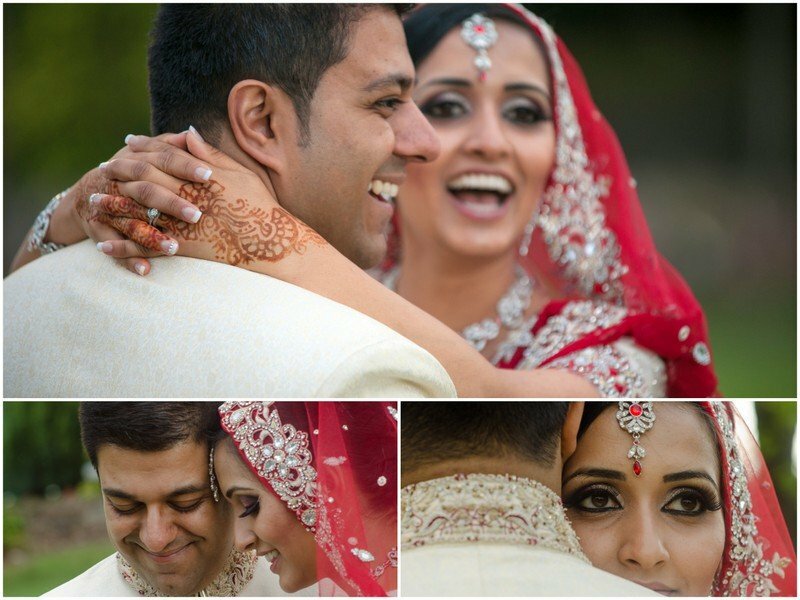 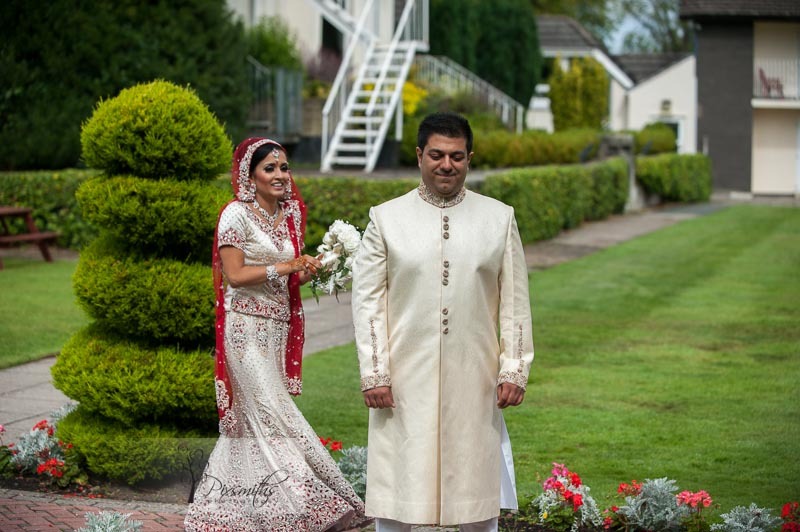 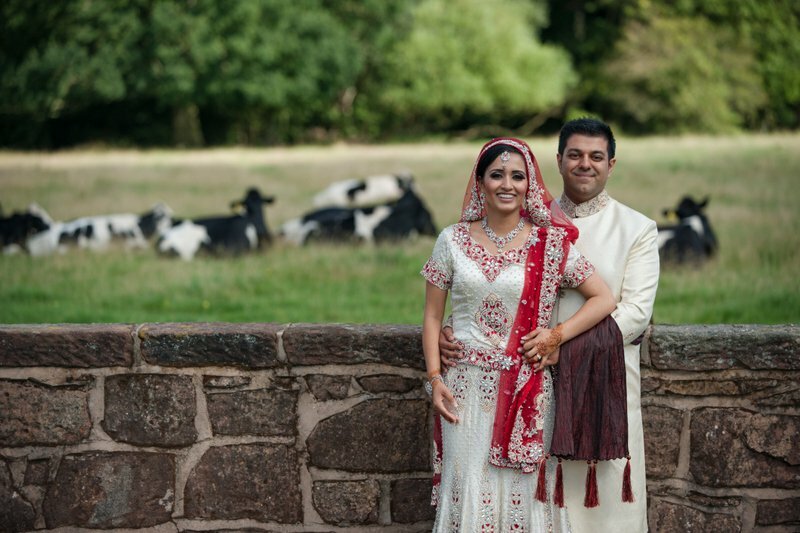 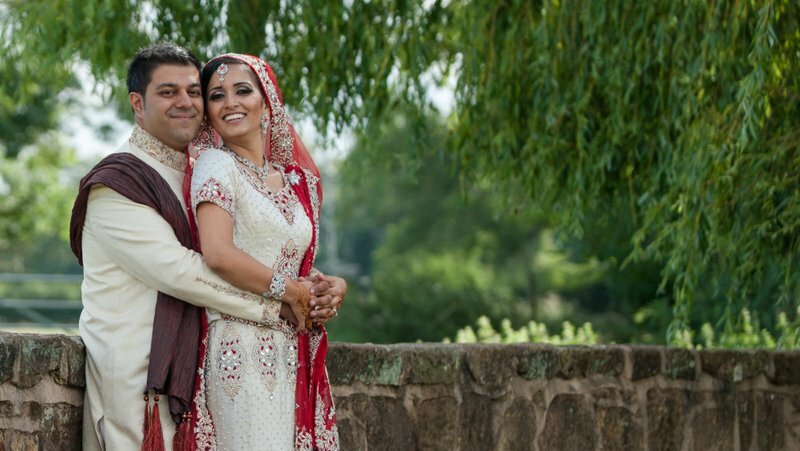 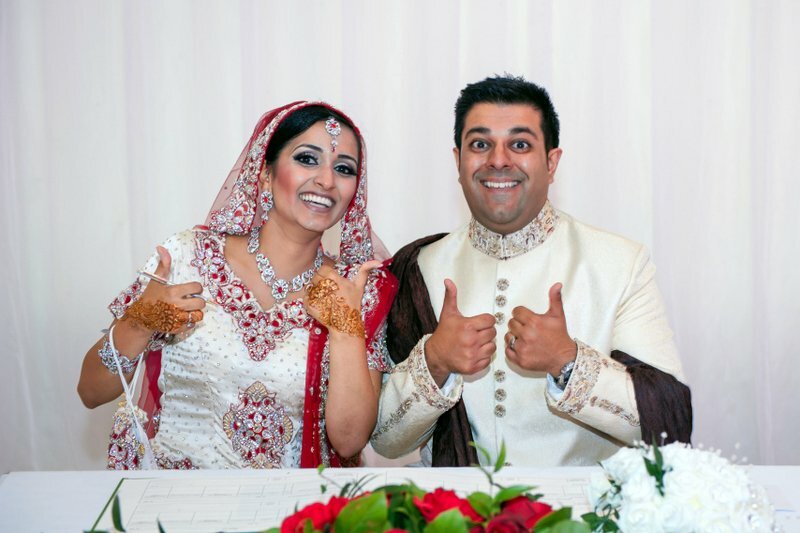 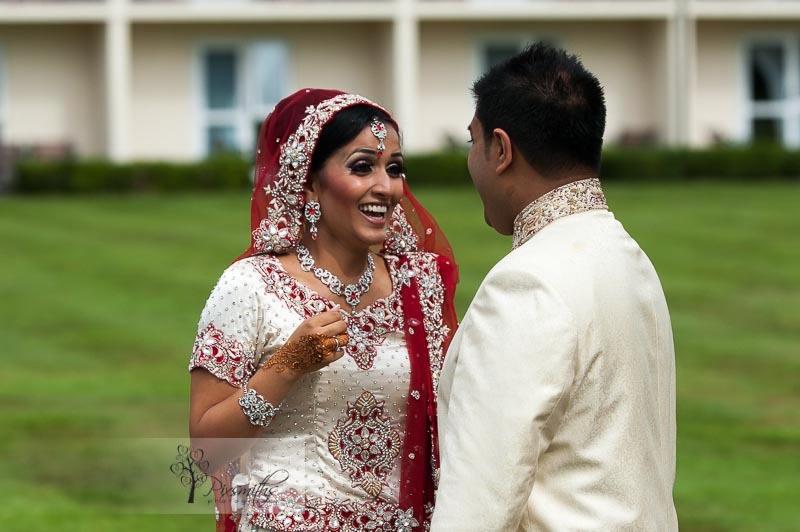 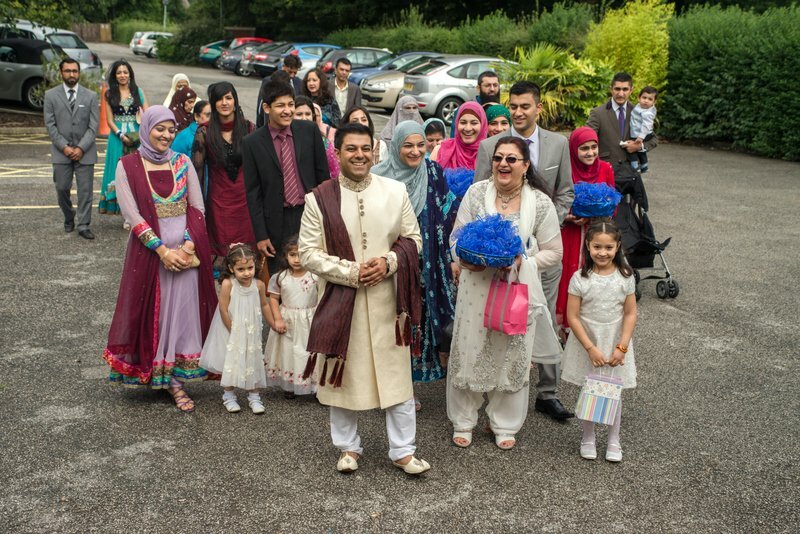 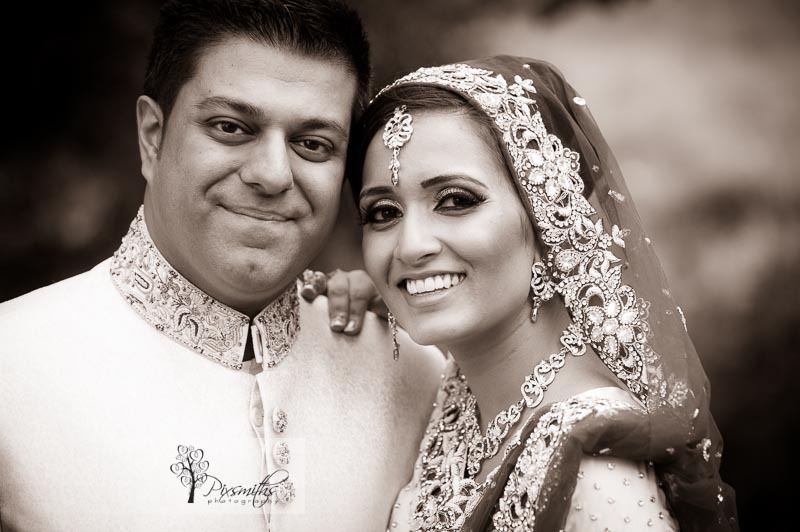 Biya and Irfan both said they felt more relaxed going into the ceremony having those those moments together first. 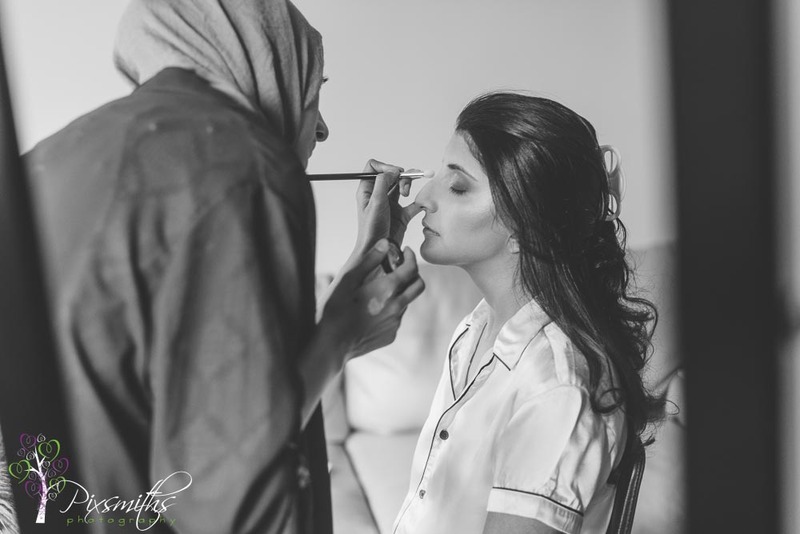 So let us share a few of their first looks …hope you enjoy!